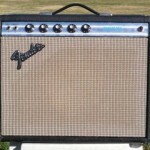 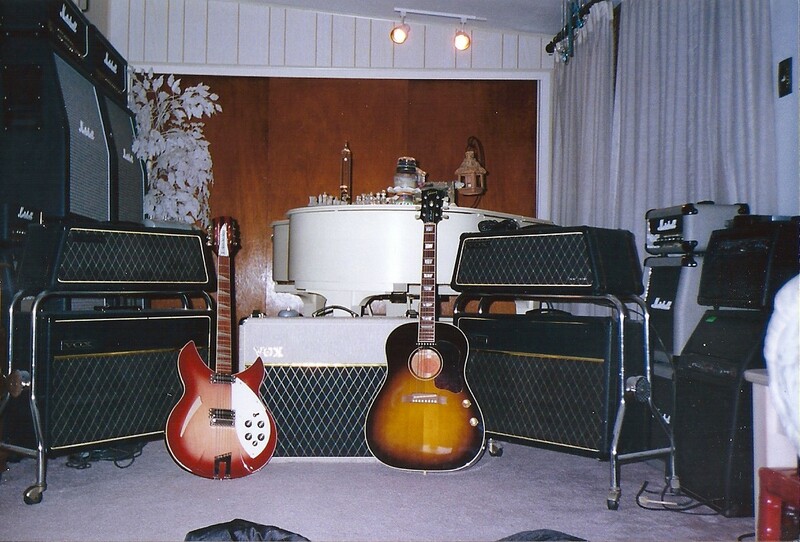 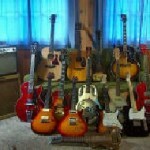 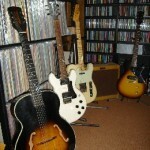 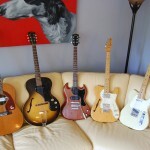 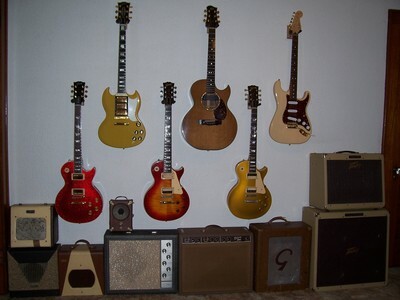 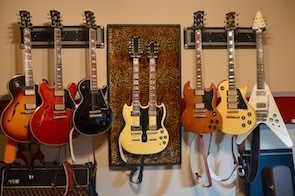 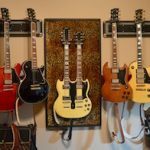 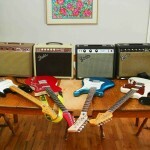 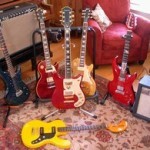 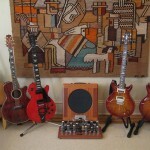 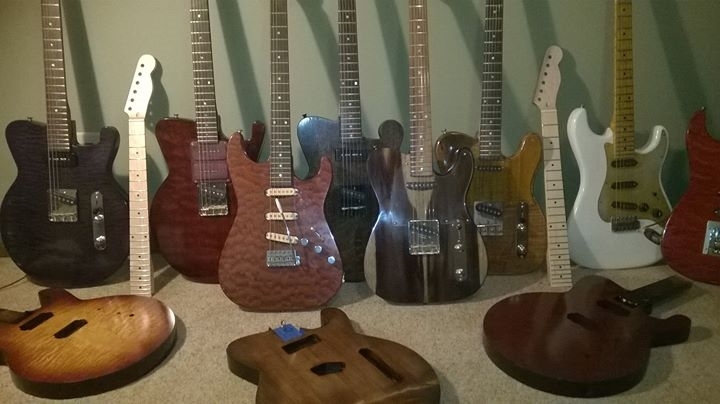 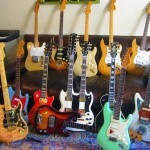 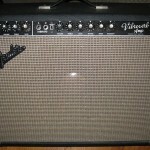 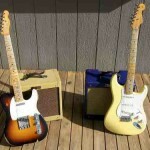 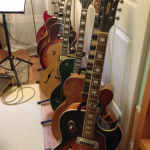 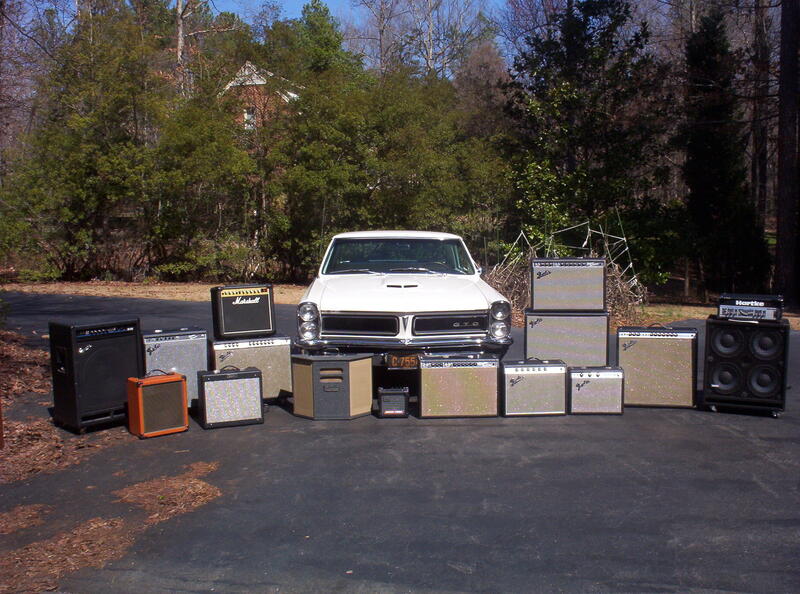 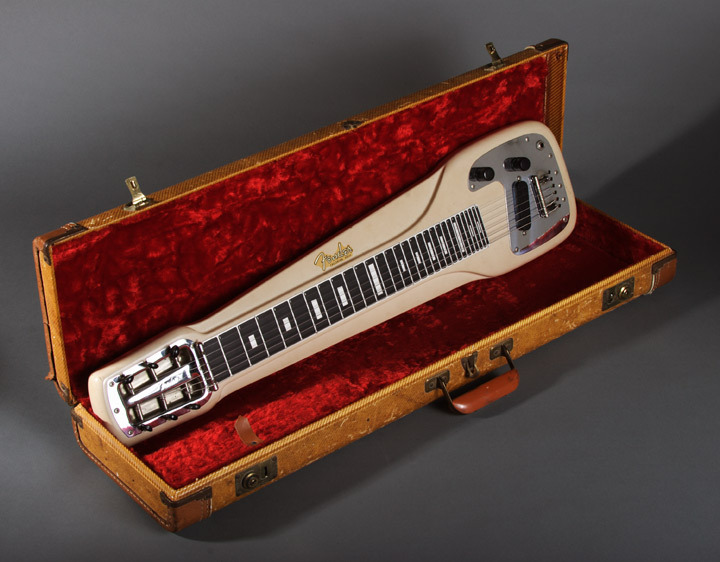 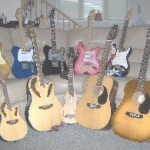 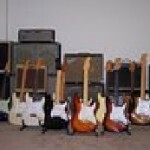 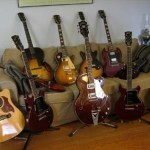 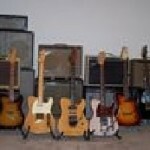 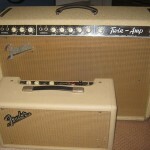 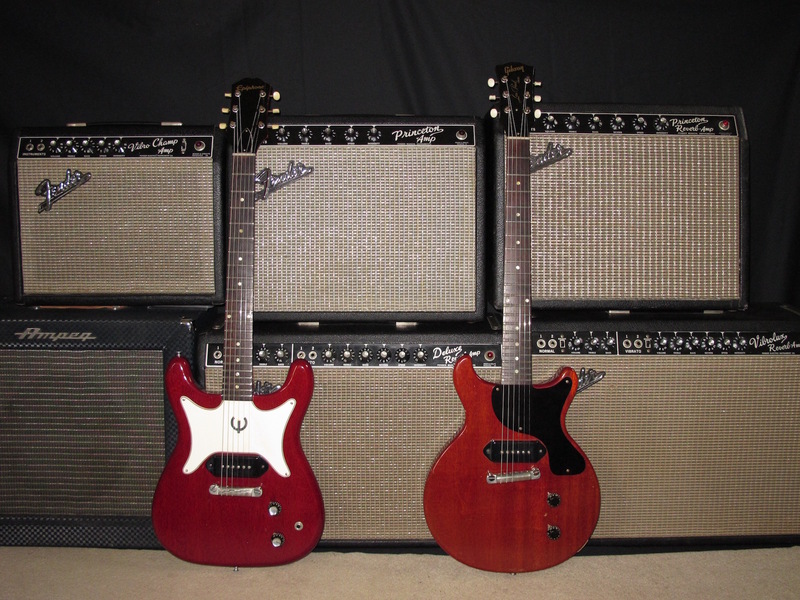 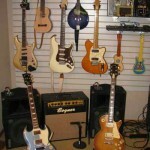 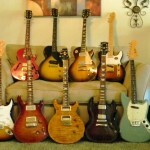 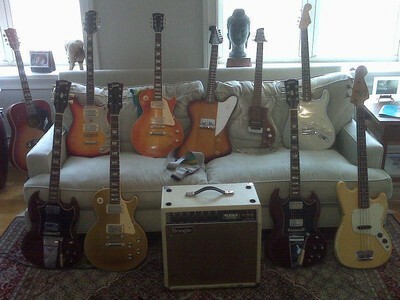 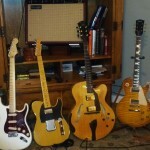 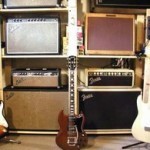 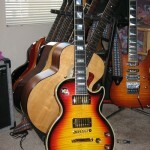 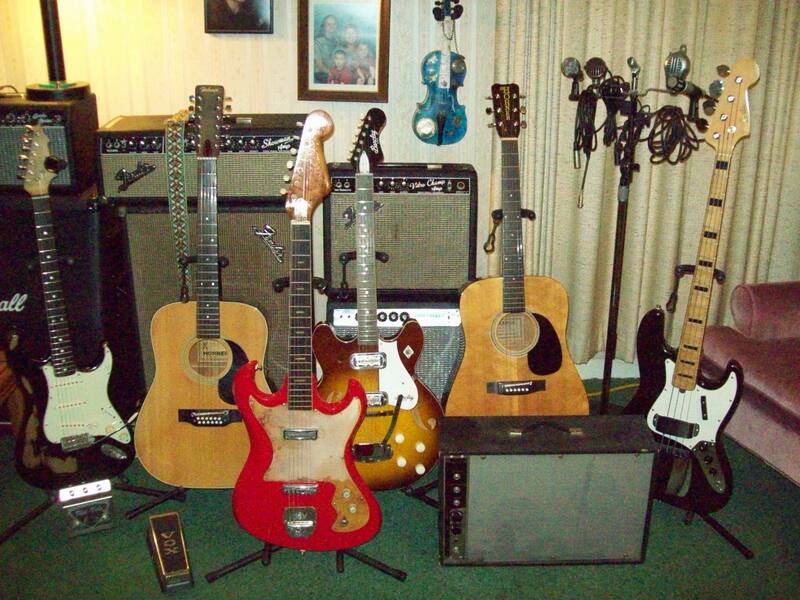 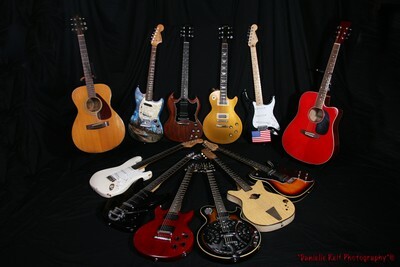 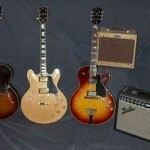 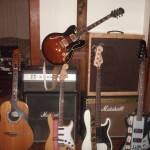 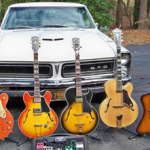 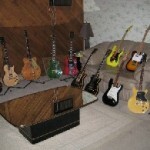 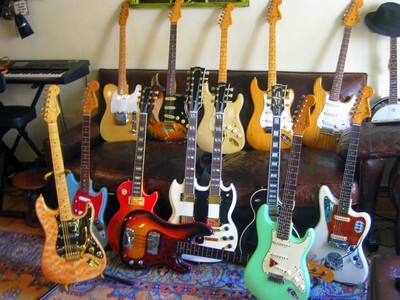 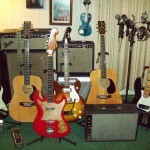 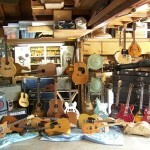 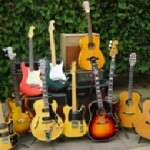 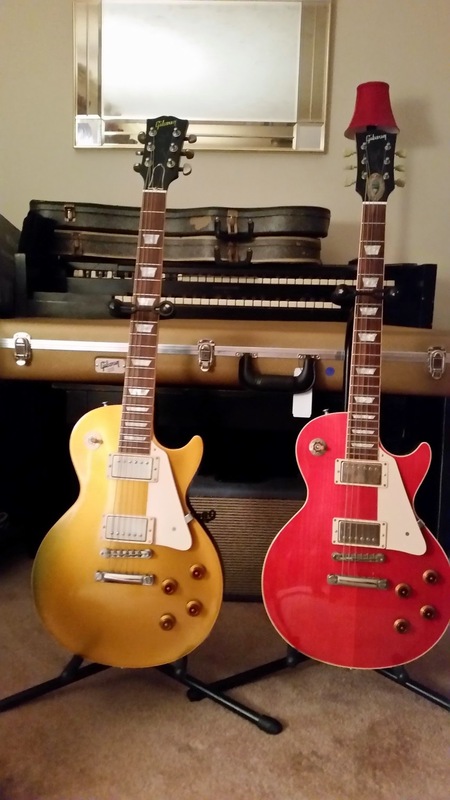 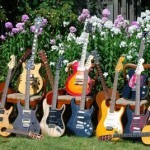 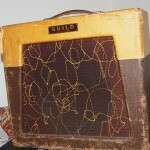 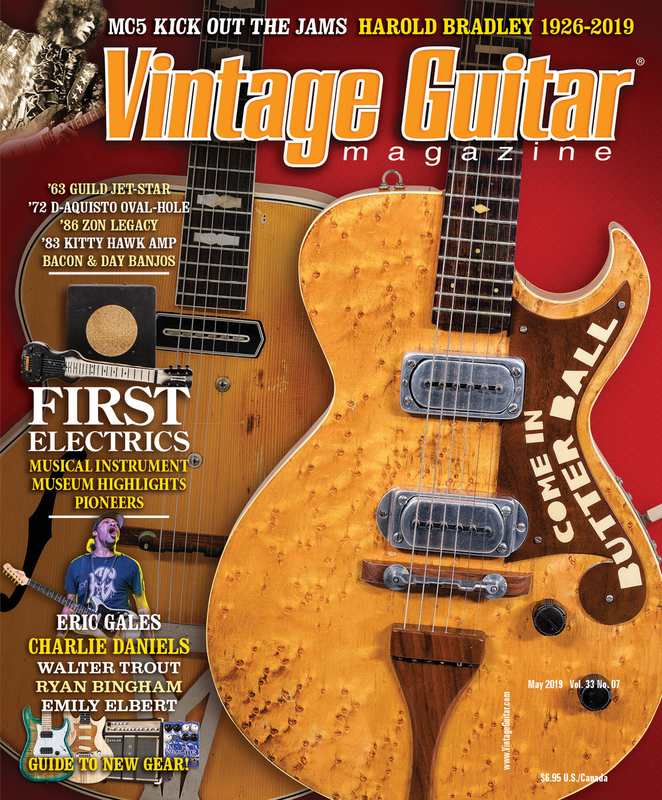 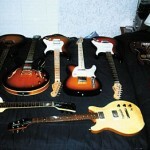 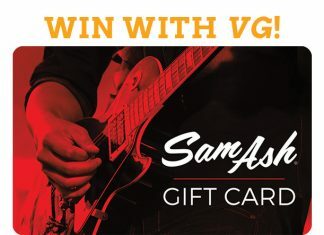 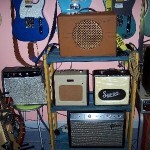 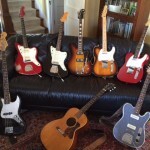 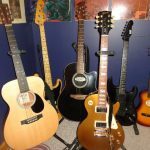 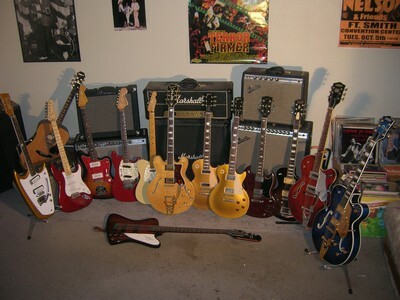 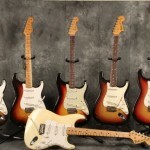 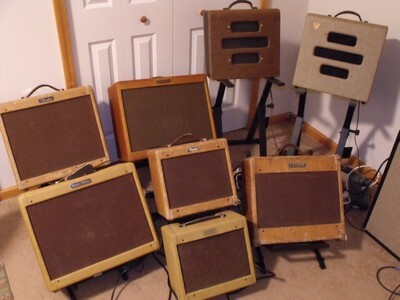 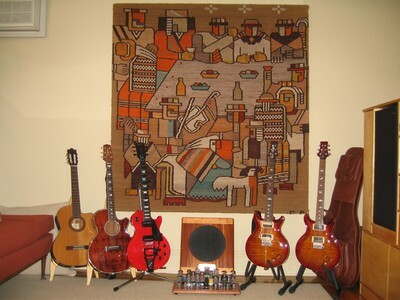 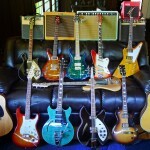 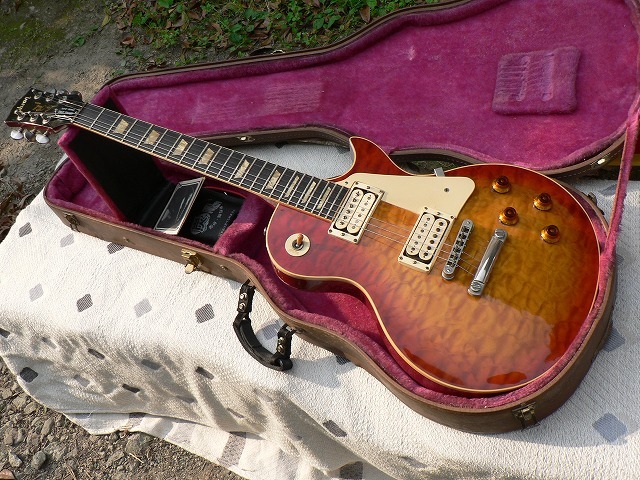 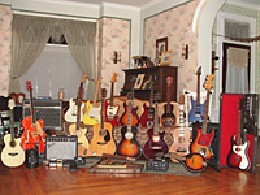 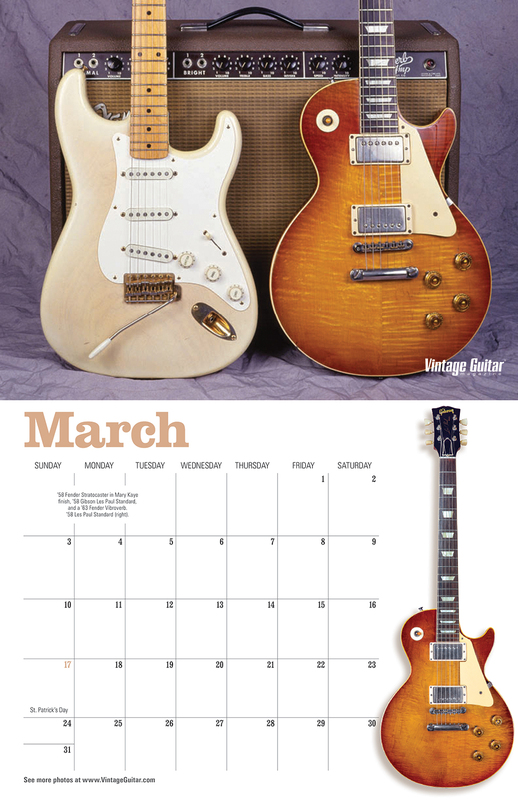 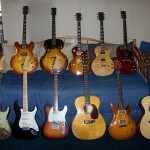 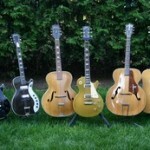 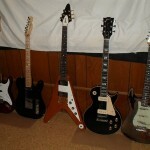 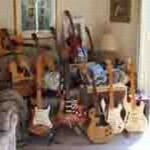 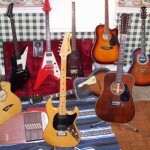 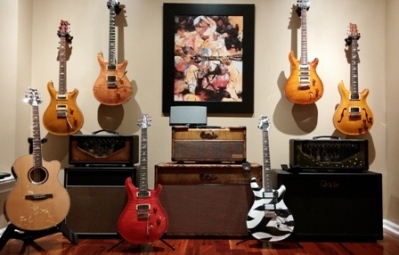 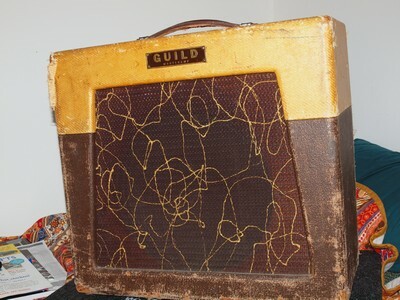 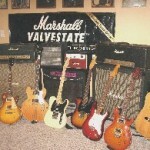 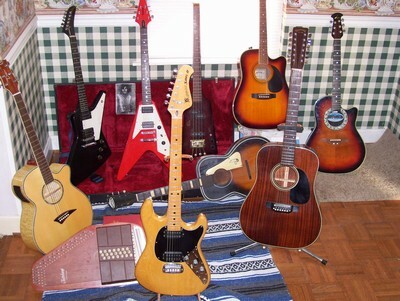 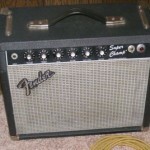 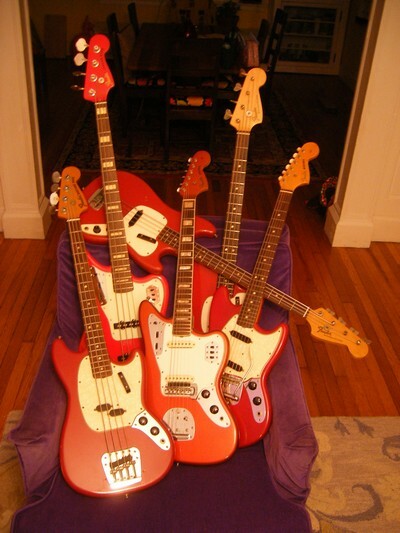 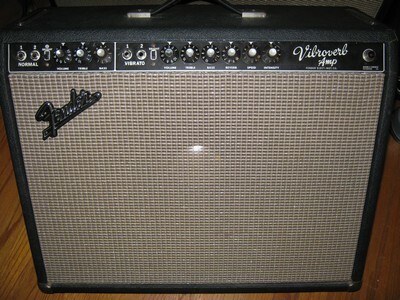 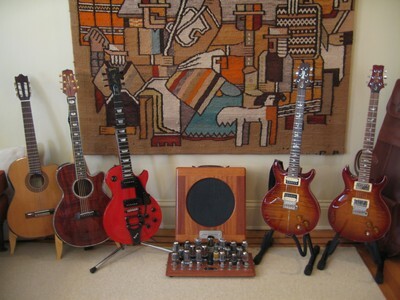 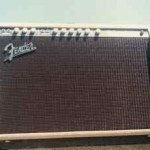 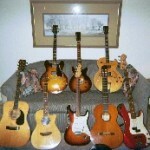 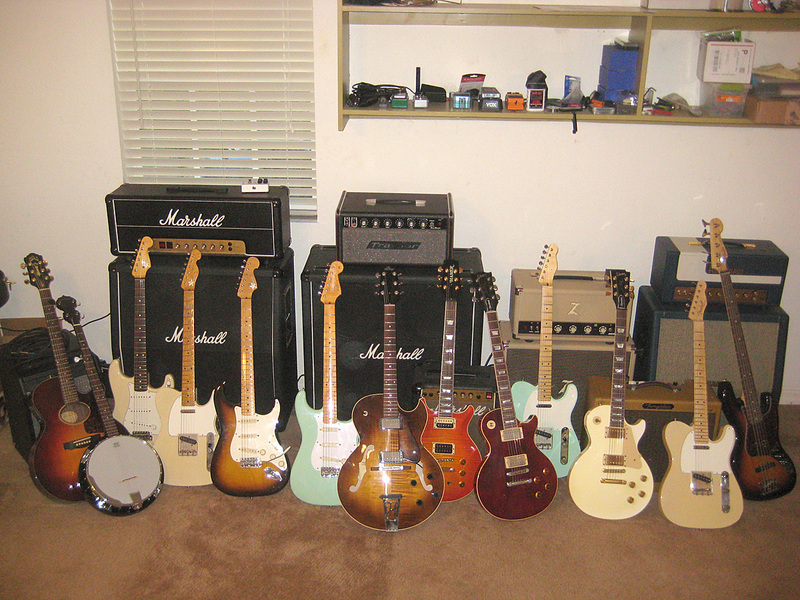 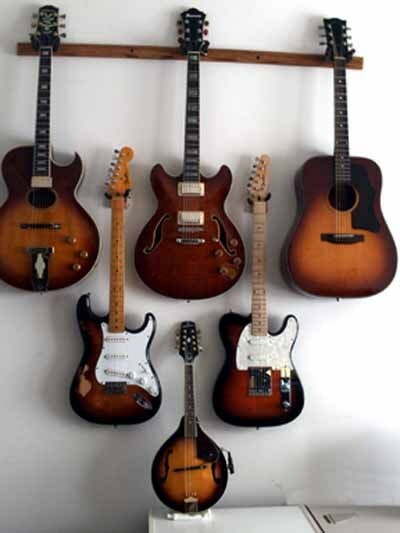 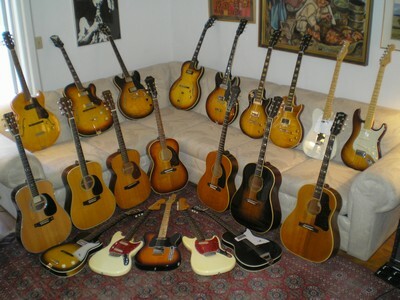 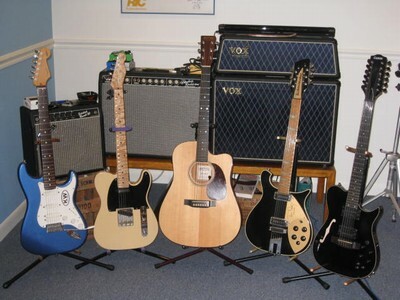 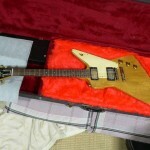 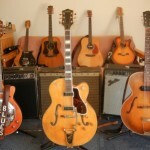 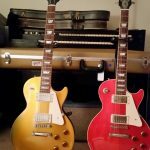 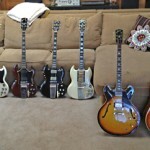 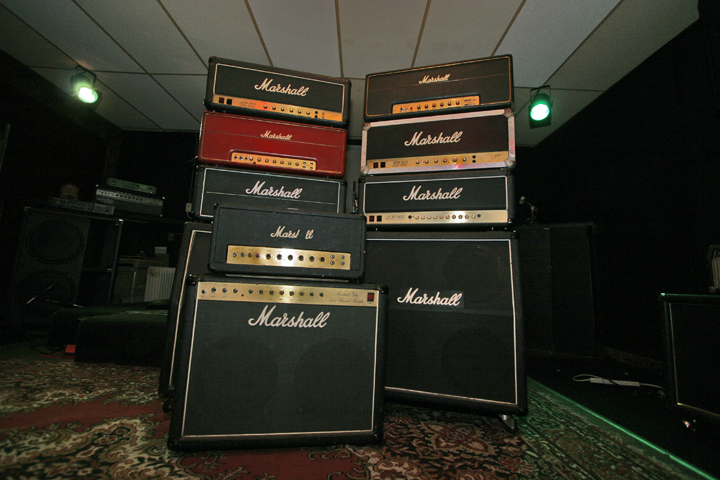 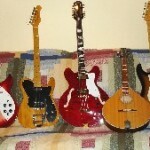 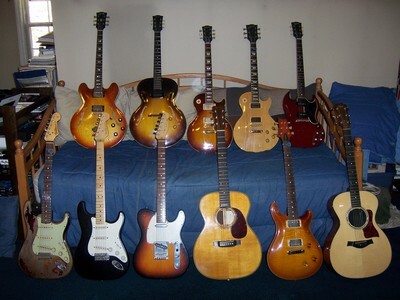 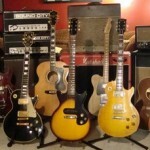 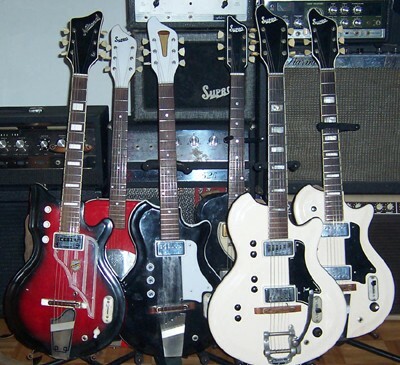 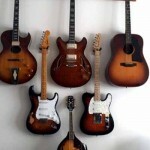 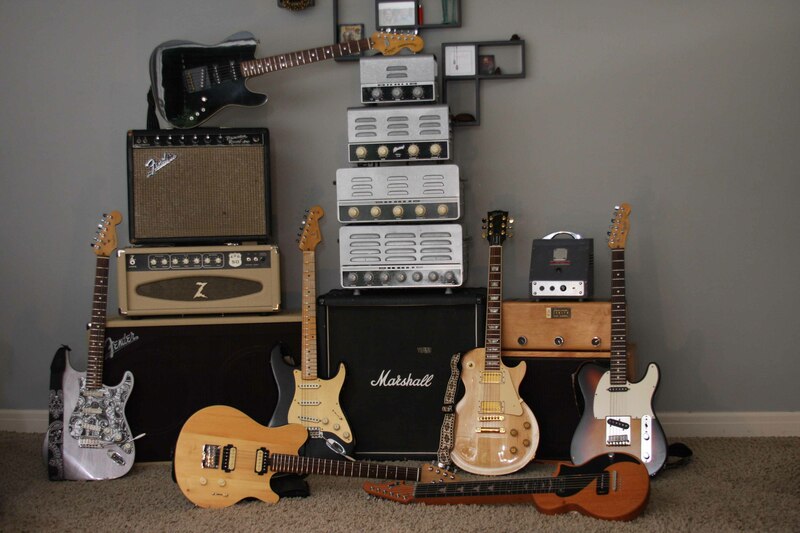 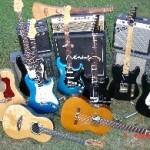 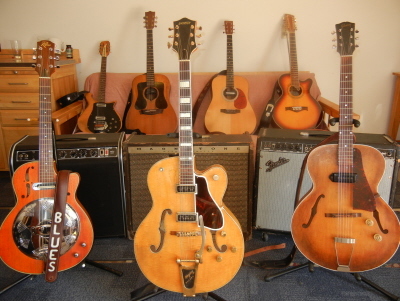 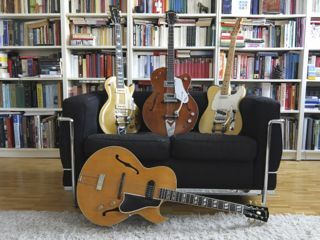 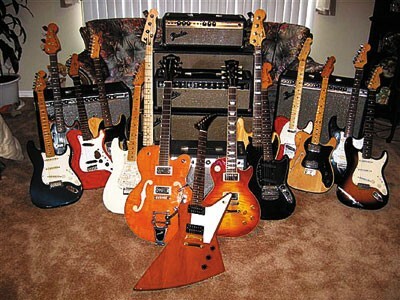 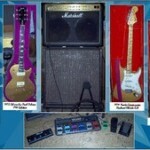 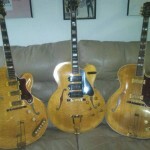 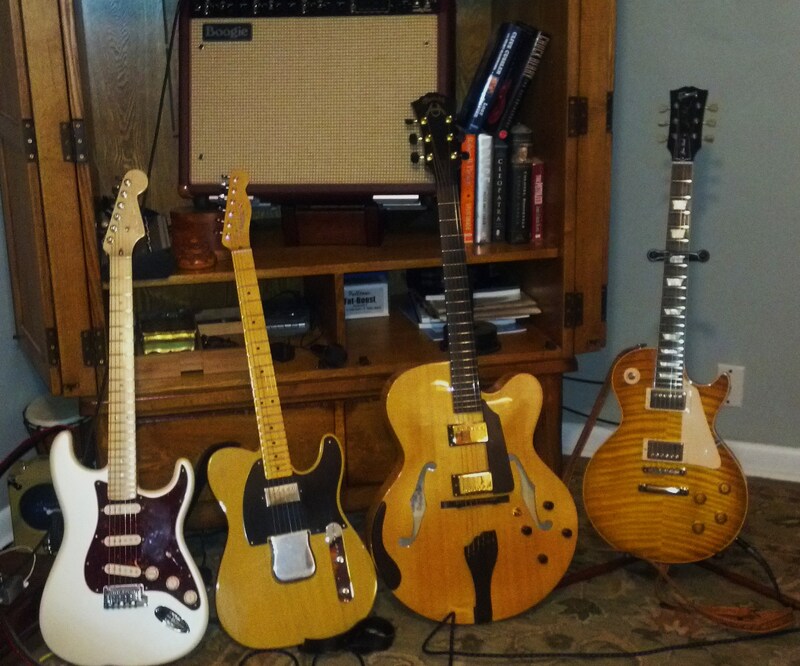 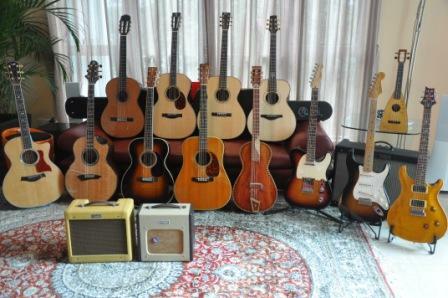 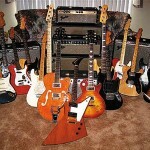 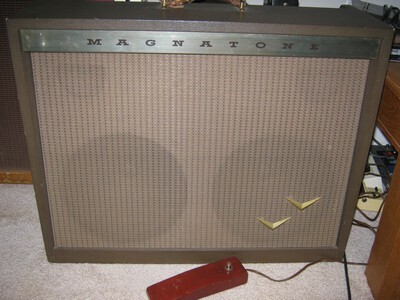 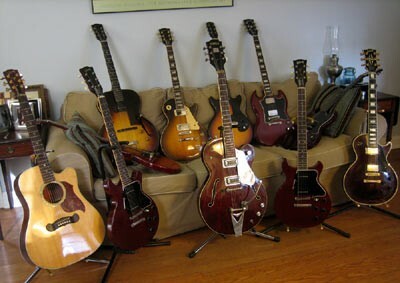 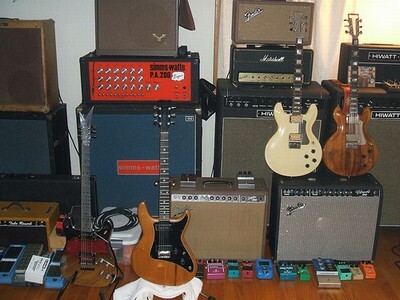 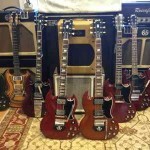 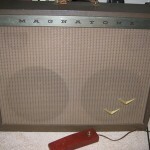 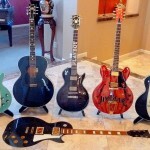 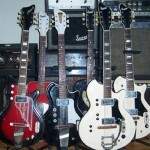 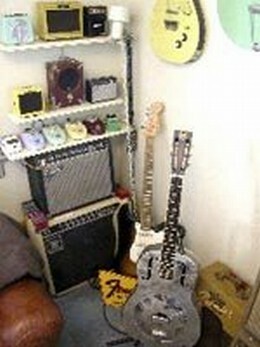 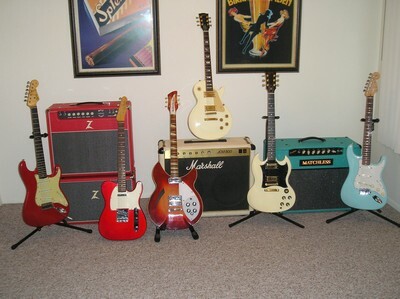 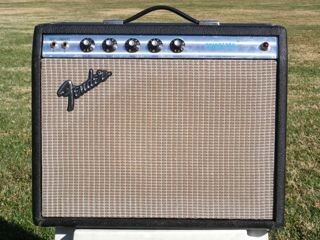 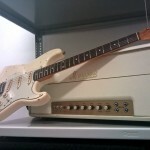 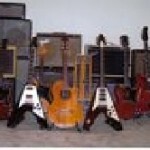 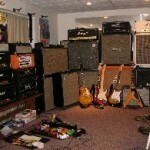 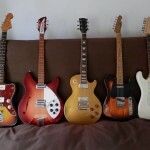 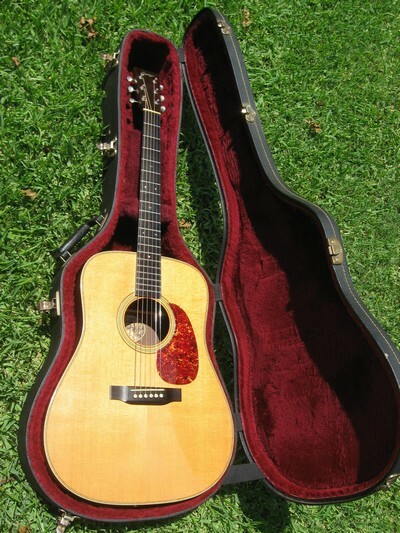 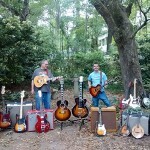 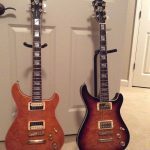 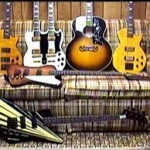 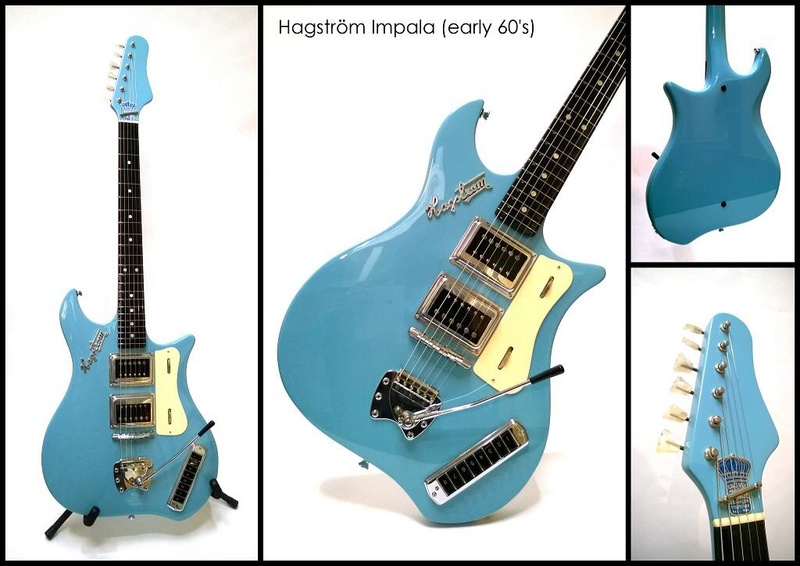 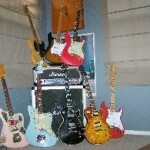 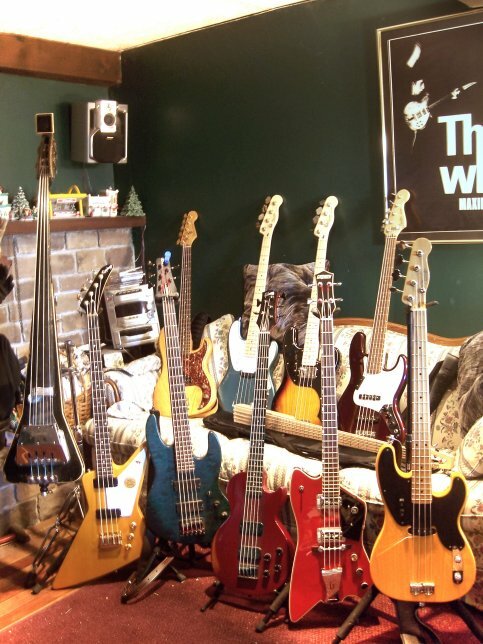 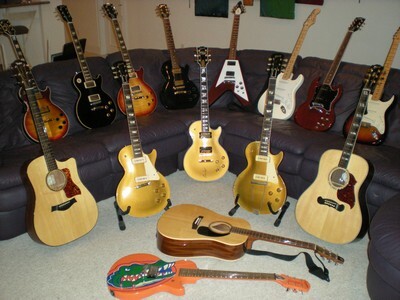 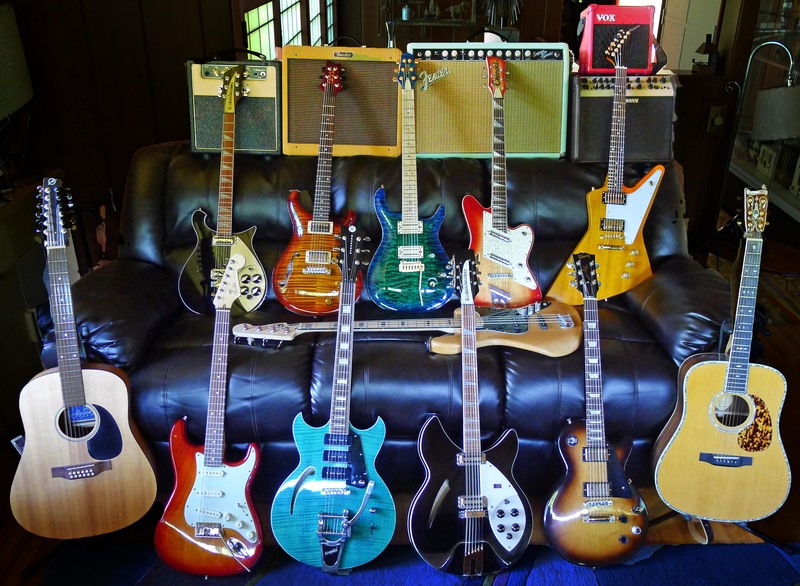 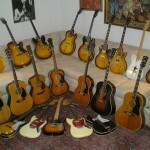 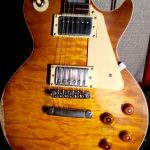 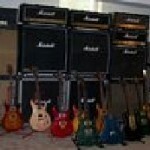 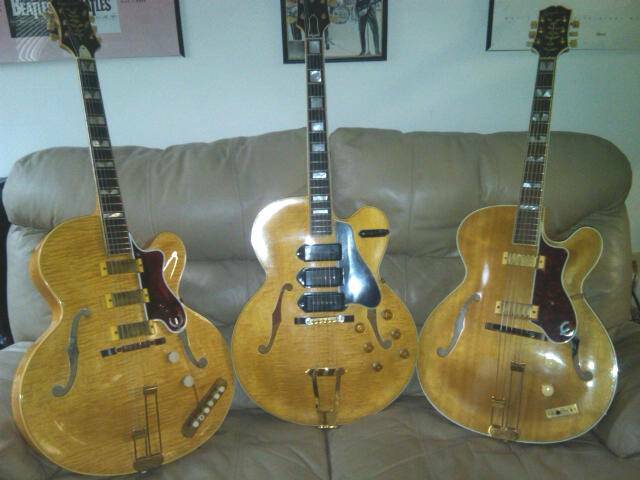 Welcome to Vintage Guitar magazine’s online Readers Gallery, the best place to show off your gear to guitar lovers worldwide. 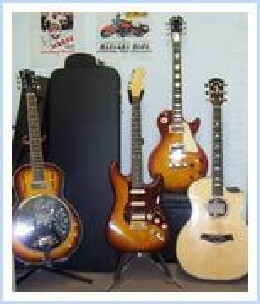 Click on any photo to see more details. 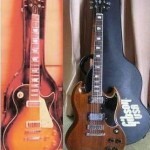 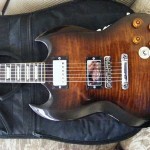 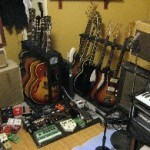 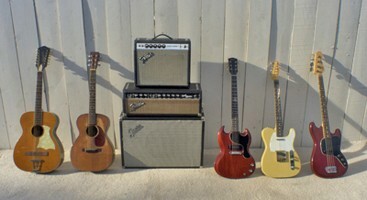 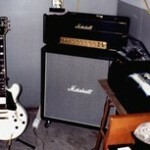 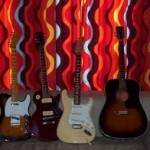 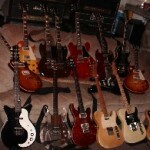 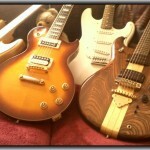 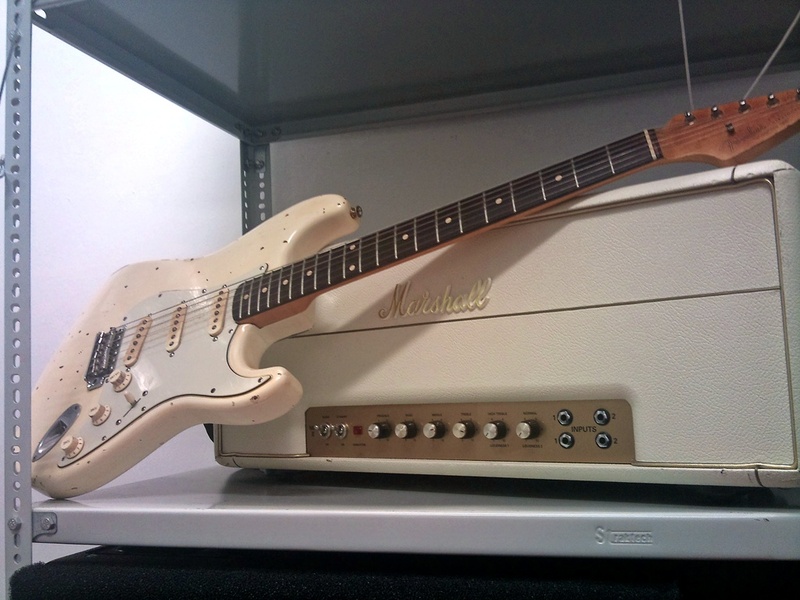 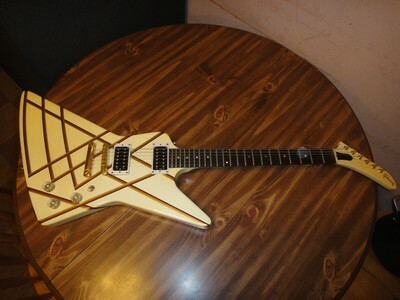 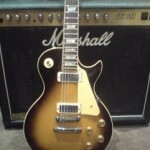 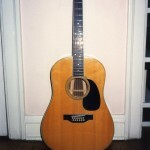 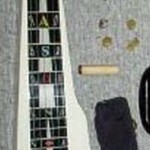 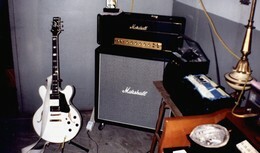 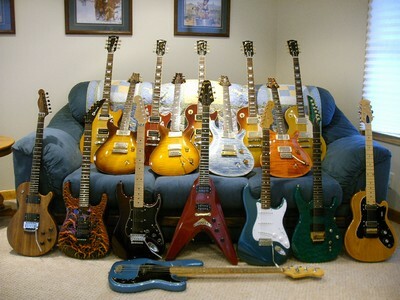 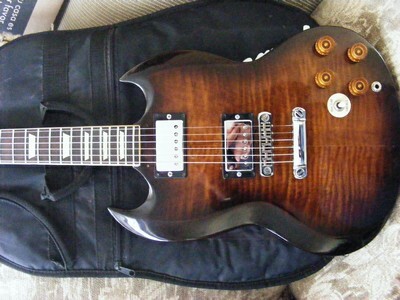 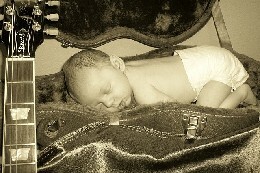 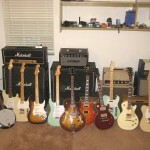 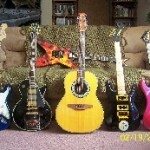 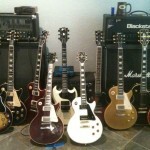 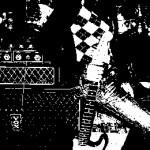 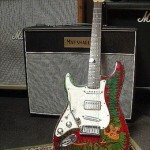 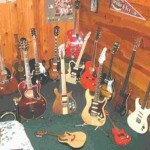 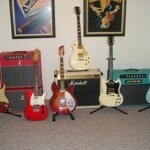 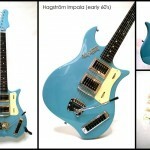 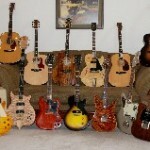 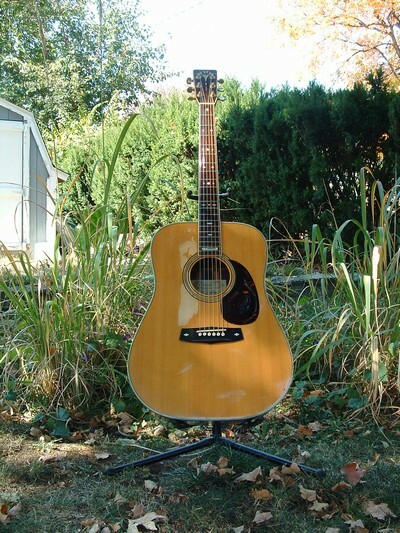 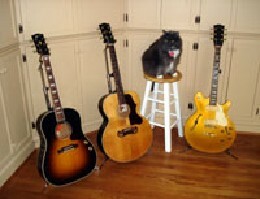 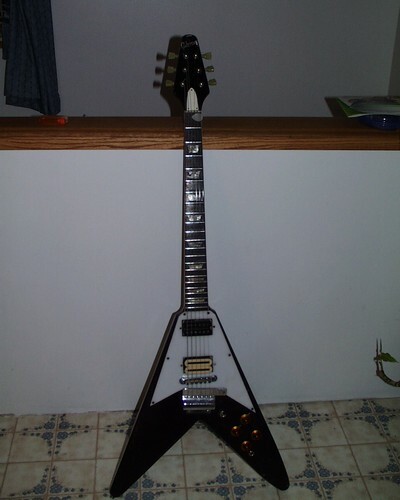 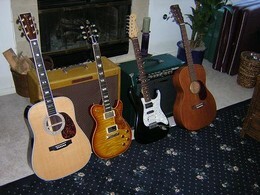 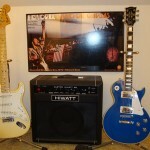 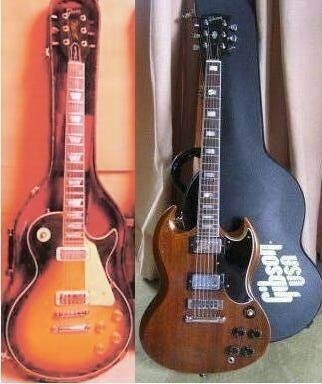 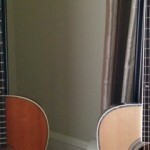 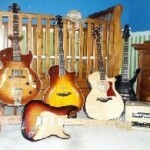 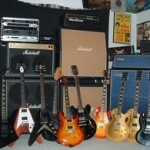 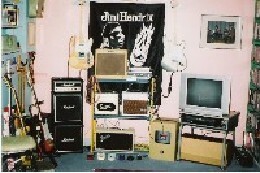 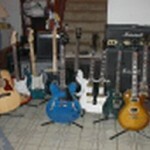 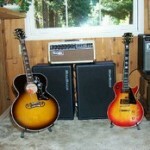 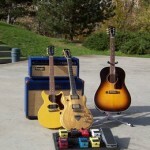 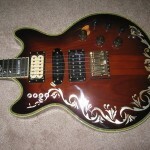 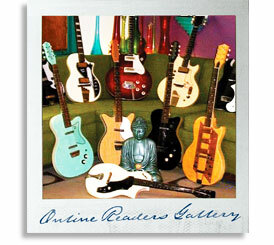 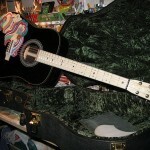 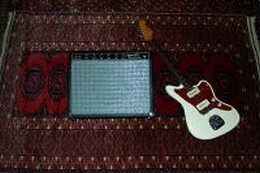 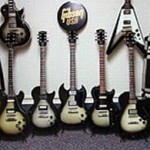 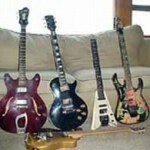 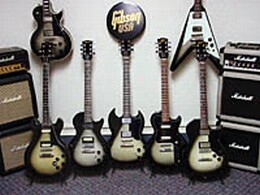 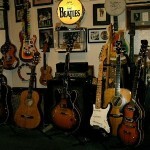 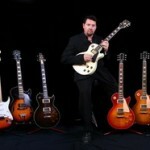 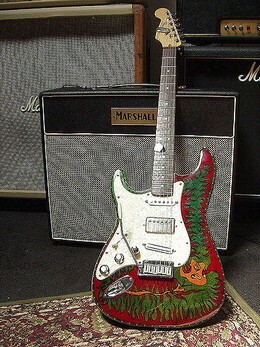 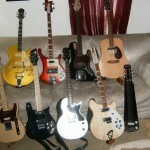 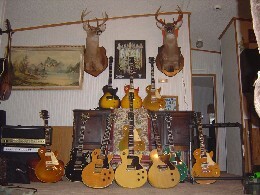 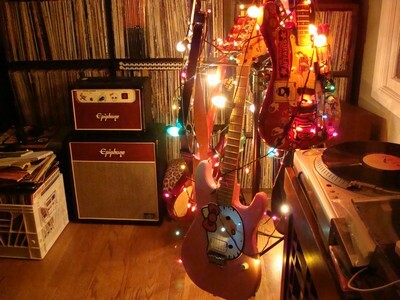 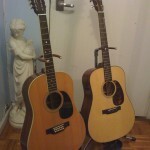 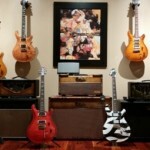 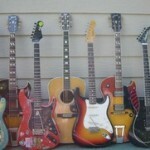 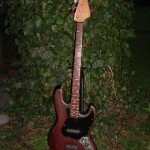 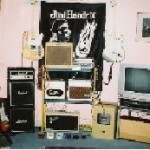 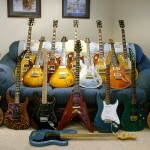 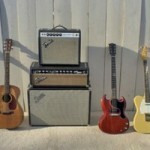 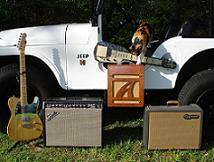 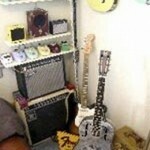 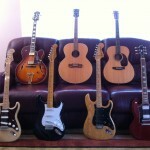 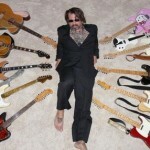 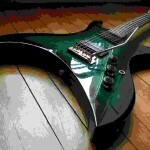 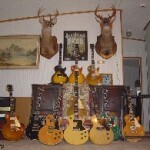 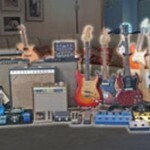 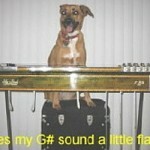 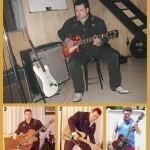 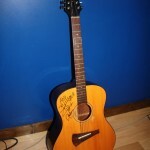 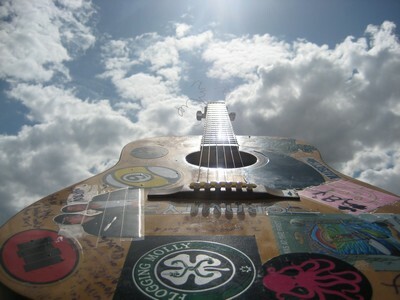 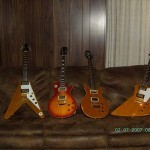 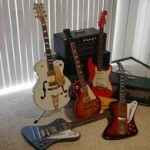 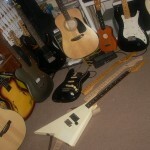 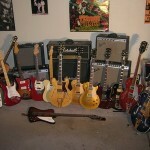 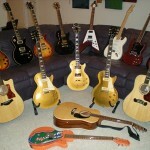 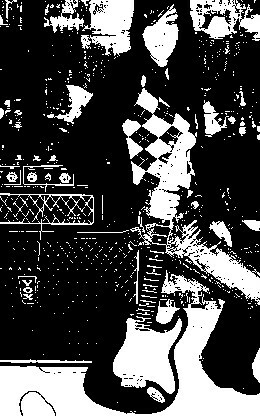 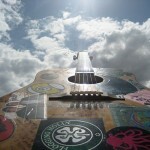 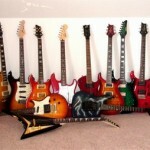 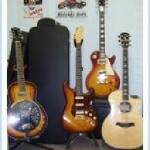 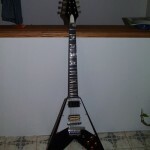 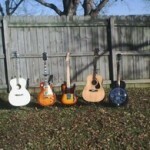 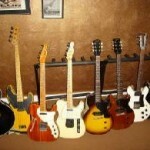 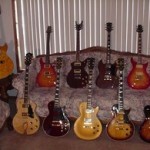 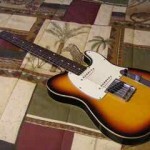 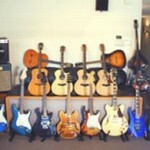 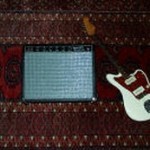 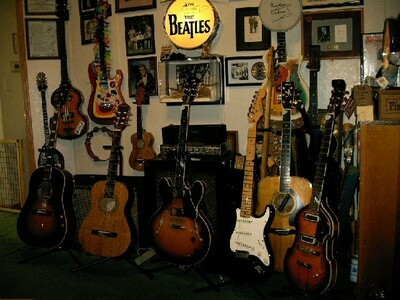 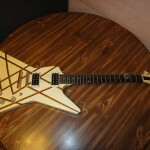 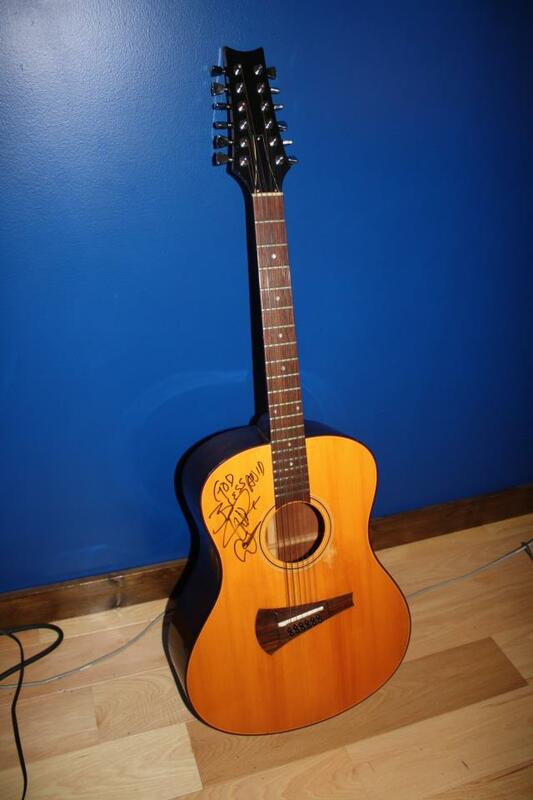 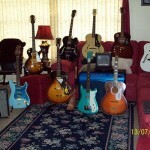 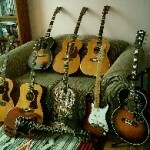 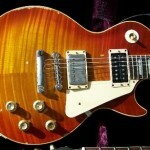 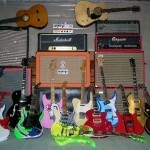 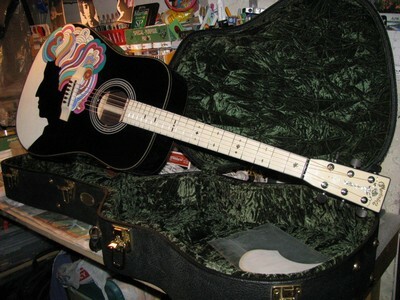 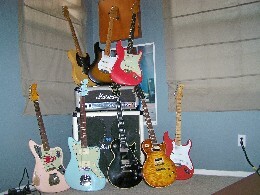 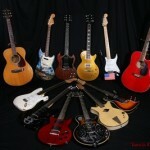 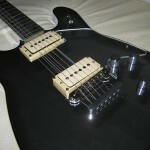 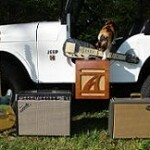 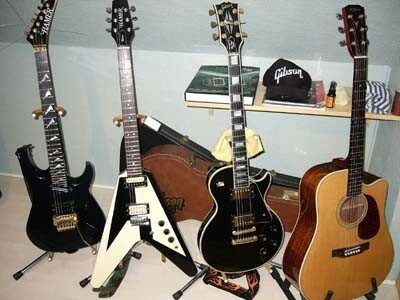 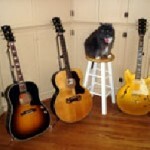 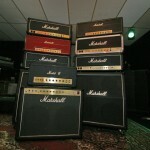 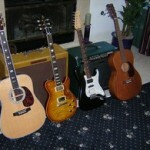 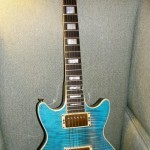 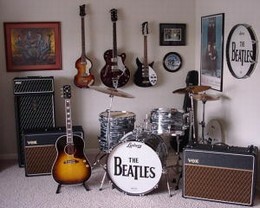 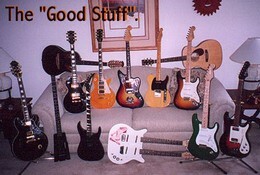 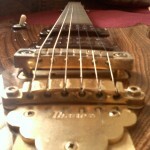 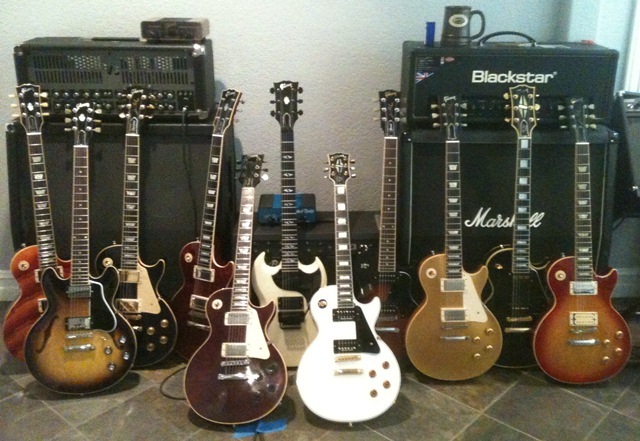 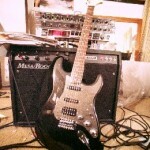 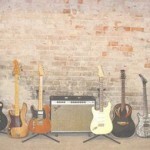 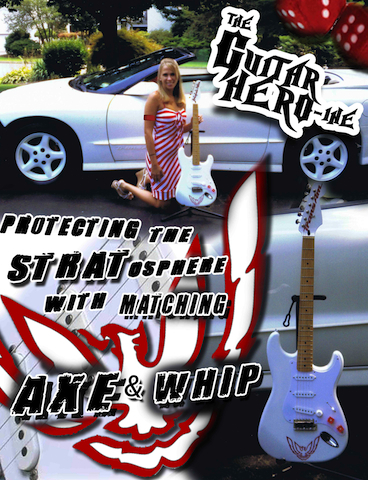 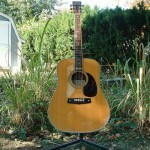 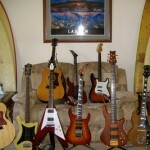 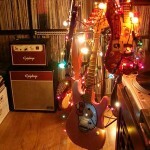 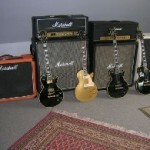 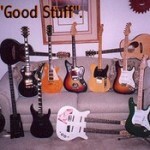 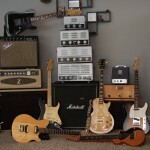 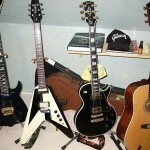 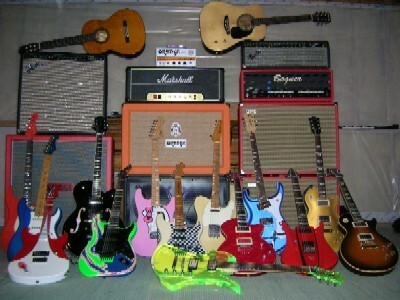 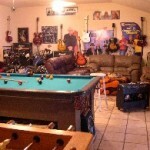 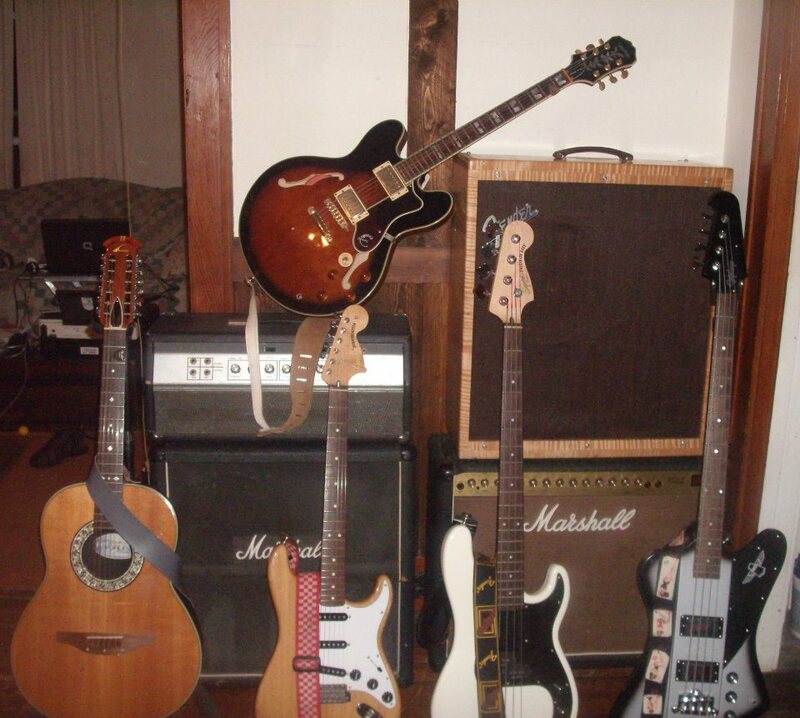 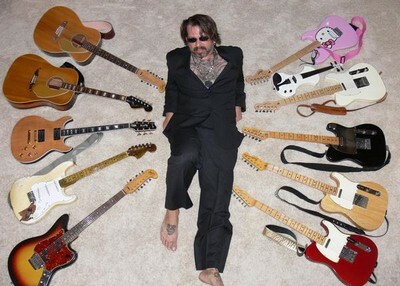 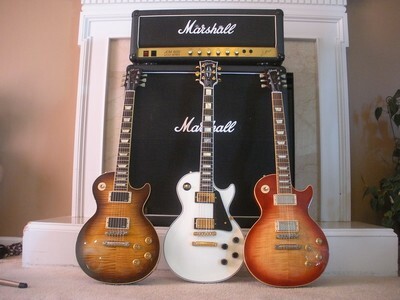 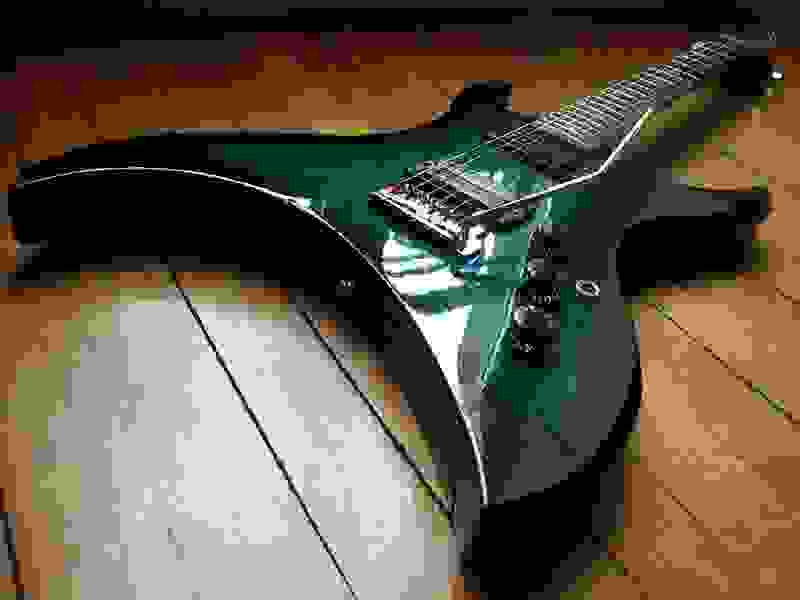 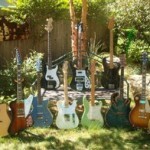 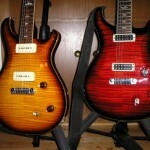 Upload your favorite guitar photos! 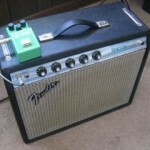 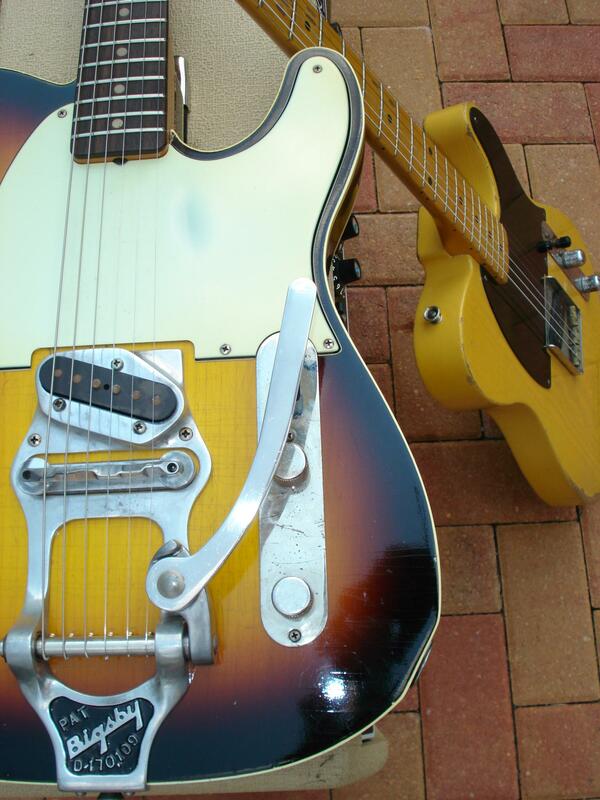 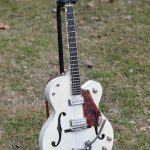 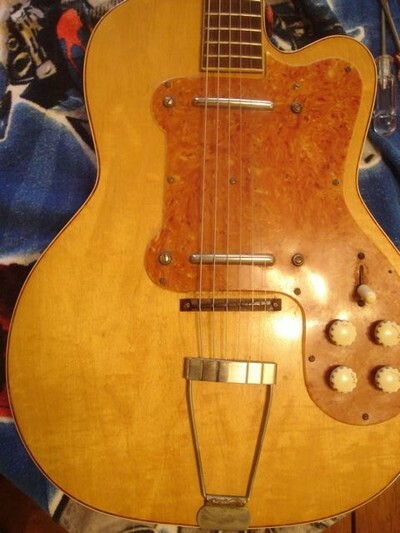 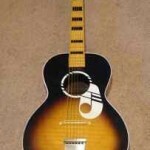 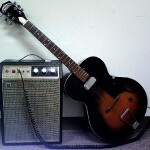 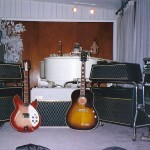 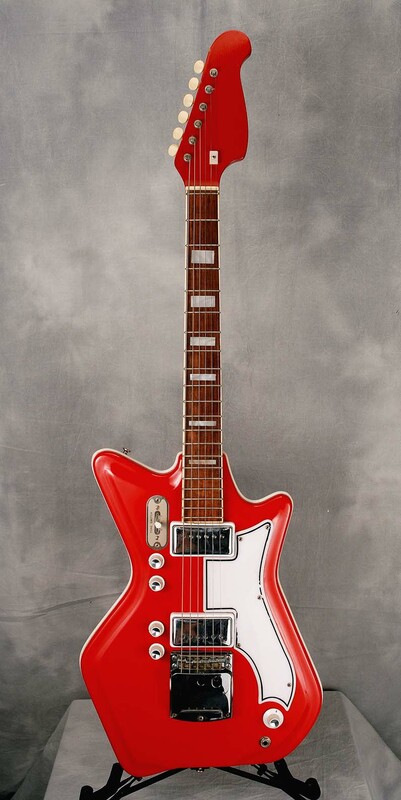 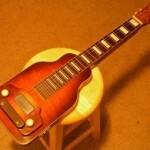 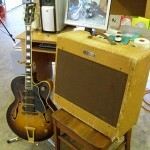 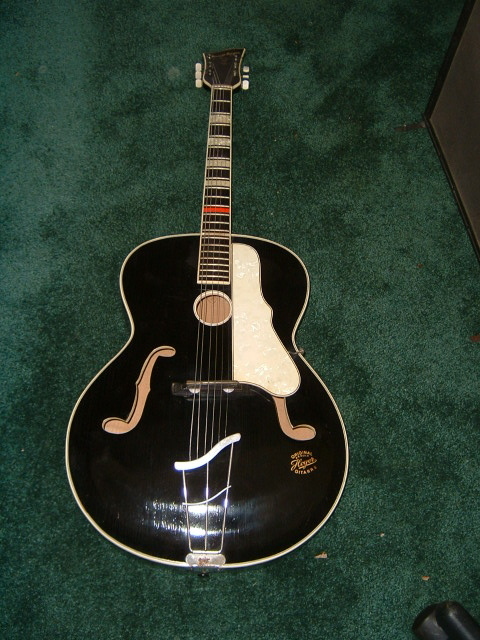 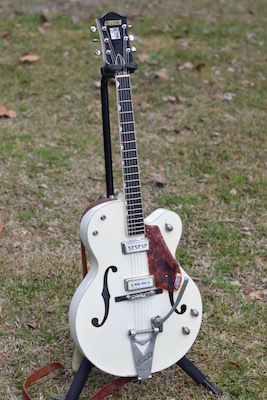 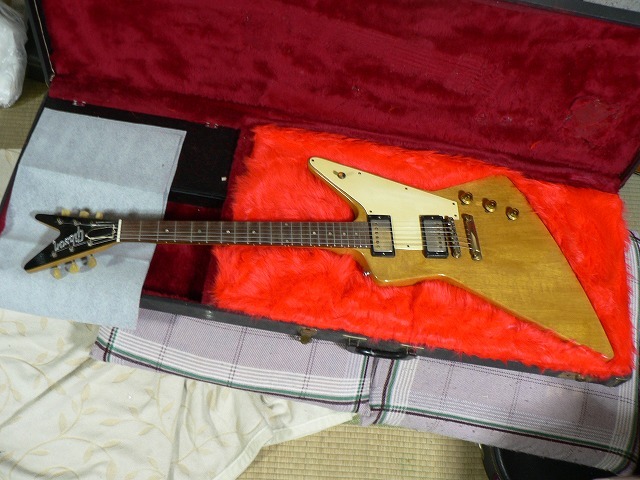 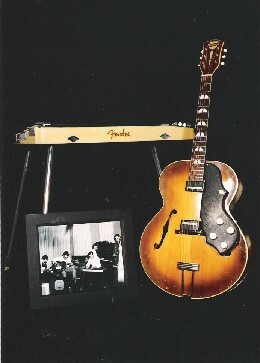 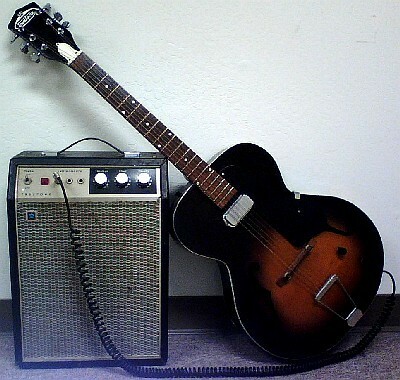 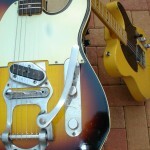 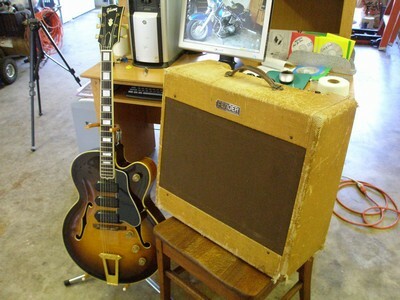 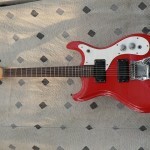 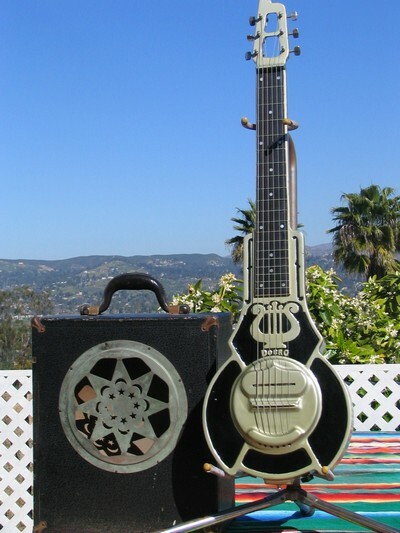 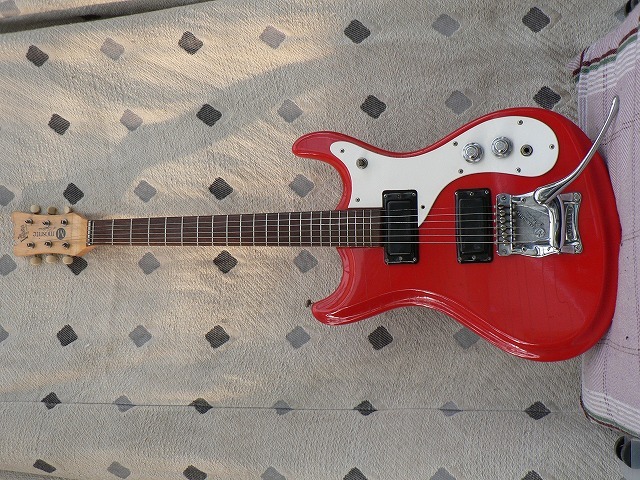 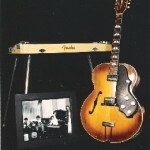 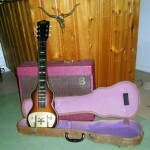 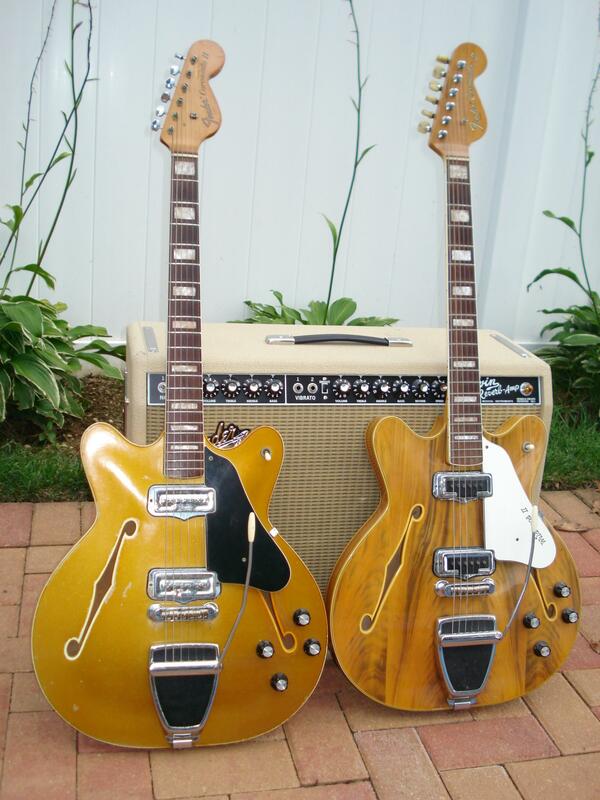 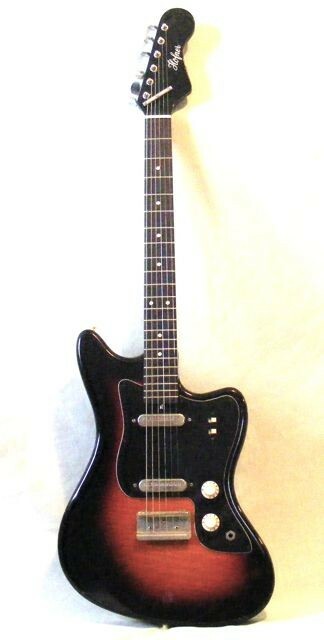 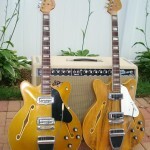 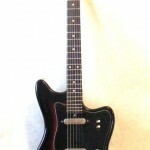 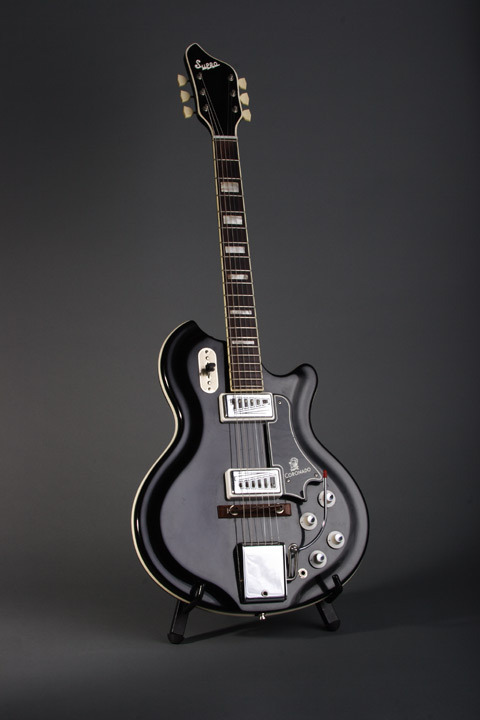 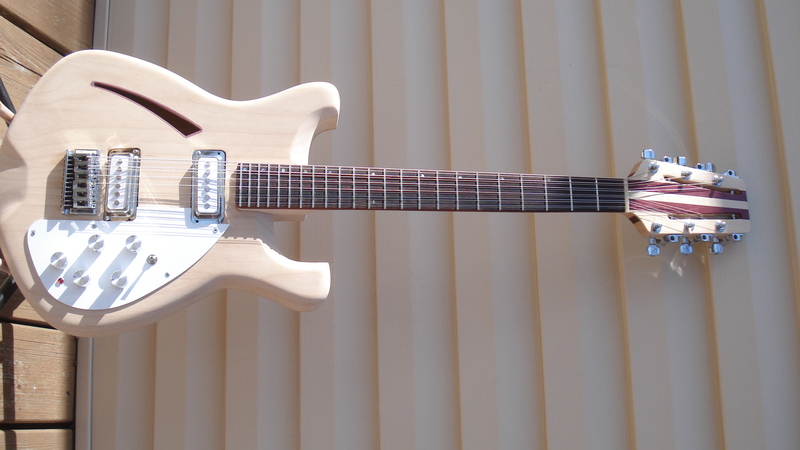 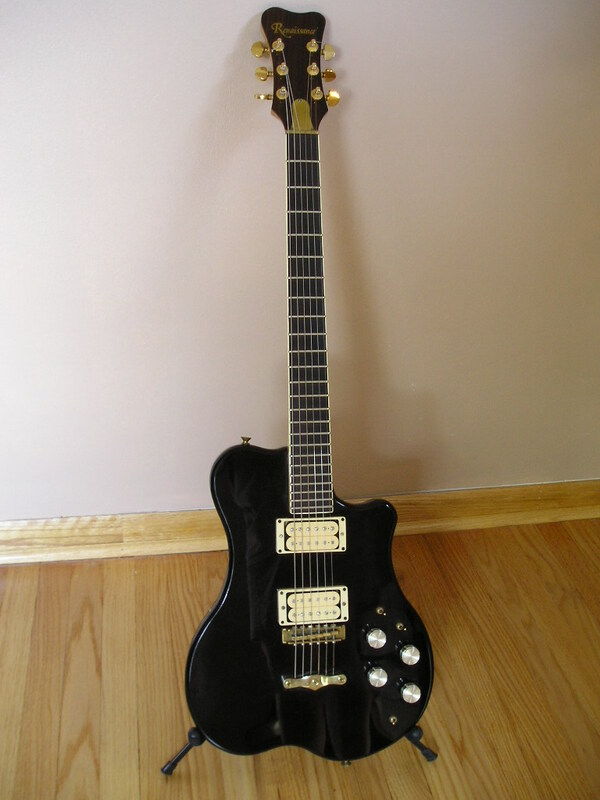 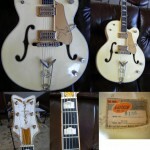 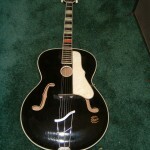 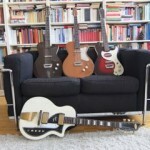 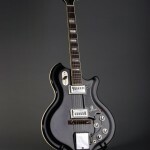 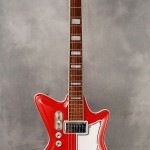 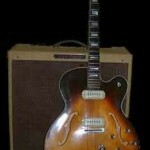 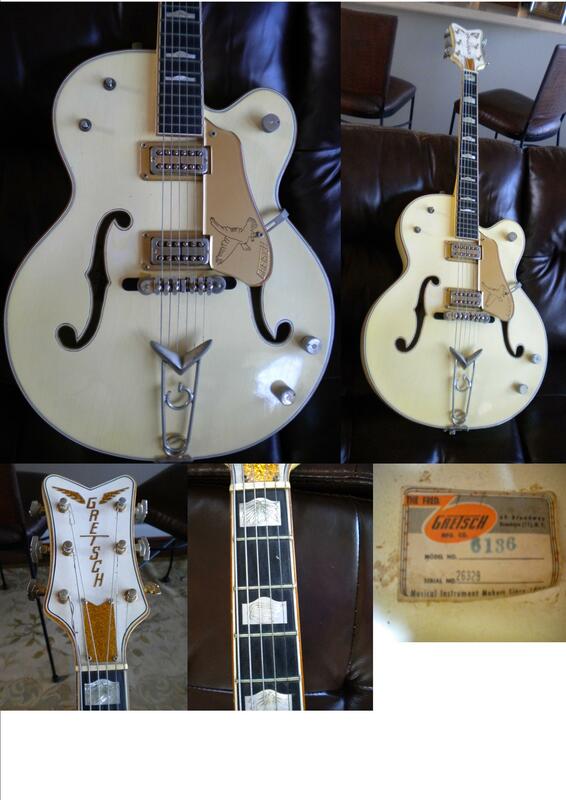 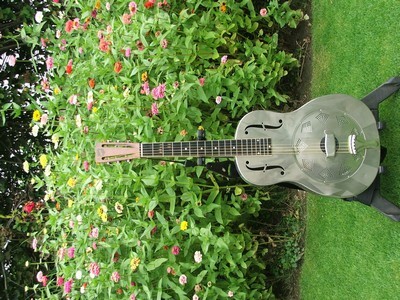 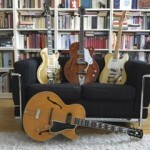 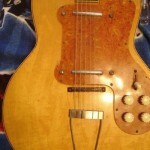 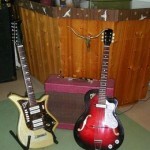 1961 Gretsch: From Trash to Terrific! 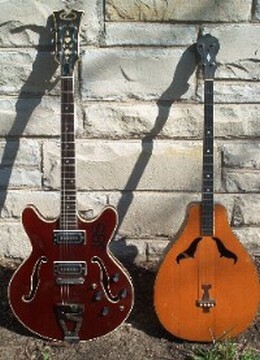 Serial #’s 067 & 2971. 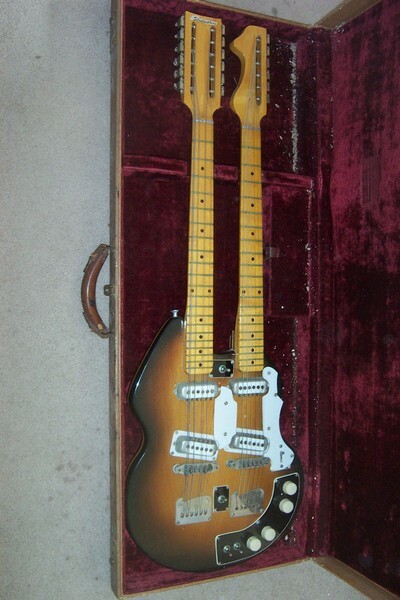 I had no idea only 78 were sold. 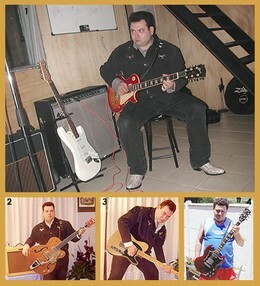 I have owned 3. 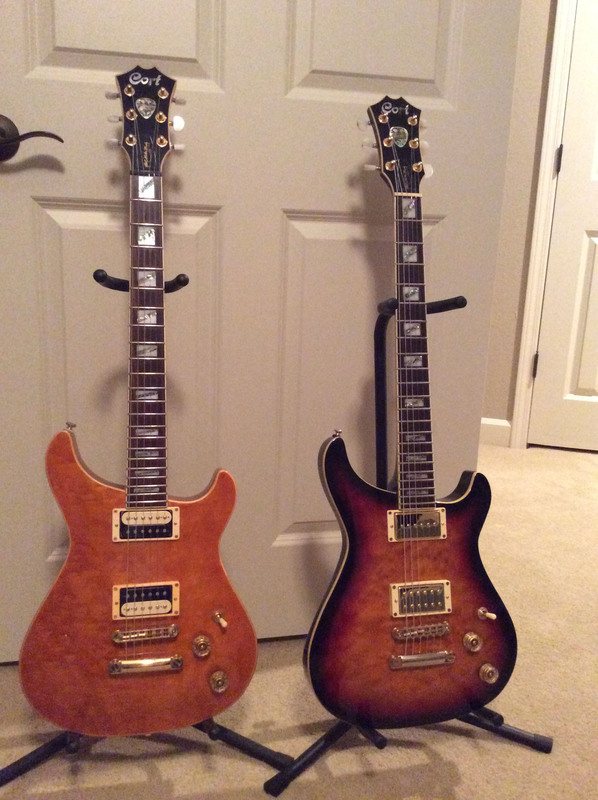 Anyone able to date them? 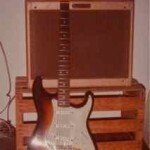 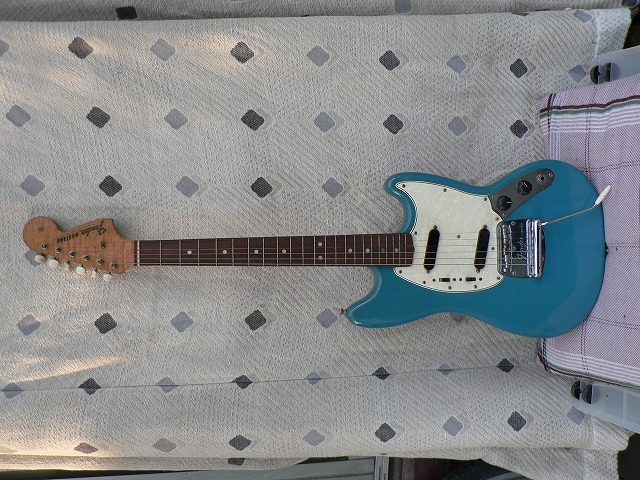 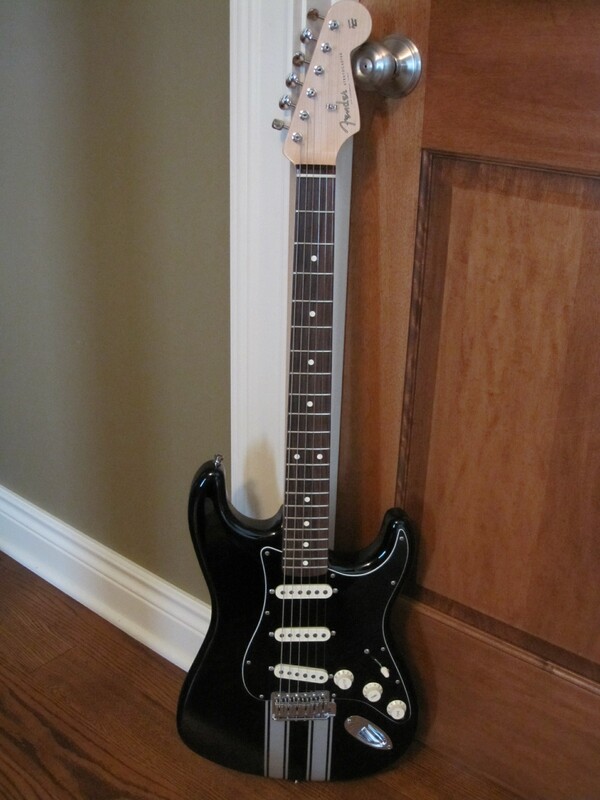 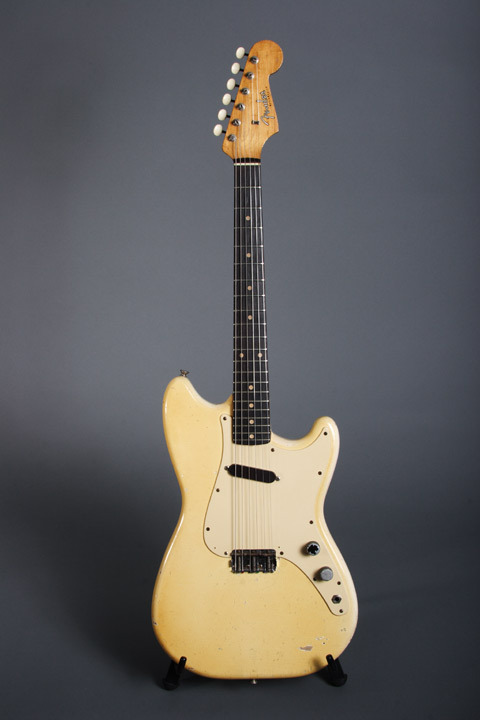 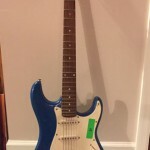 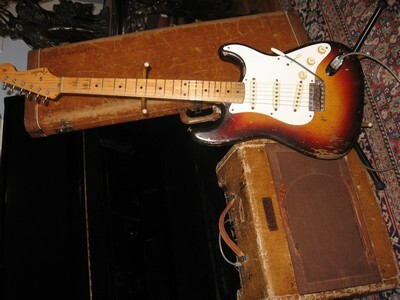 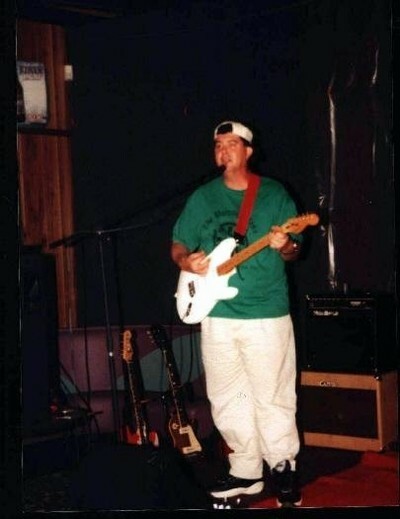 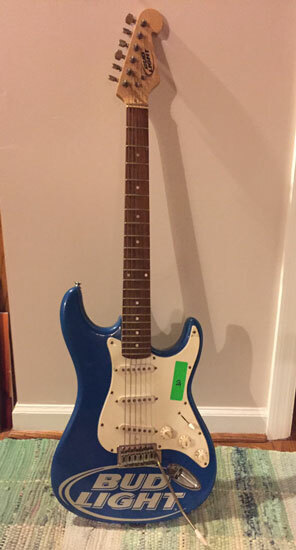 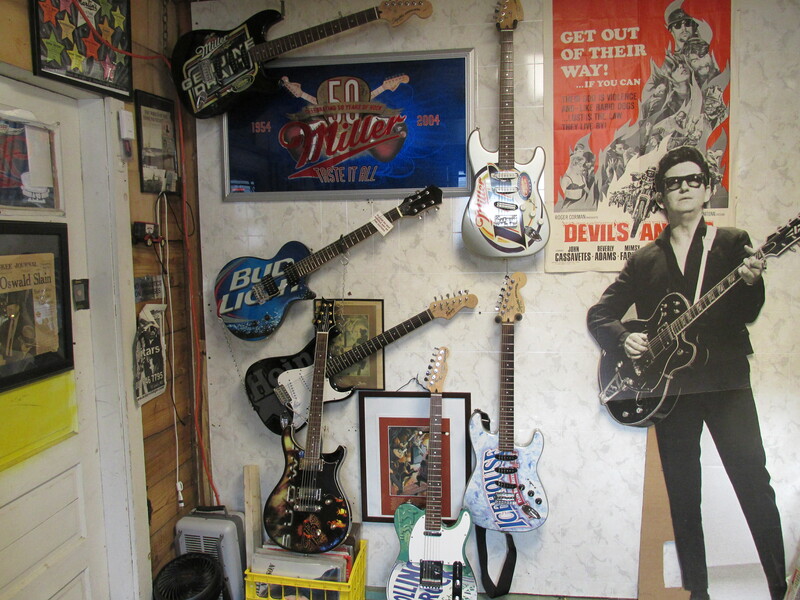 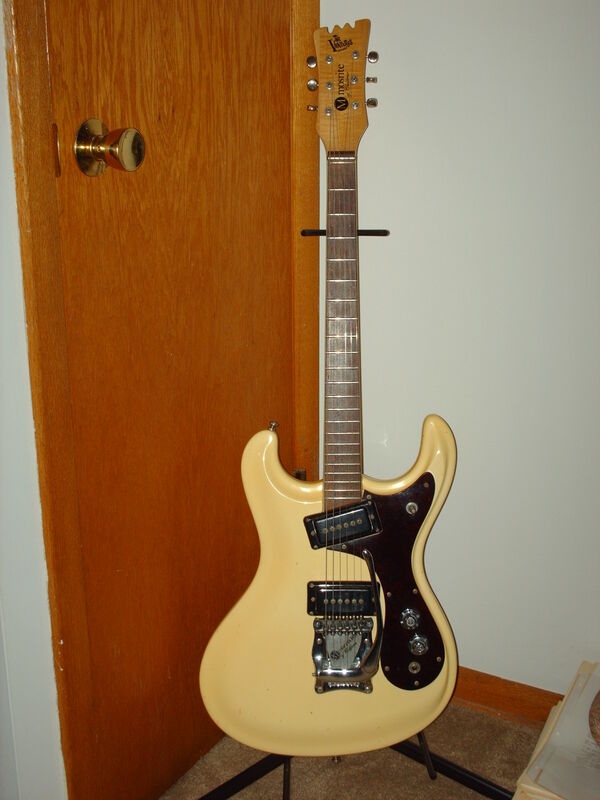 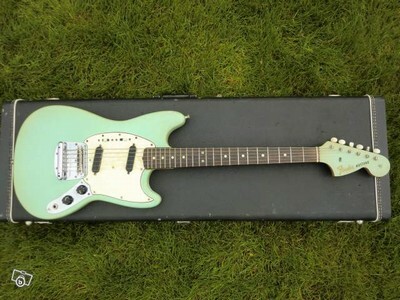 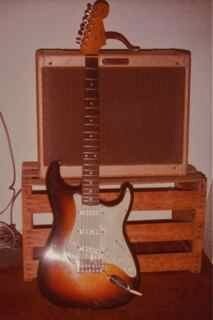 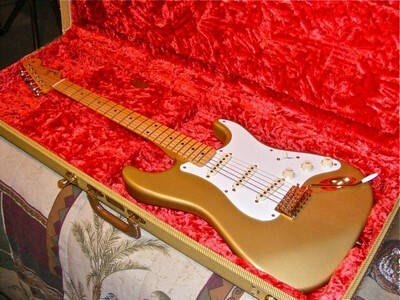 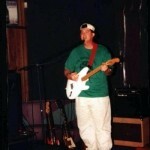 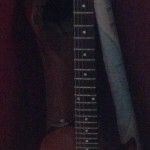 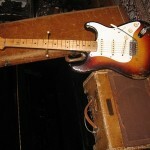 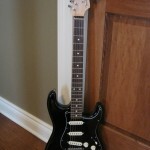 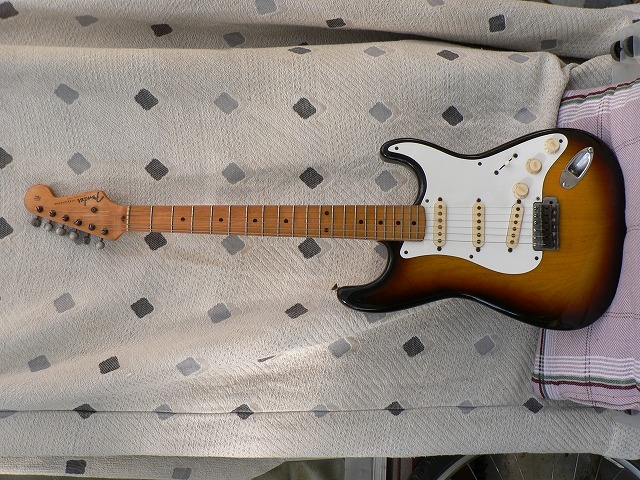 Description: This “Bud Light” Strat clone hung for a few decades on the wall of Auburn, AL nightclub “The War Eagle Supper Club.” The Supper Club closed for good in early 2016 and I bought this guitar at a closing-day auction. 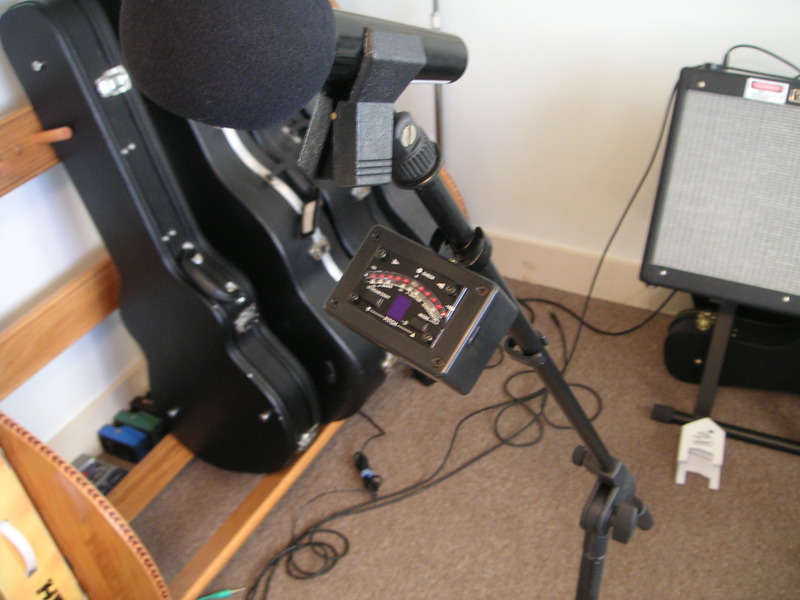 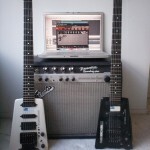 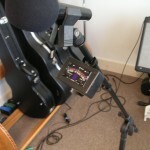 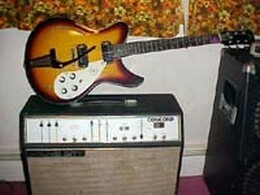 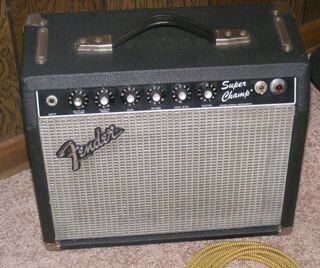 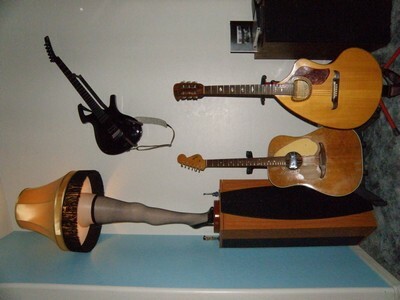 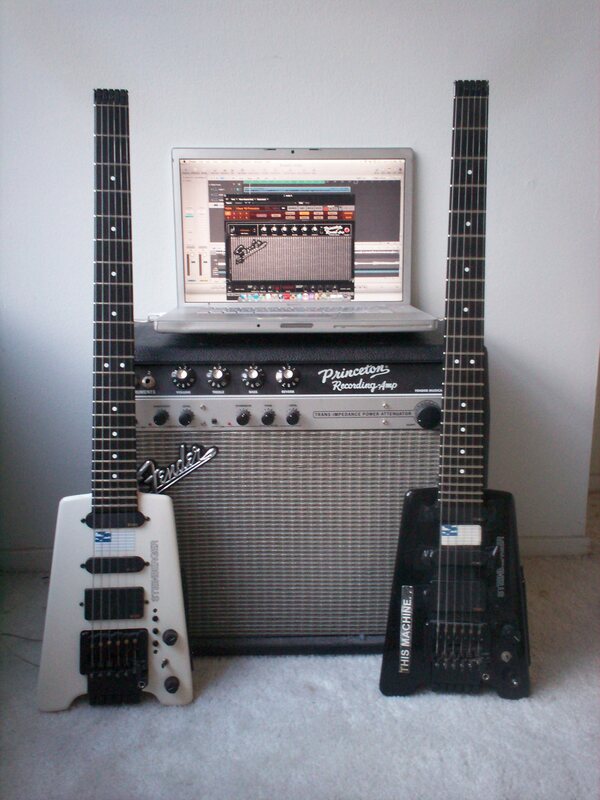 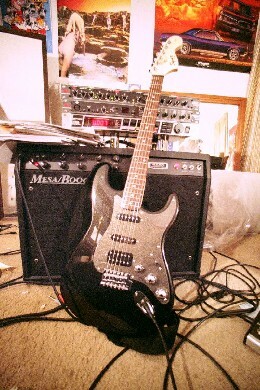 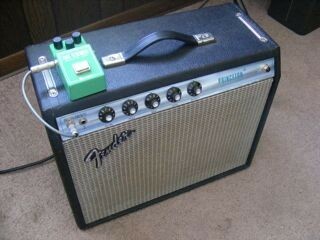 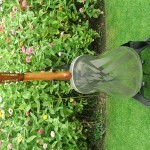 I somewhat straightened the bowed neck and the guitar sounds surprisingly good through an amplifier. 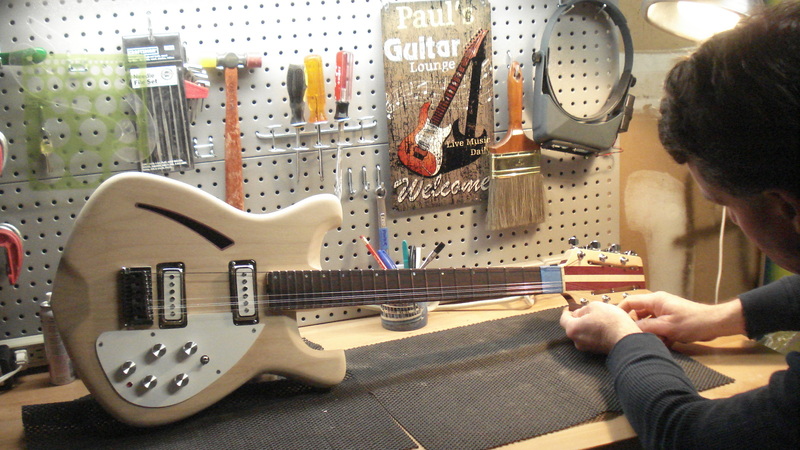 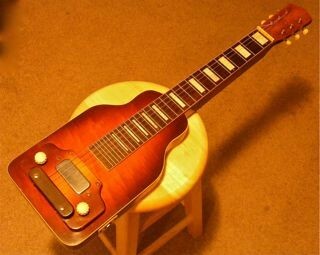 It needs a little fret work but it’s fine for slide. 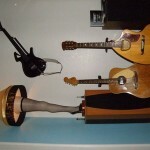 Plus it’s my souvenir of the legendary Supper Club! 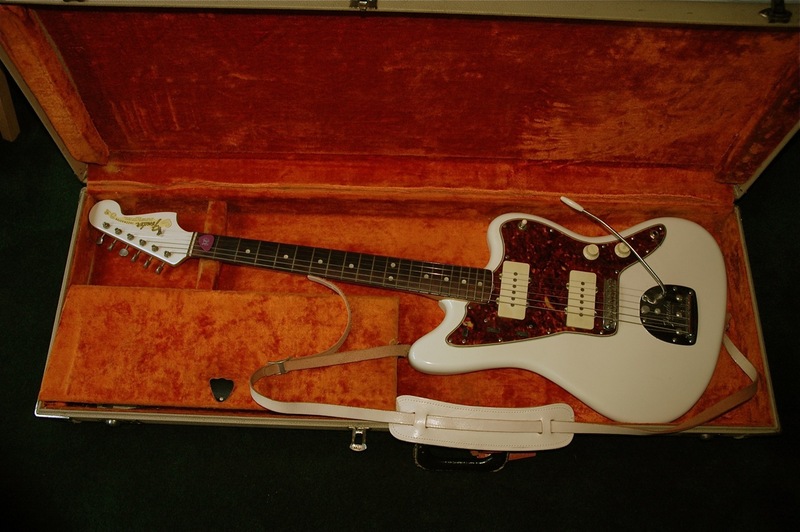 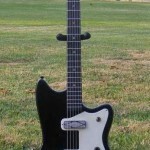 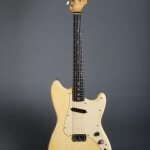 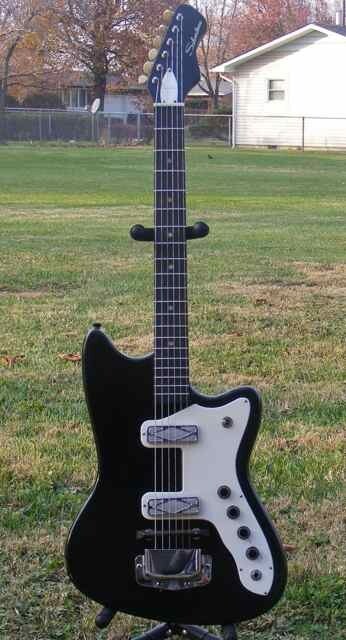 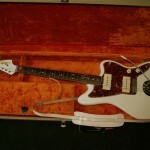 64 Jazzmaster Olympic white with blonde case. 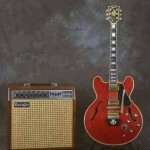 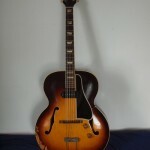 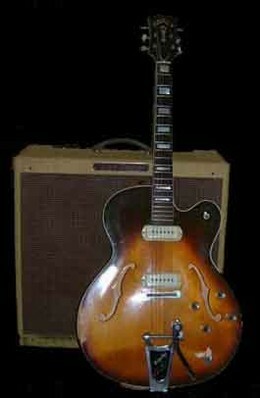 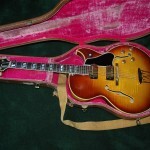 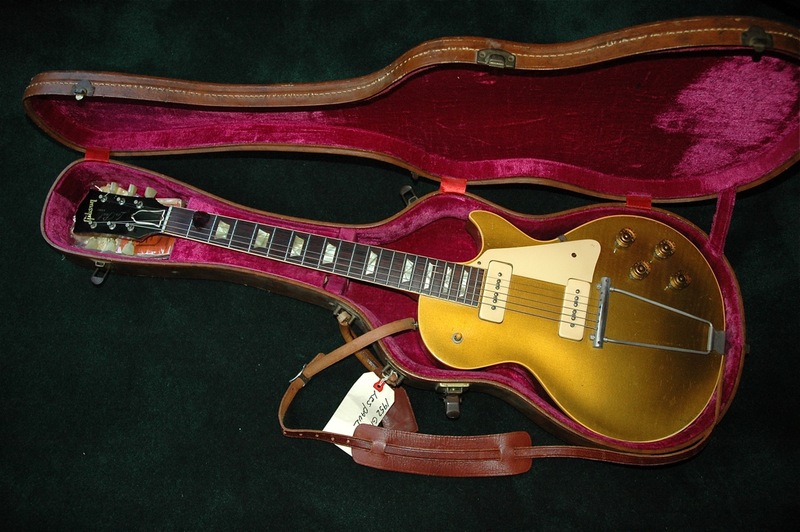 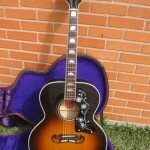 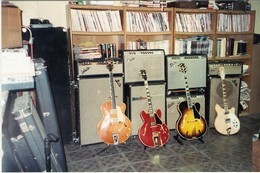 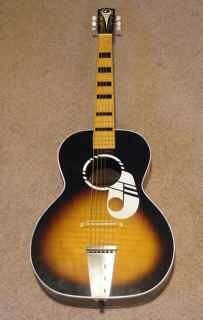 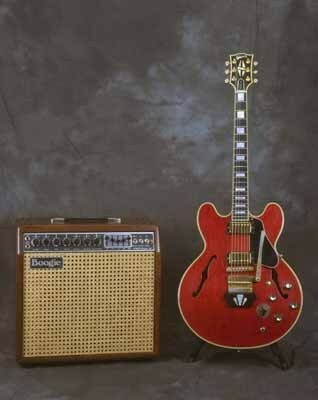 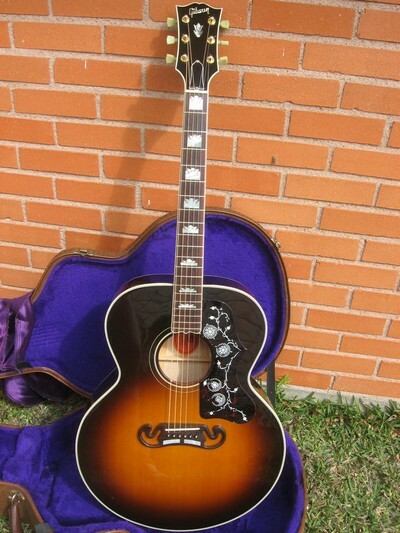 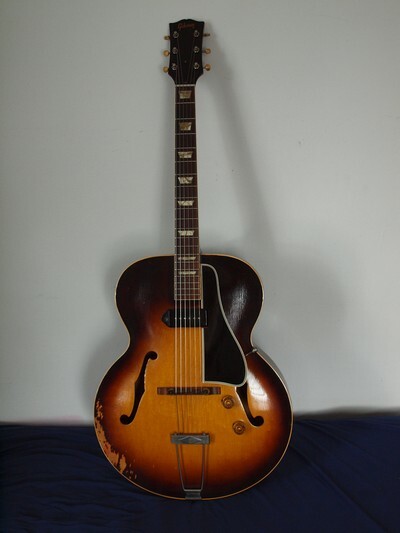 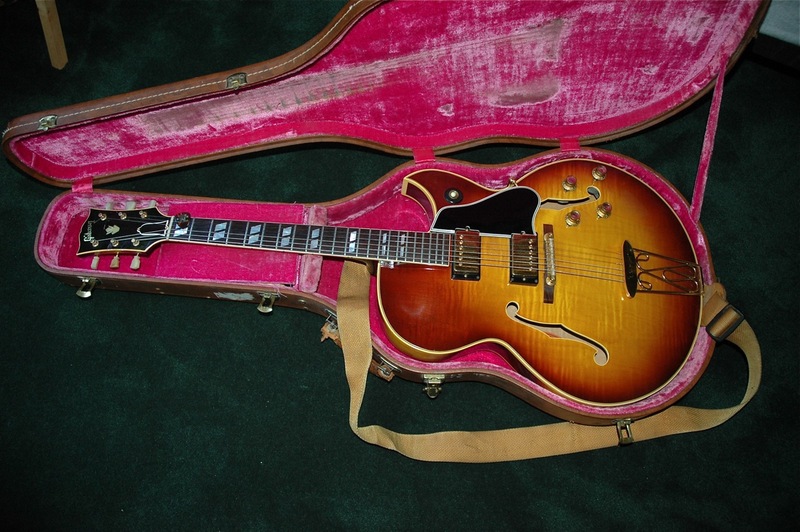 1962 all original Gibson ES 350T with OHSC. 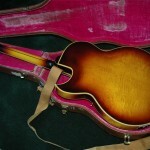 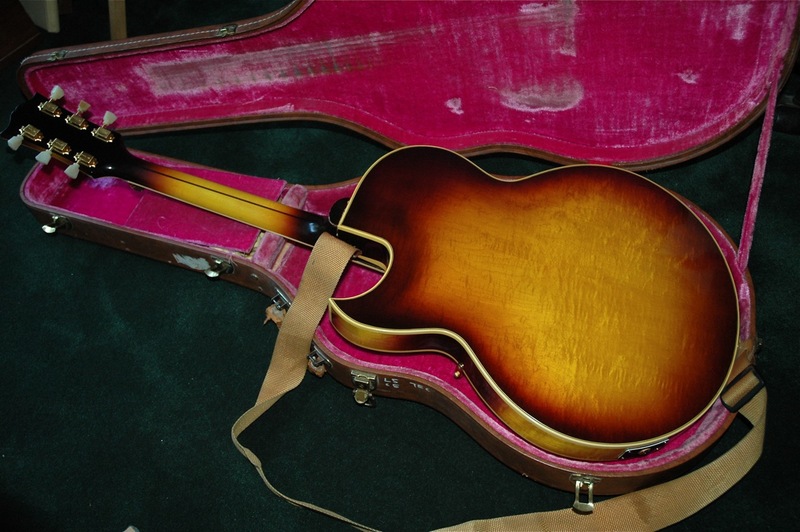 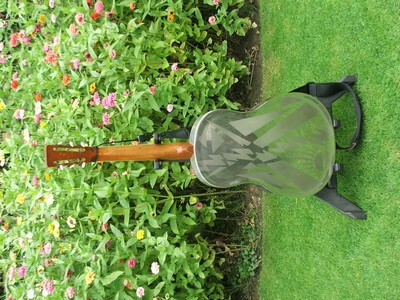 Rear of 62 Gibson ES 350T. 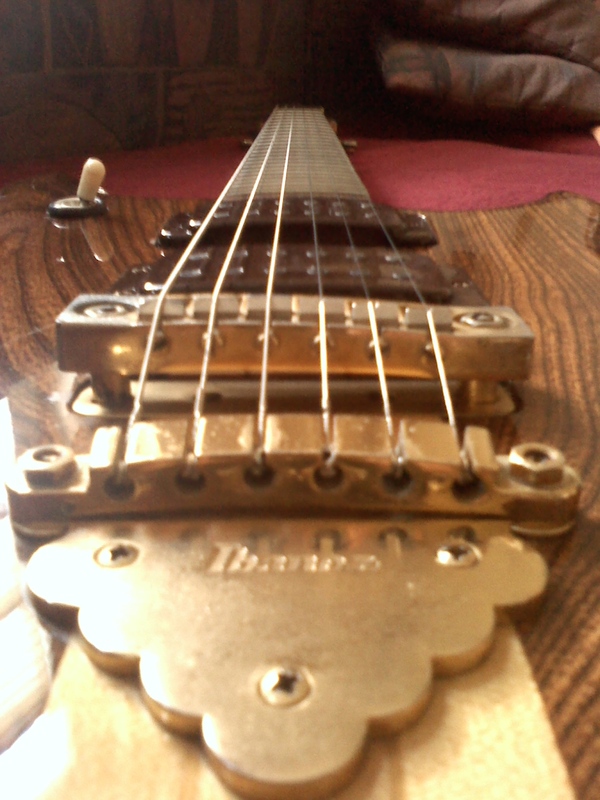 Gold plated hardware. 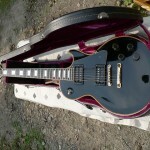 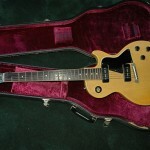 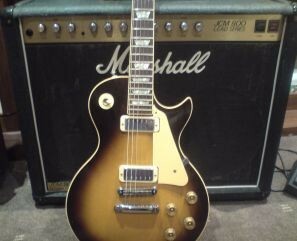 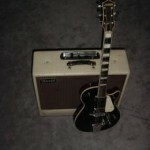 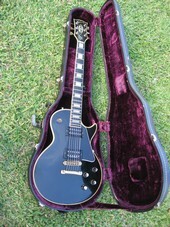 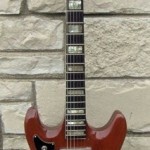 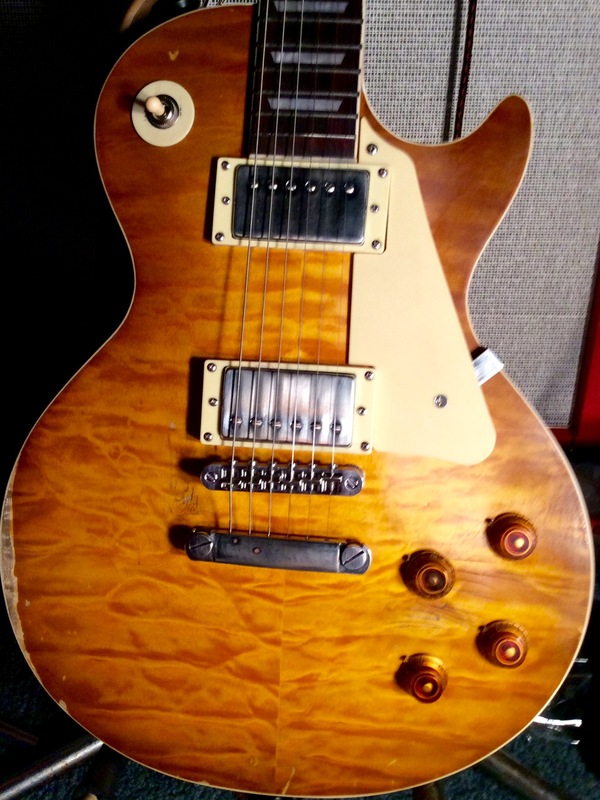 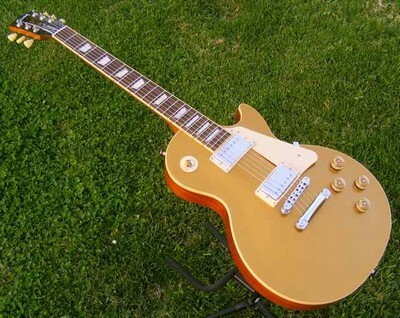 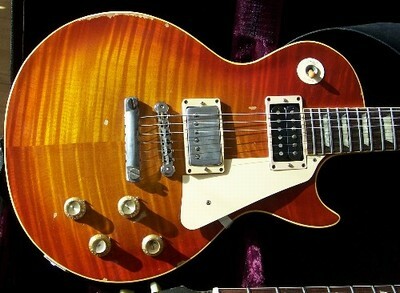 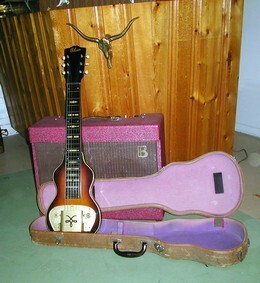 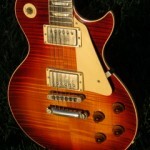 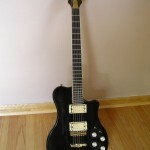 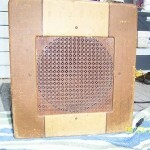 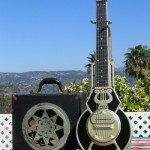 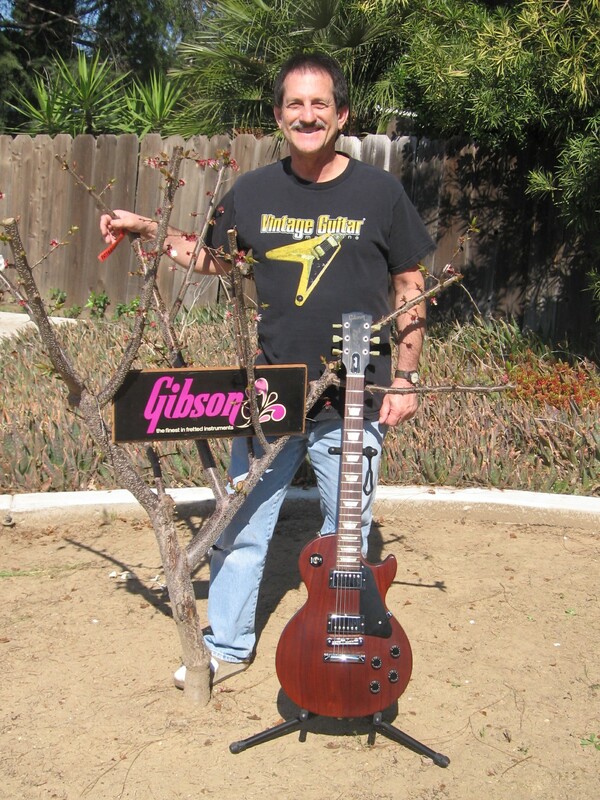 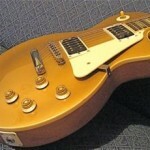 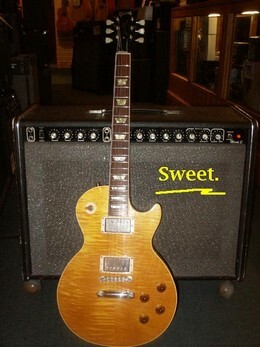 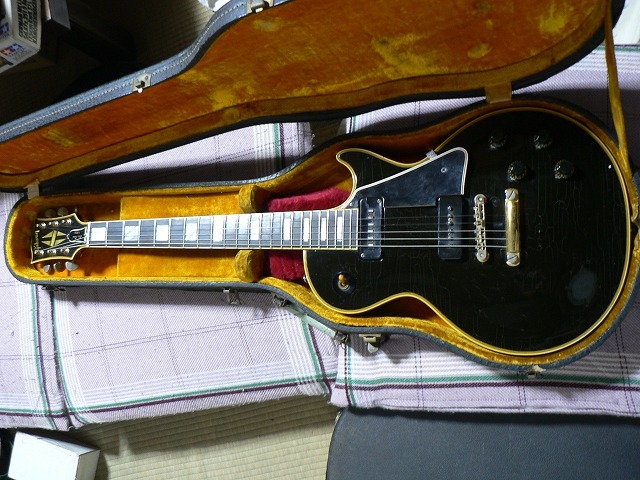 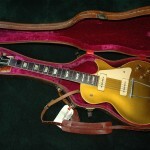 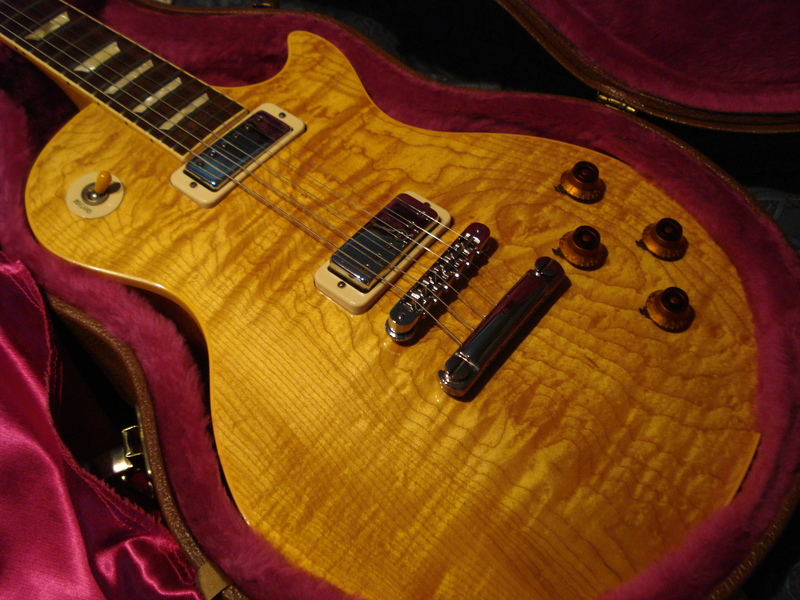 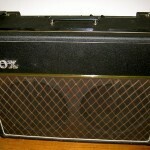 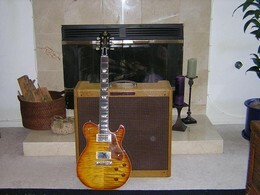 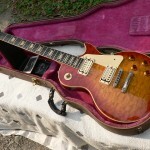 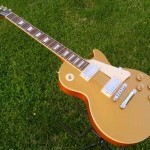 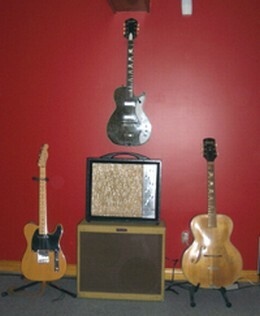 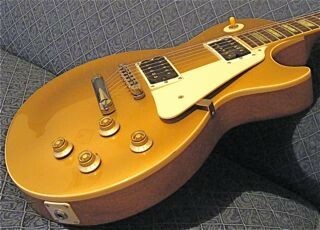 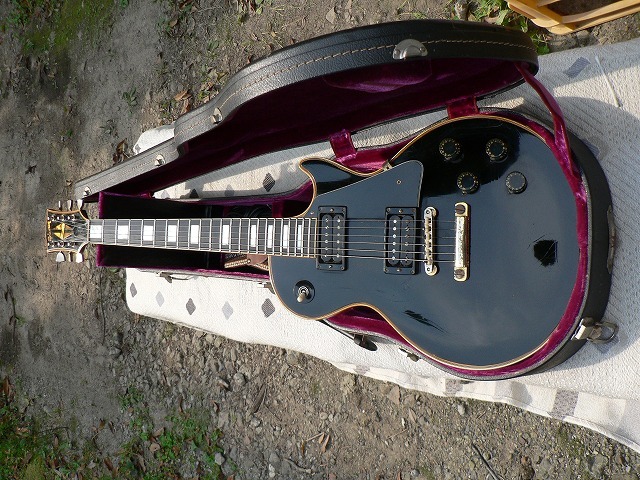 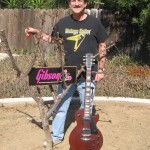 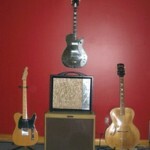 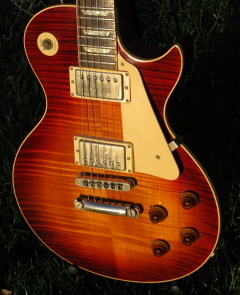 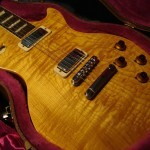 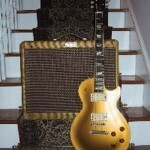 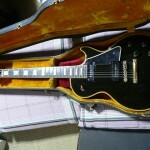 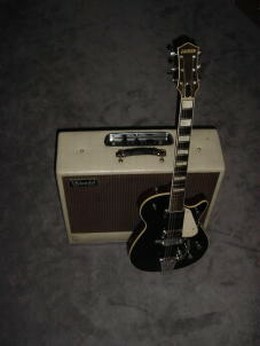 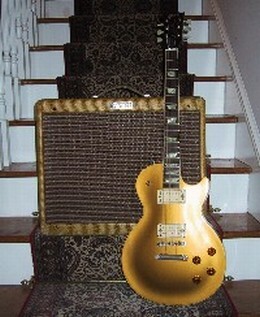 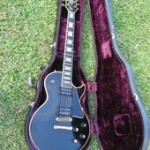 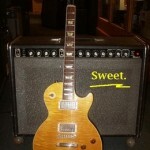 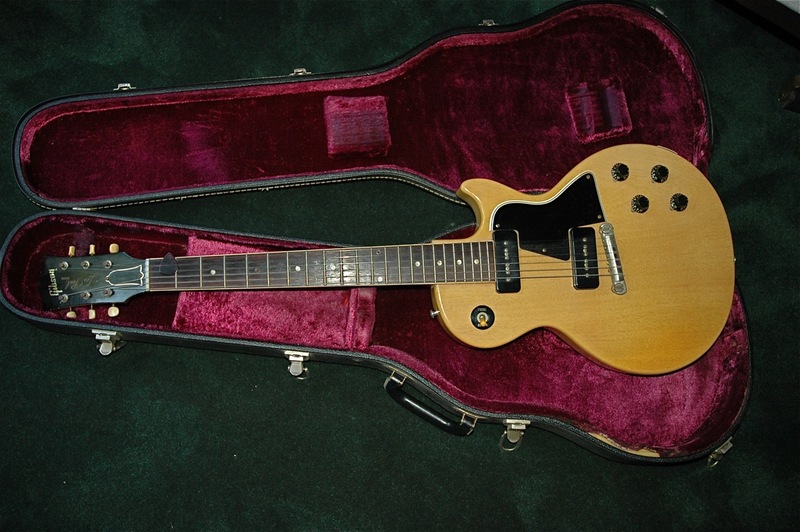 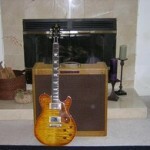 1956 Les Paul Special TV finish. 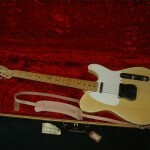 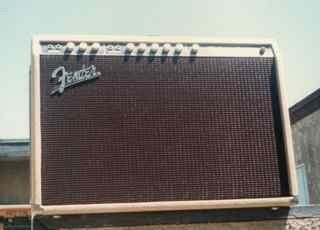 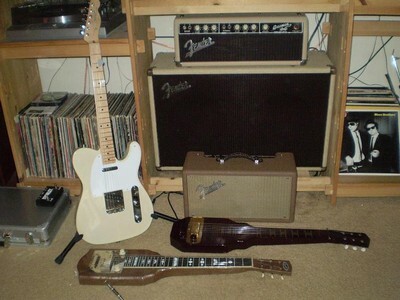 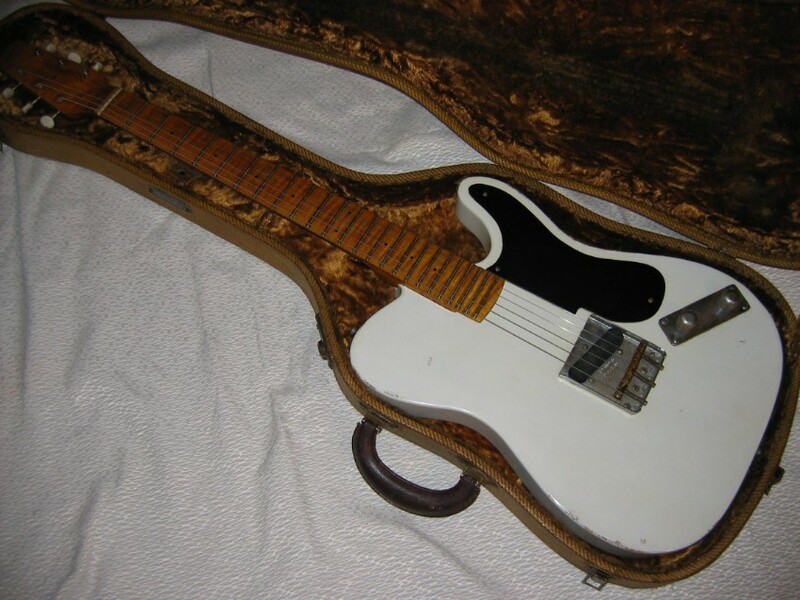 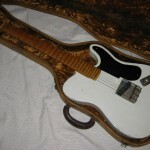 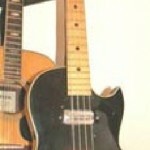 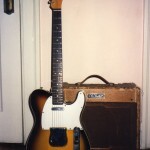 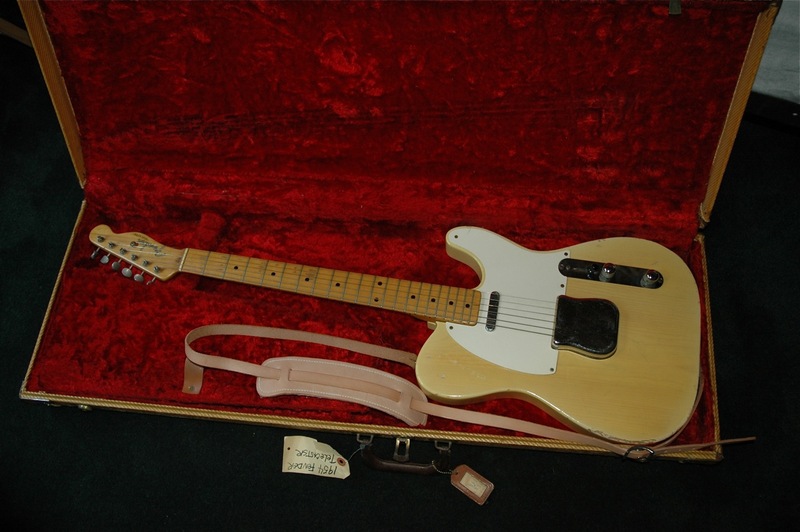 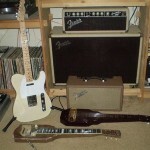 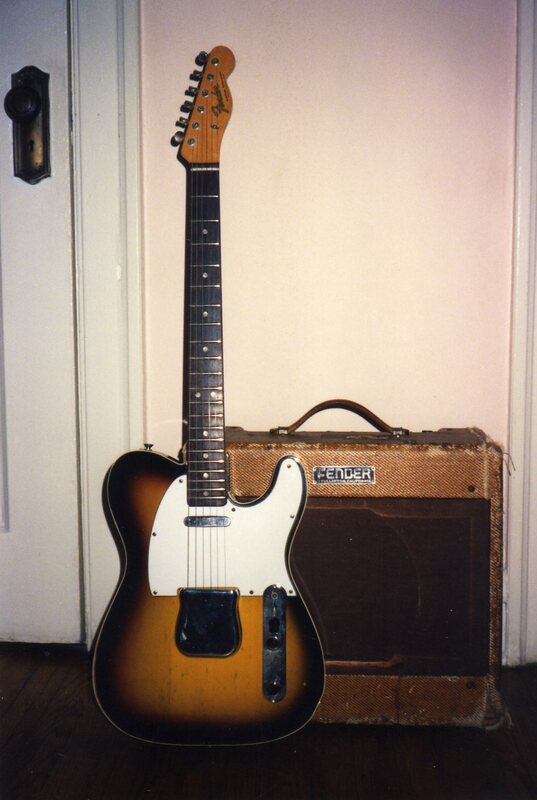 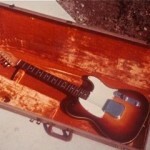 Nov. 1954 Fender Telecaster. 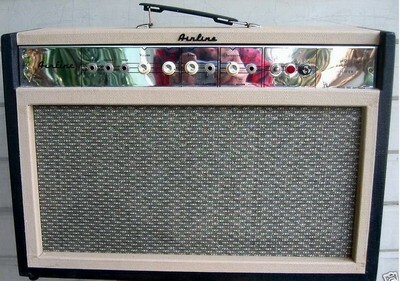 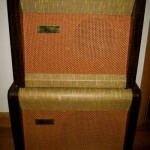 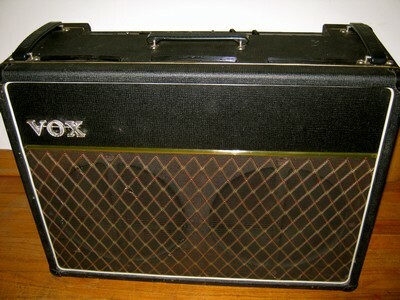 All original with original tweed HSC. 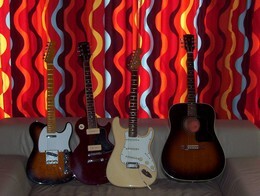 Another part of my collection. 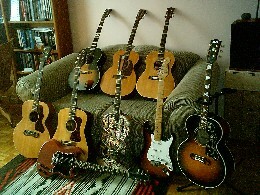 Another part of my collection 2. 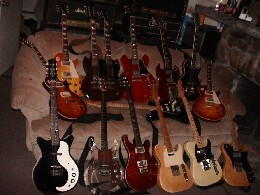 Another part of my collection 3. 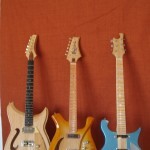 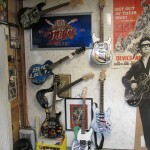 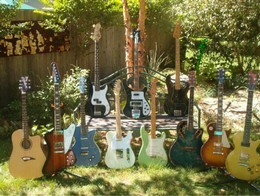 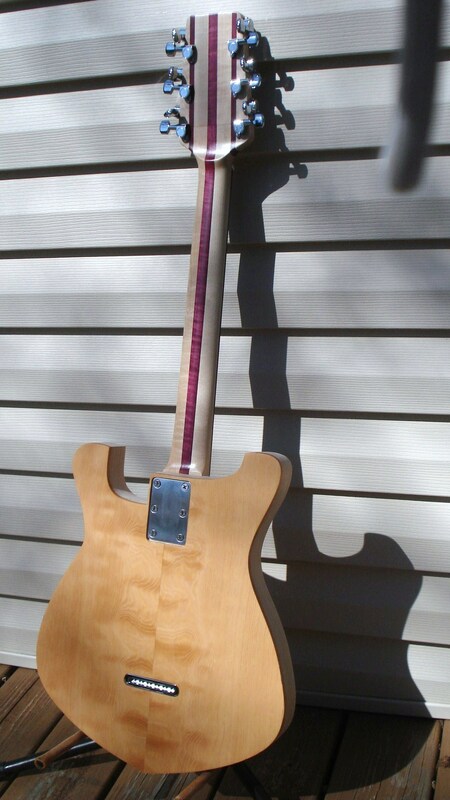 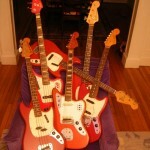 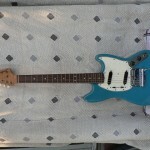 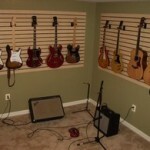 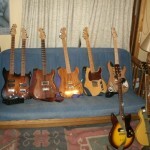 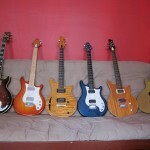 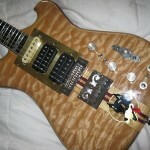 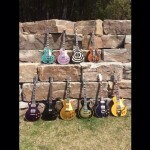 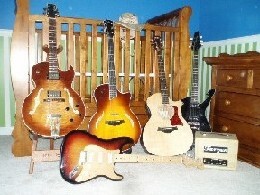 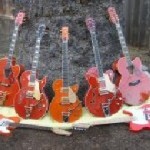 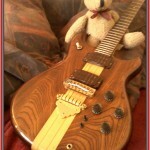 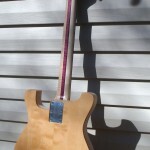 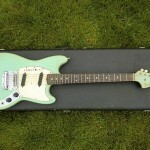 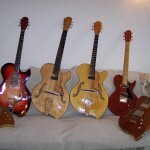 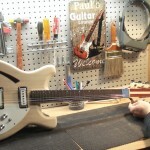 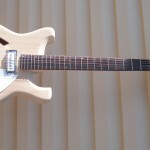 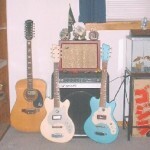 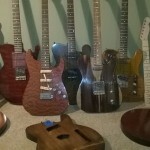 Homemade custom guitars I’ve built. 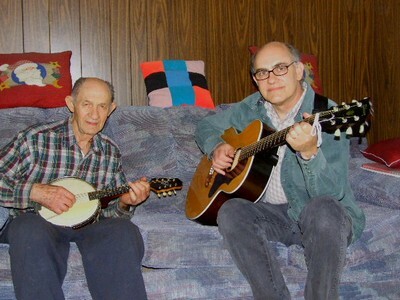 We will miss you Stan. 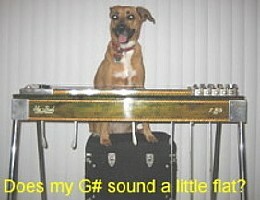 Does My G# Sound A Little Flat?? 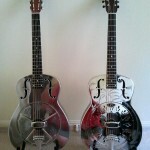 Glad I didn’t modify them!! 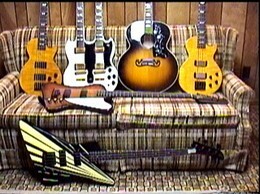 3 Blondes on a couch! 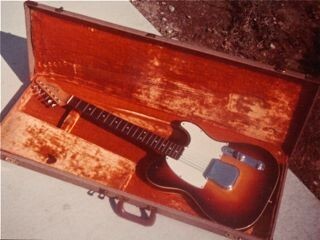 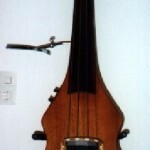 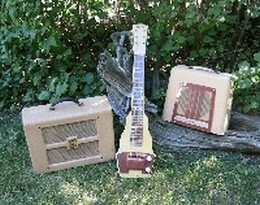 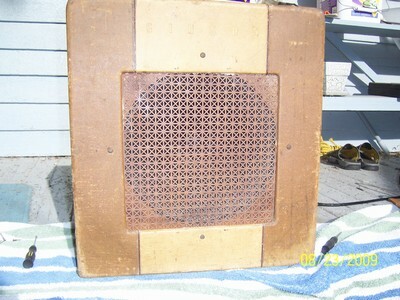 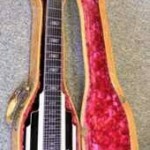 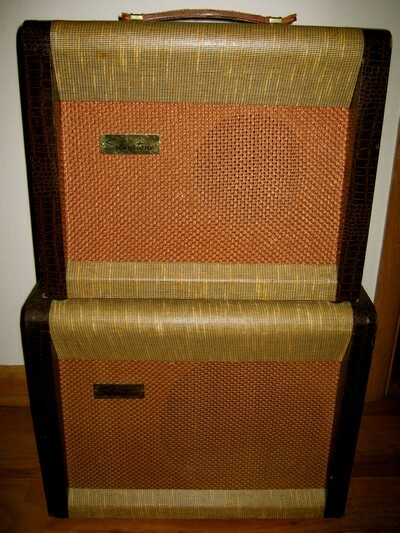 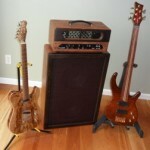 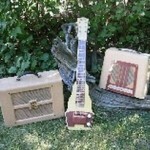 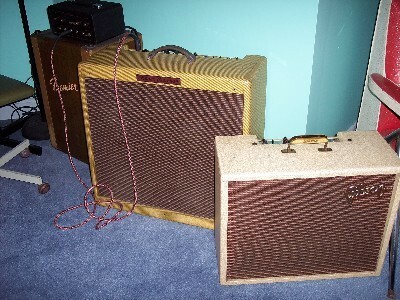 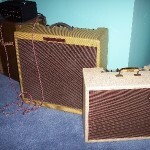 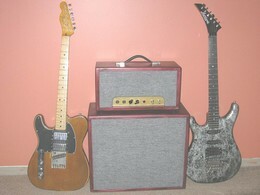 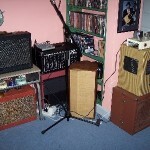 Our home built Esquire Snakehead Prototpye & case. 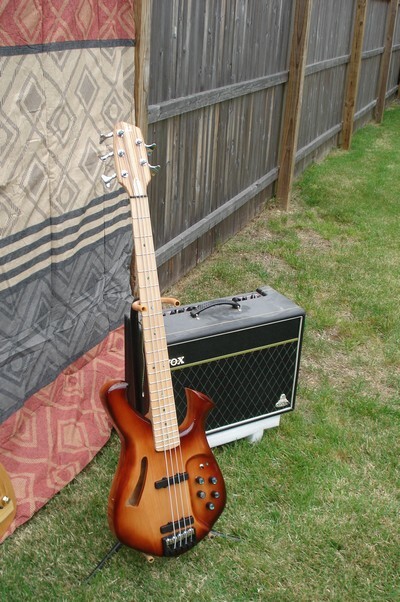 Bass Guitar I built 5- string active/passive bass guitar built and designed by Paul Fieman for James Hilzman of the “502 band” Anza California. 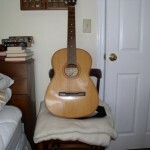 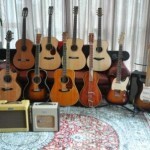 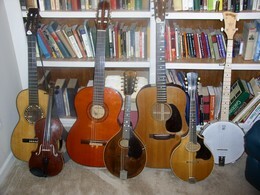 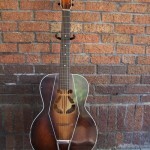 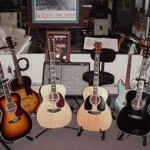 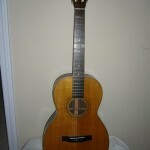 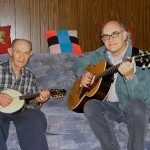 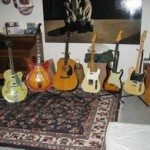 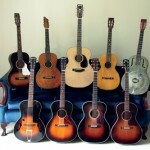 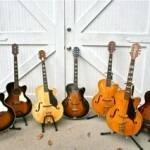 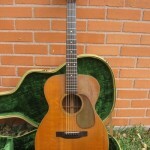 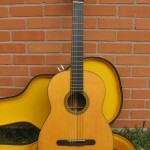 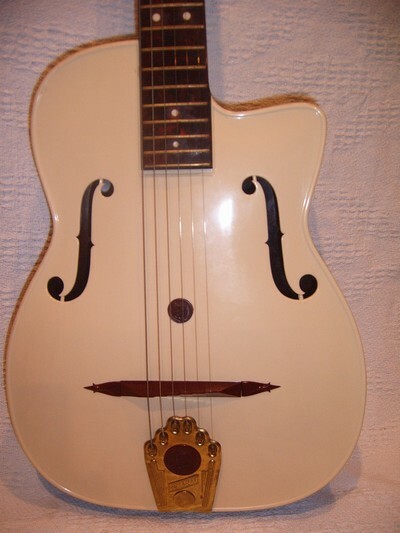 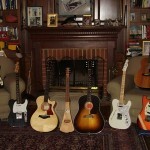 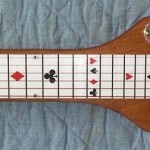 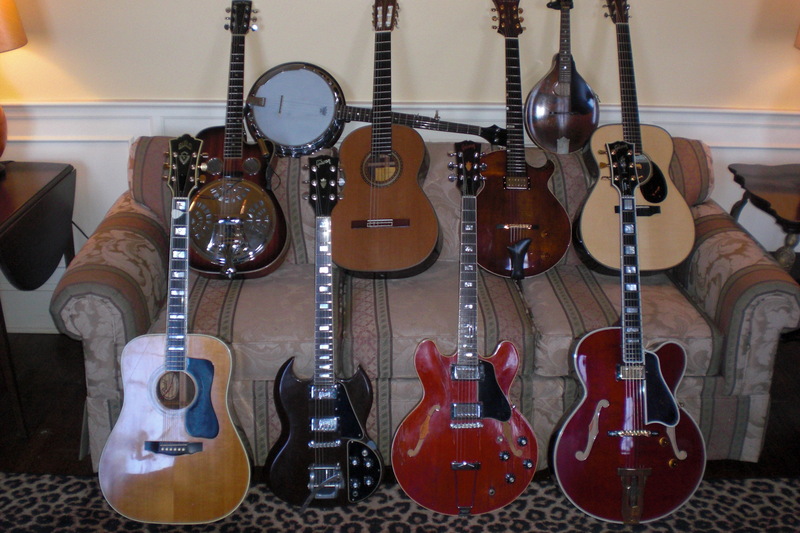 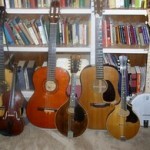 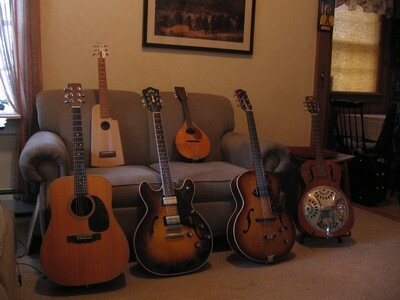 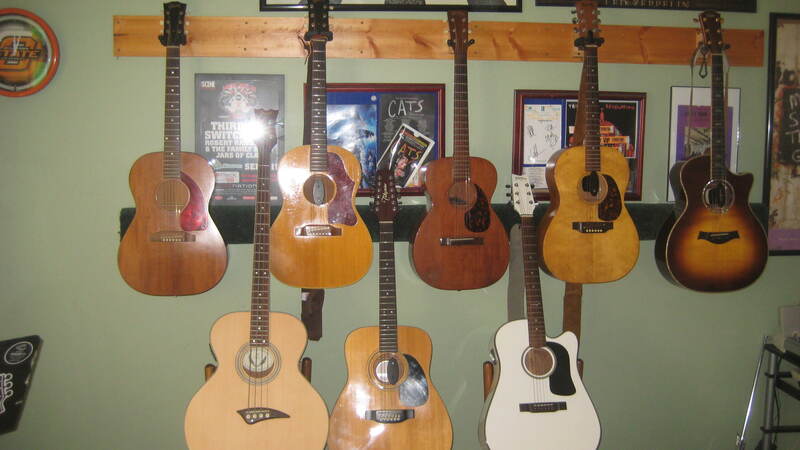 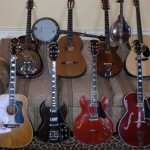 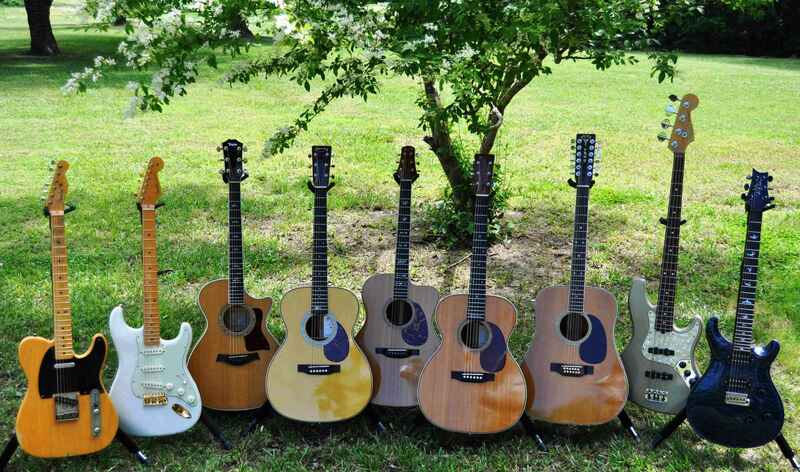 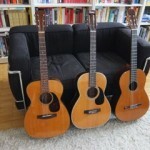 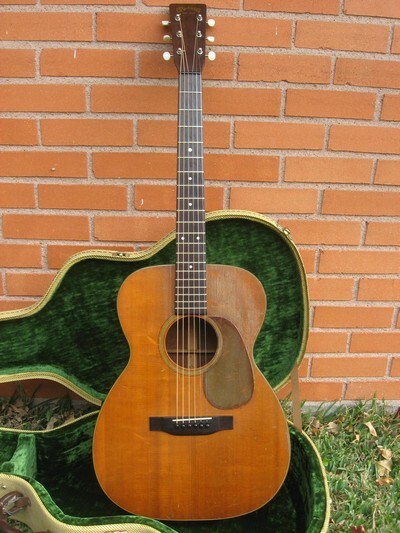 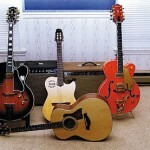 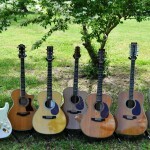 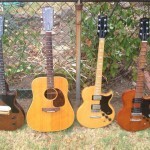 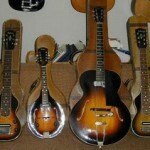 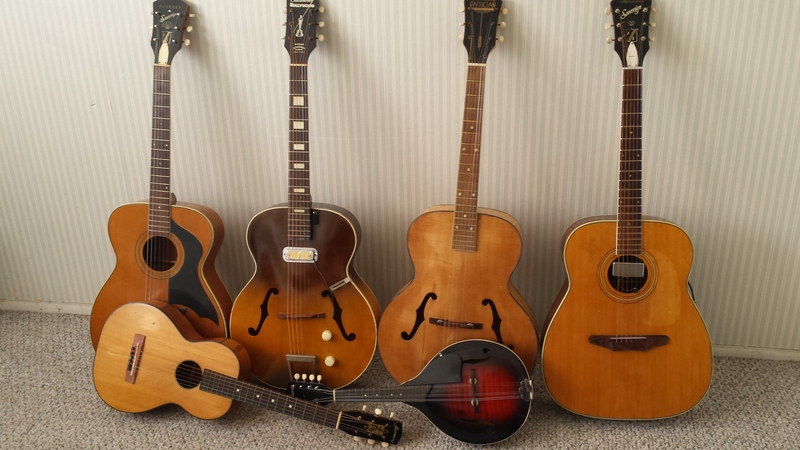 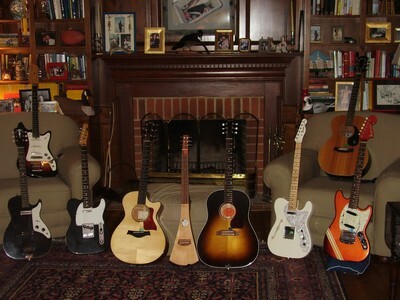 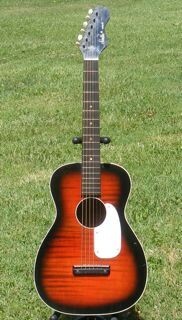 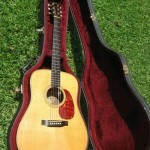 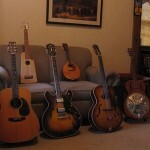 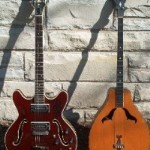 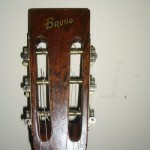 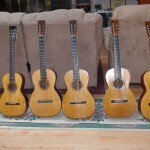 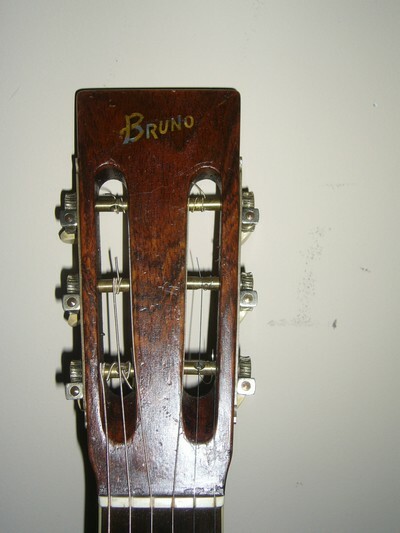 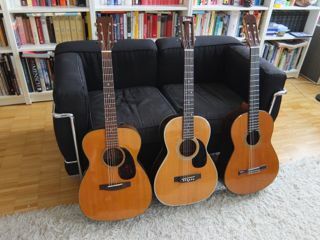 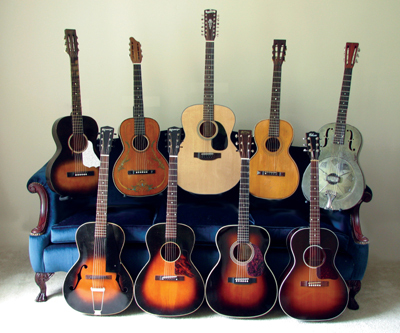 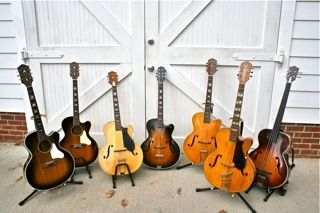 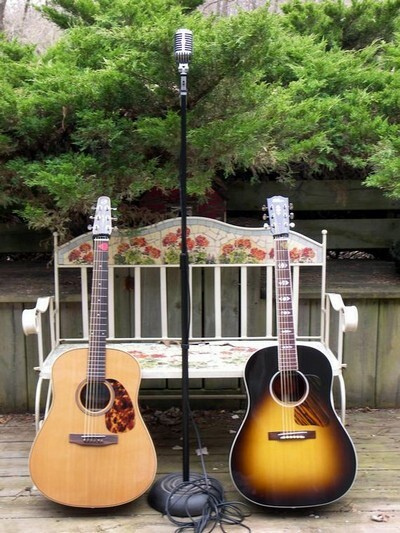 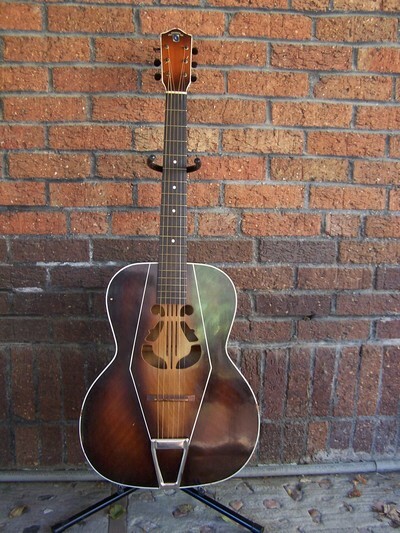 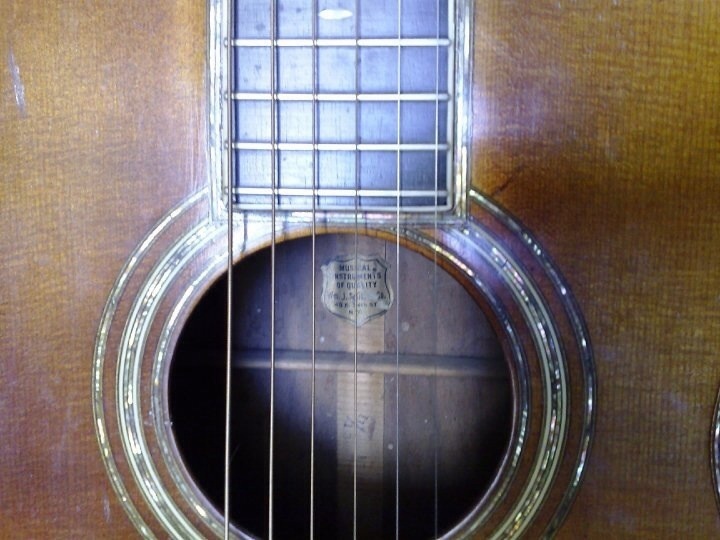 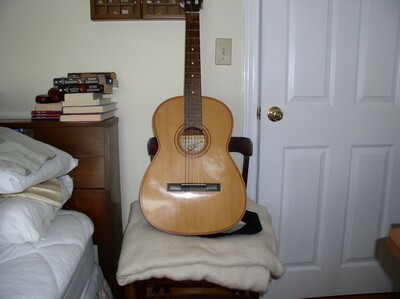 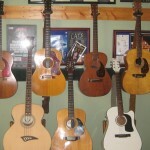 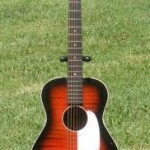 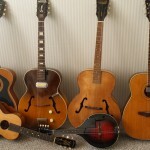 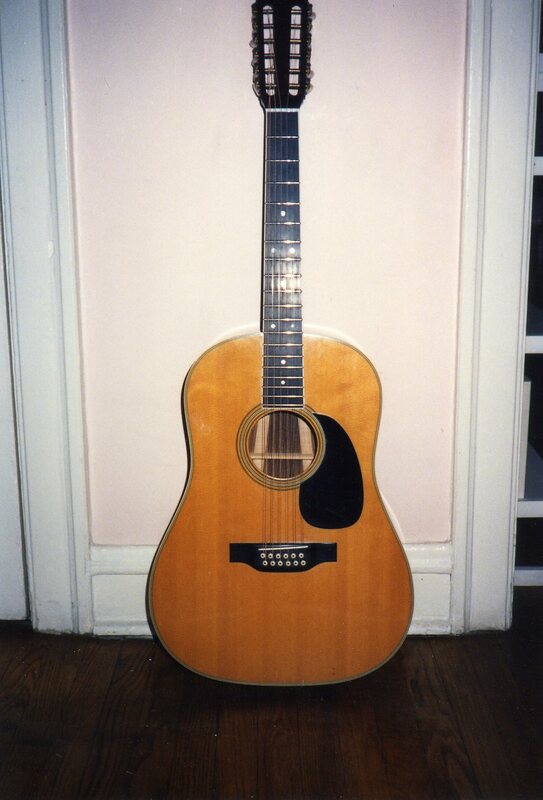 Six pre-Civil War Martin guitars. 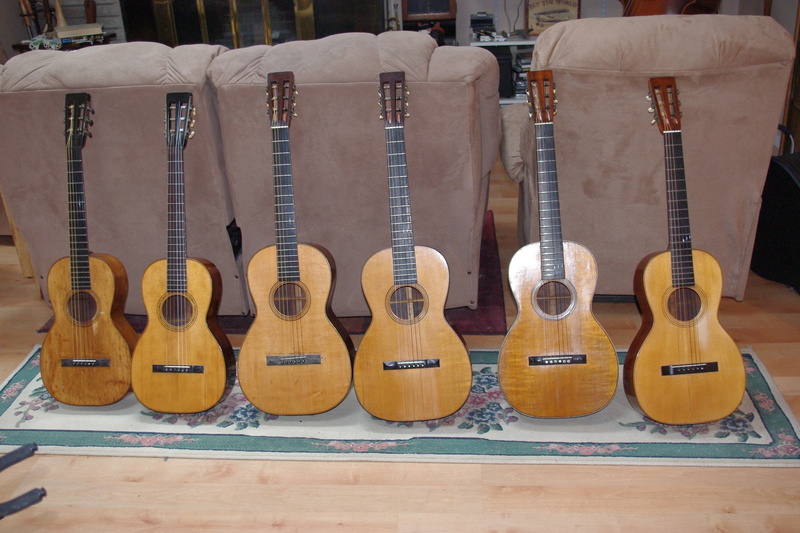 From left to right, 1845 3-17, 1850 3-17, 1847 1-20, 1850 1-17, 1855 1-26, 1860 2-20. 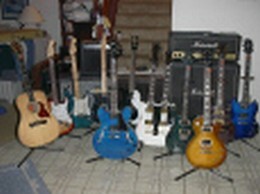 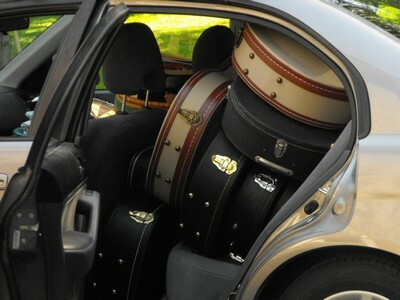 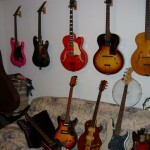 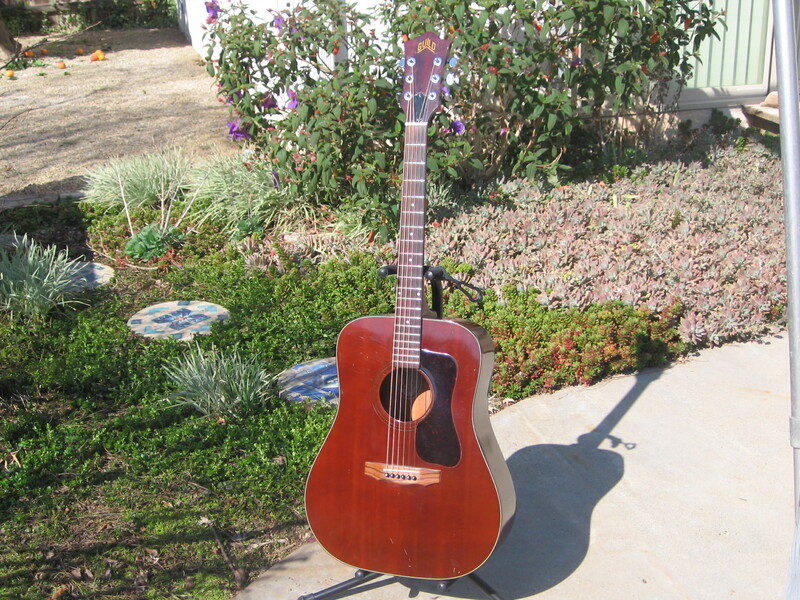 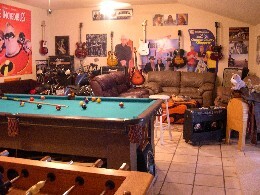 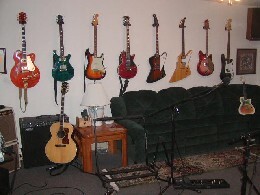 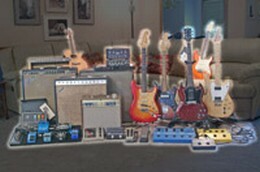 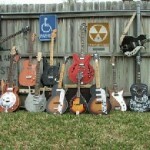 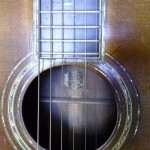 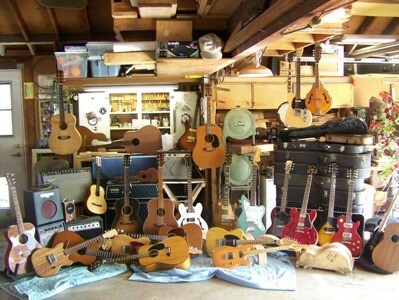 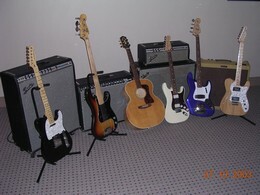 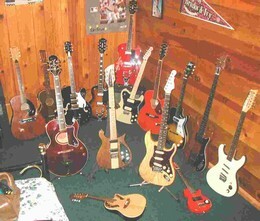 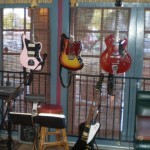 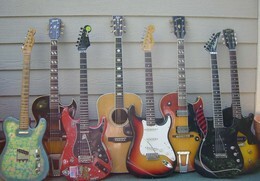 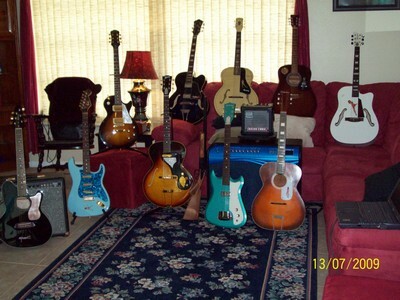 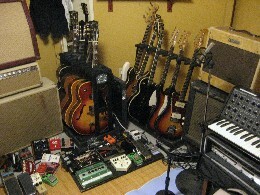 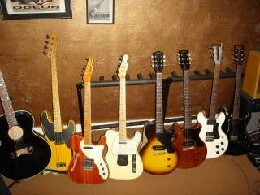 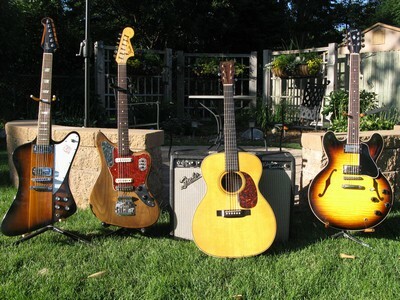 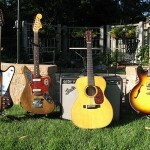 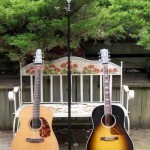 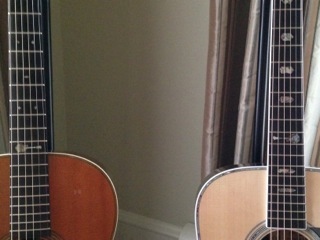 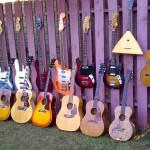 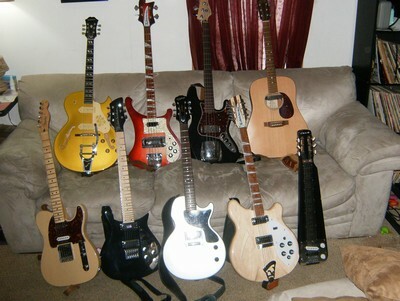 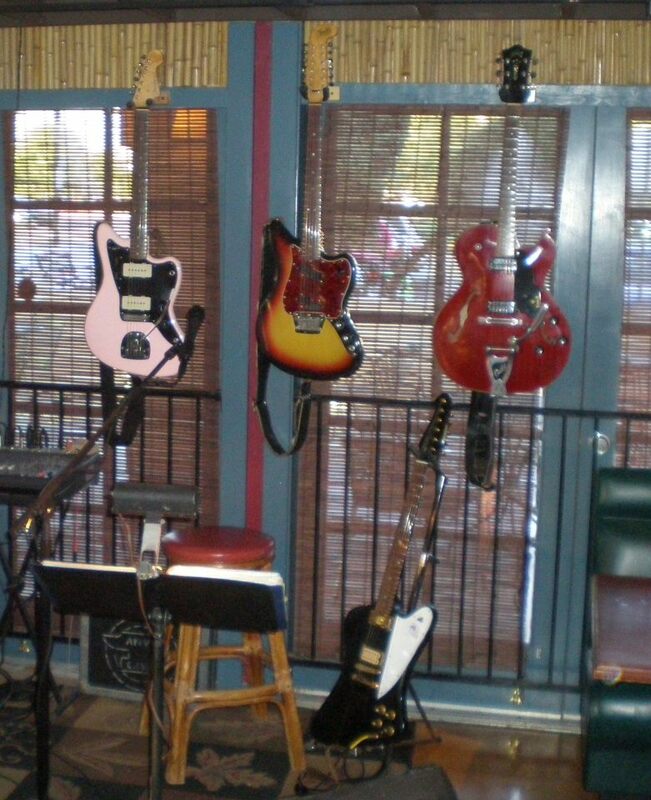 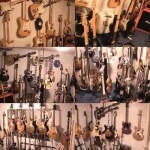 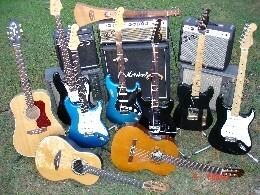 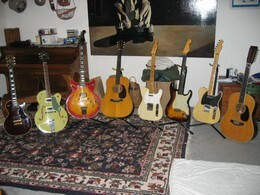 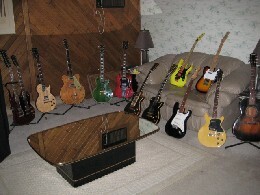 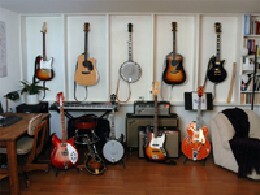 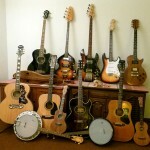 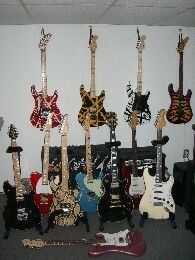 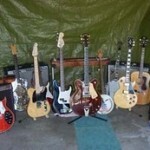 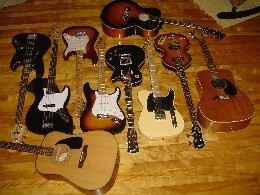 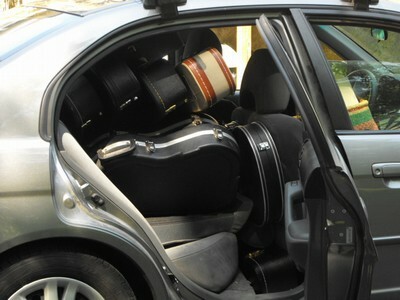 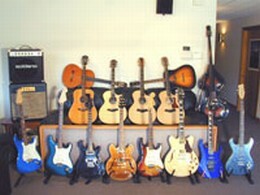 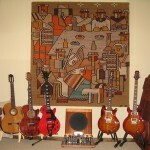 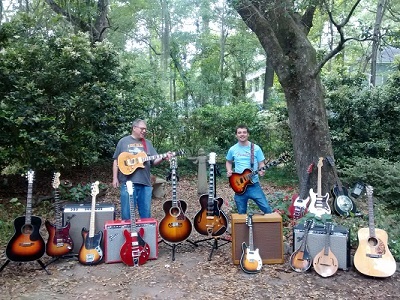 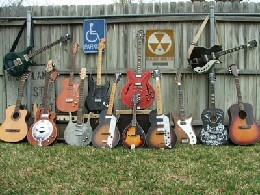 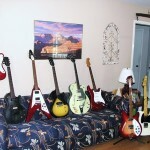 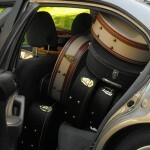 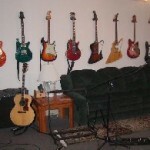 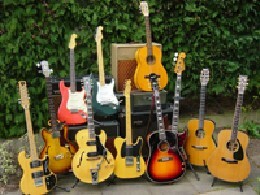 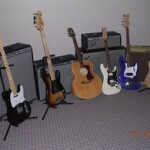 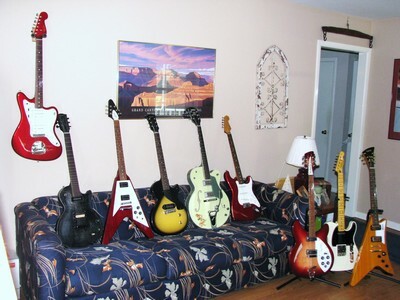 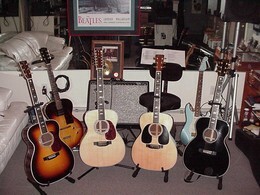 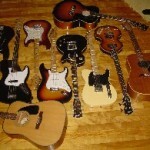 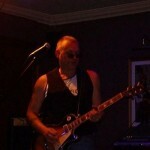 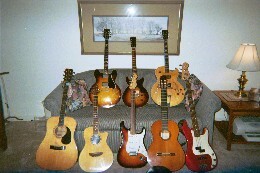 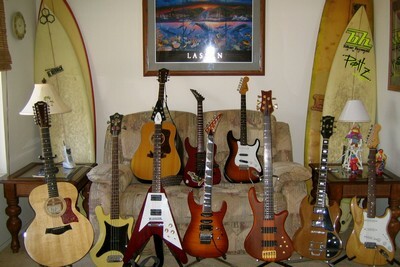 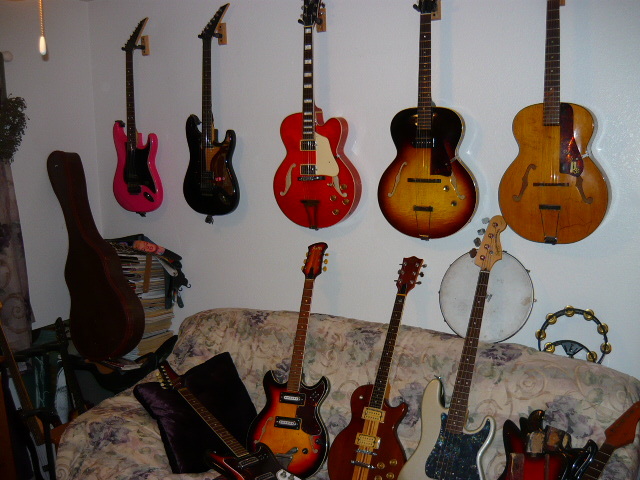 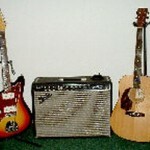 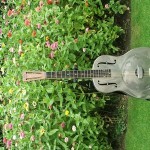 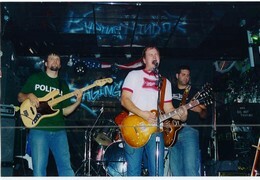 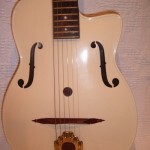 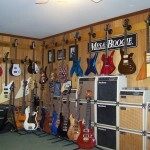 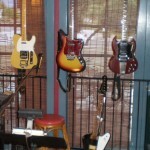 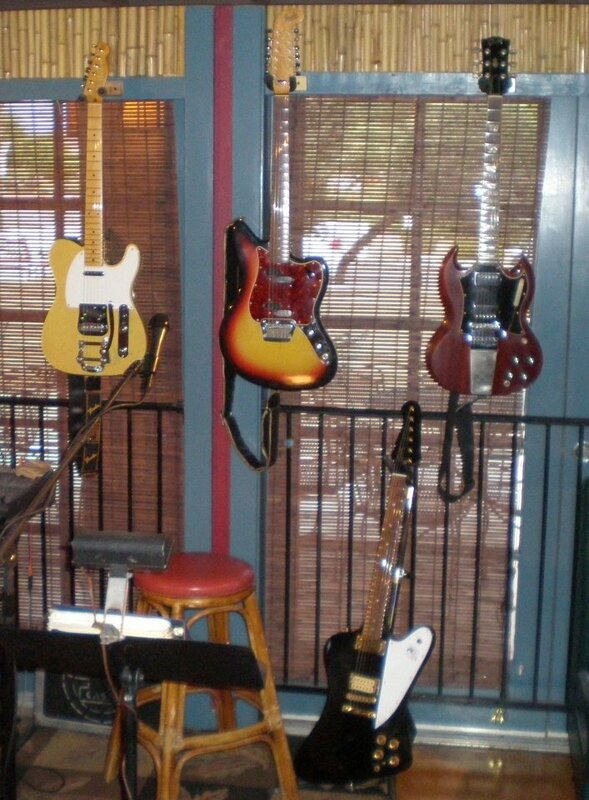 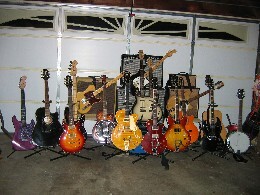 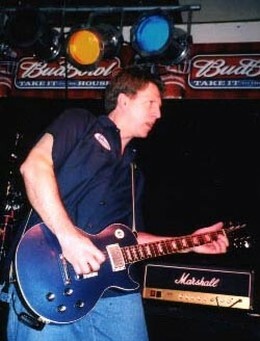 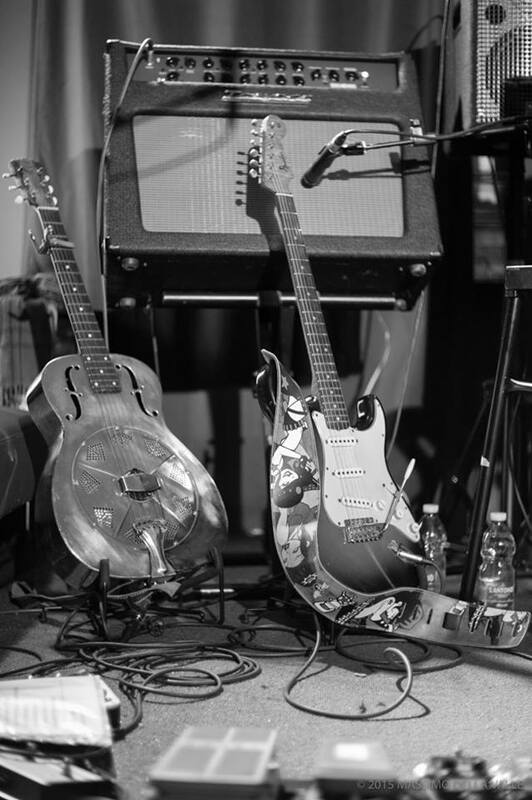 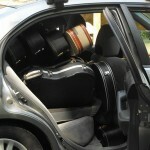 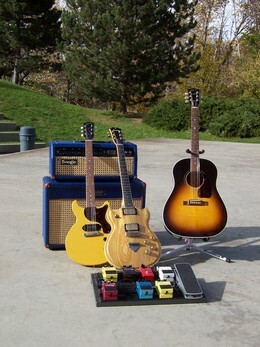 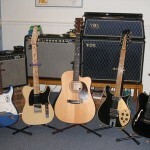 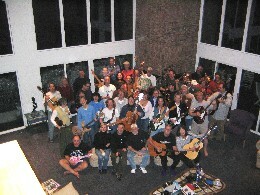 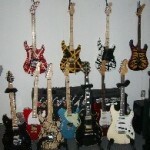 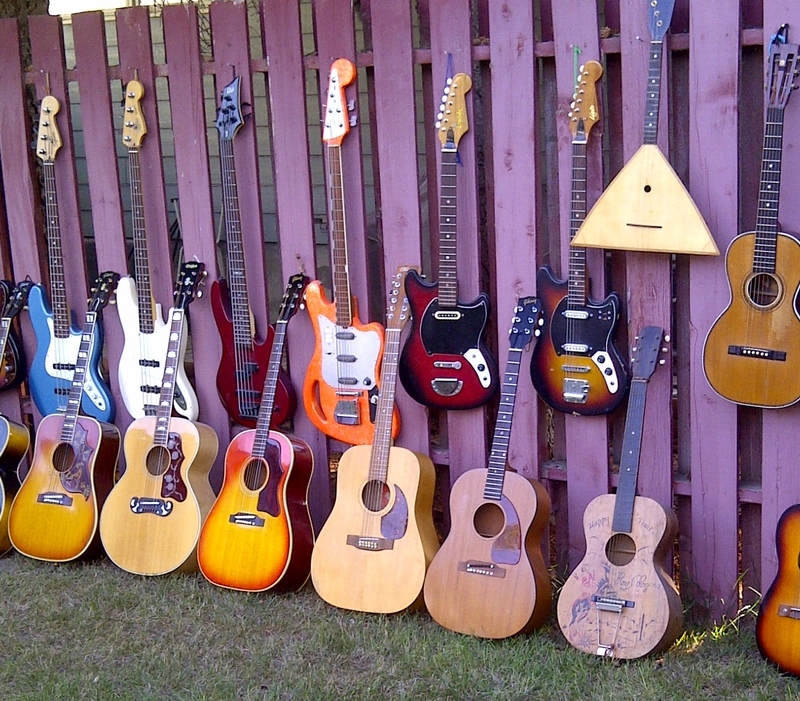 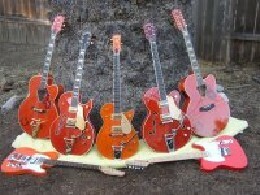 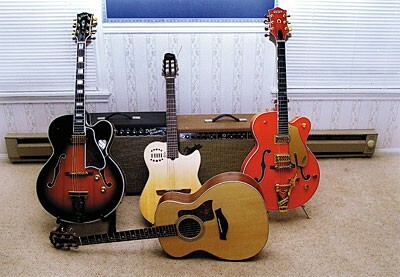 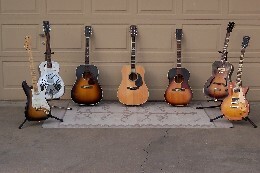 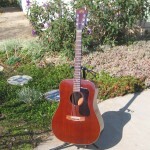 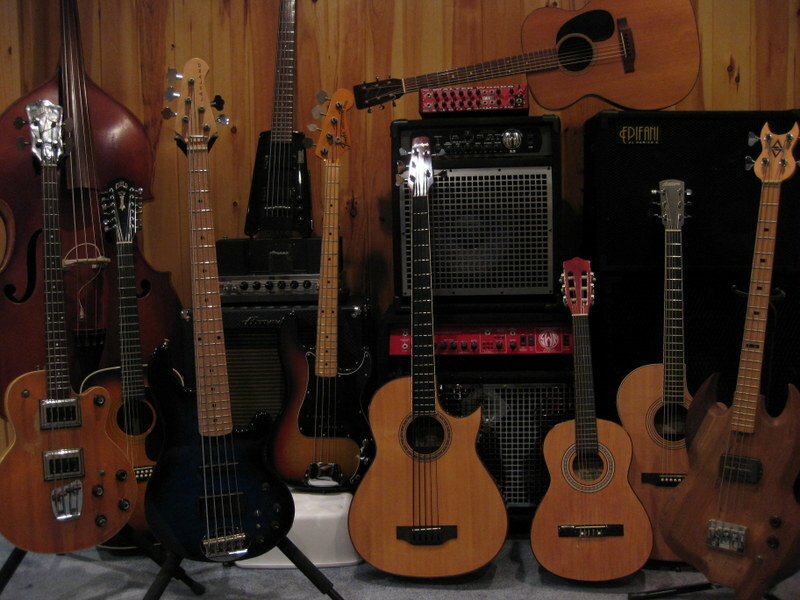 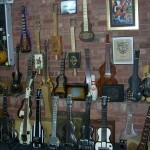 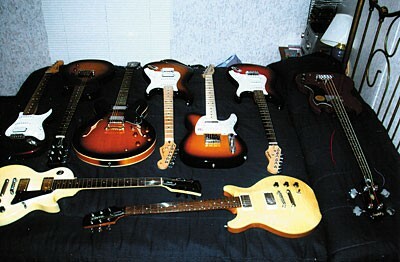 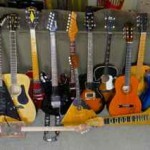 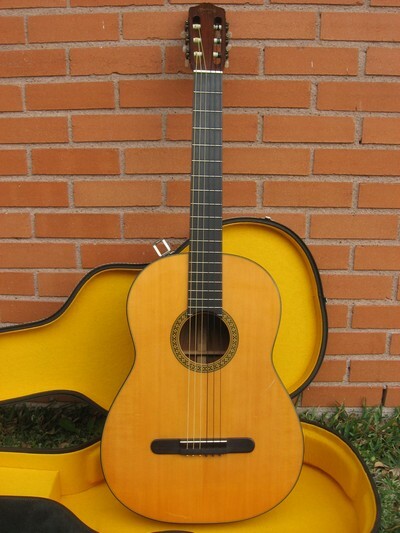 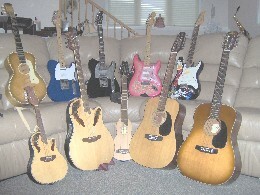 All guitars are used for public performances. 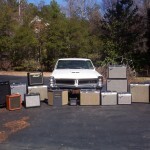 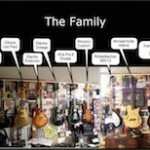 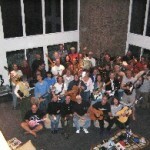 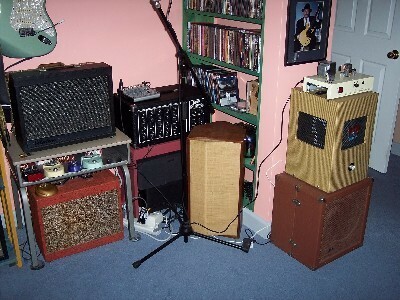 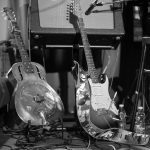 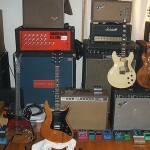 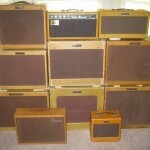 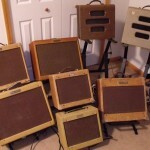 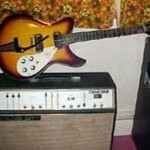 Tone Farm – still growing! 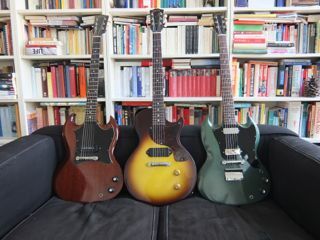 ADAMAS AND MORE ADAMAS FOREVER! 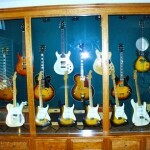 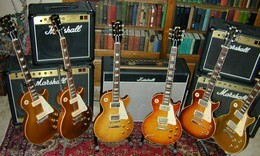 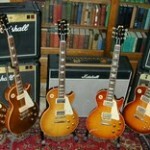 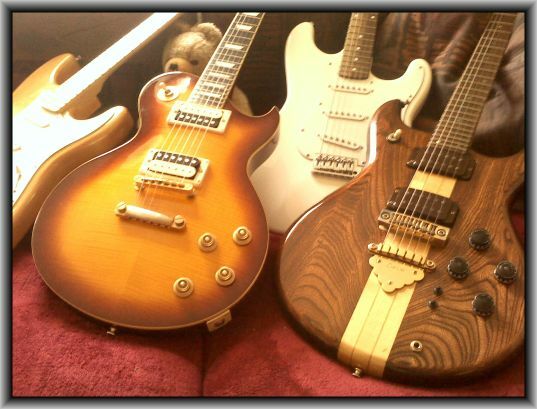 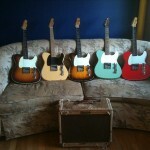 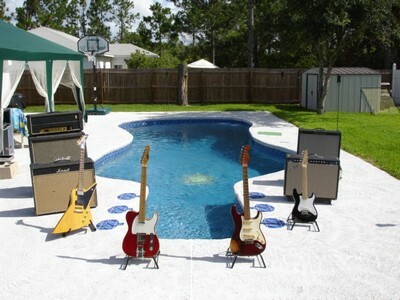 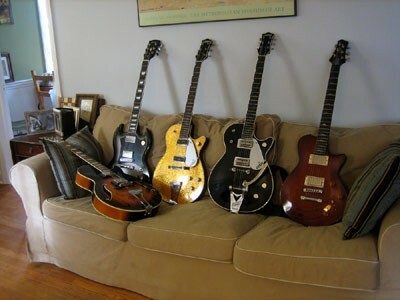 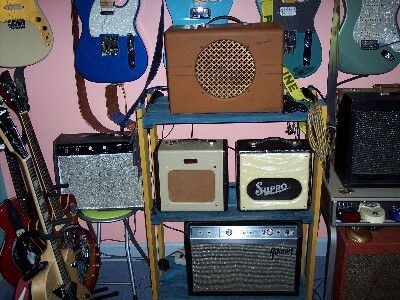 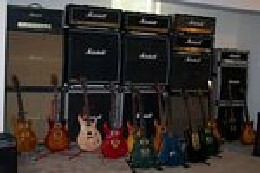 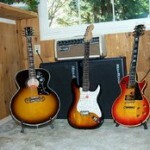 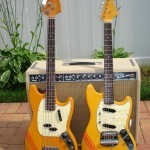 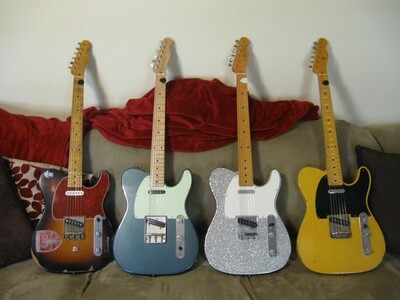 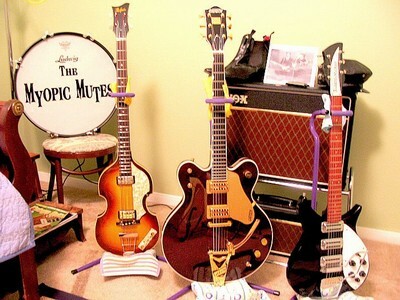 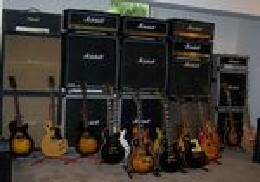 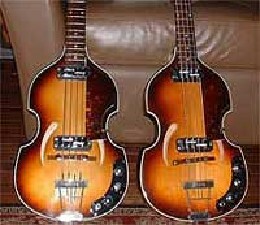 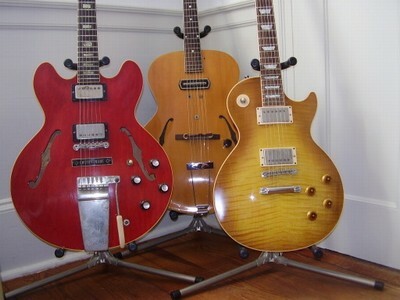 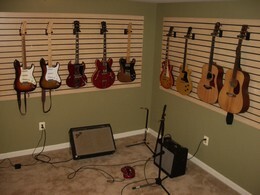 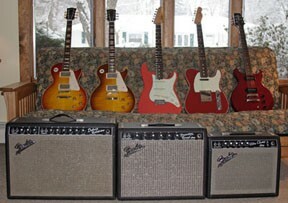 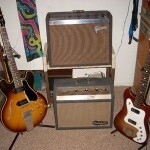 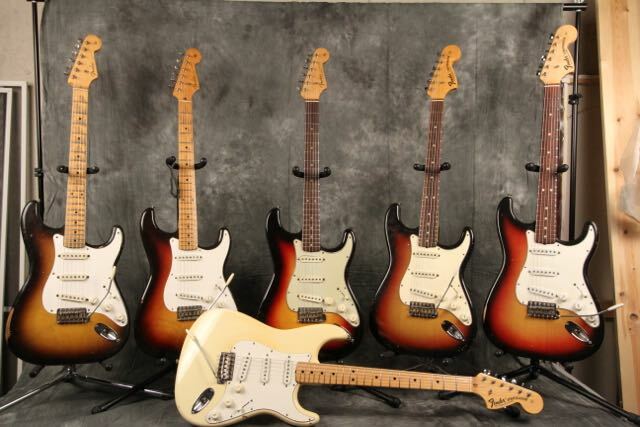 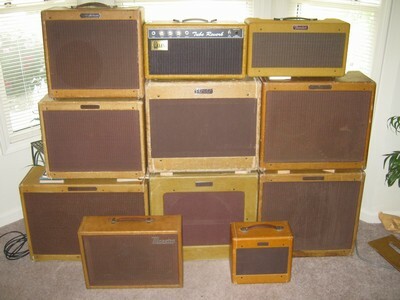 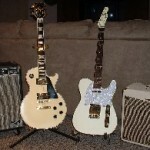 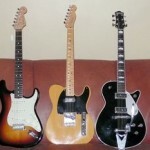 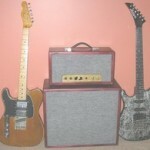 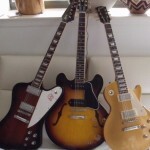 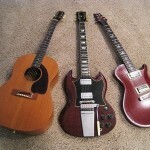 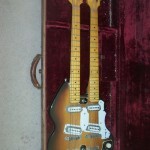 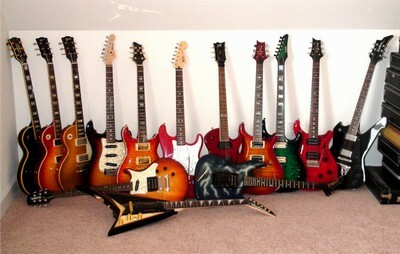 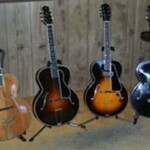 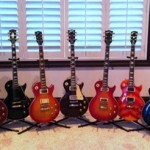 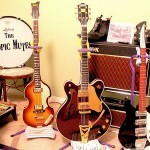 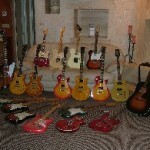 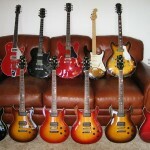 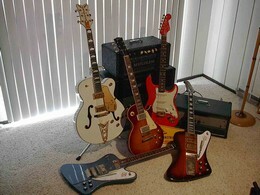 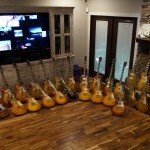 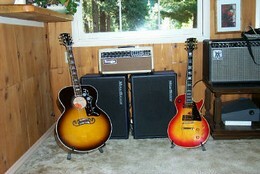 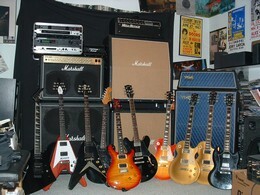 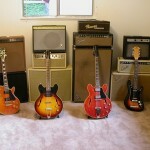 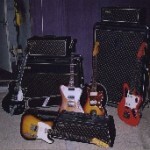 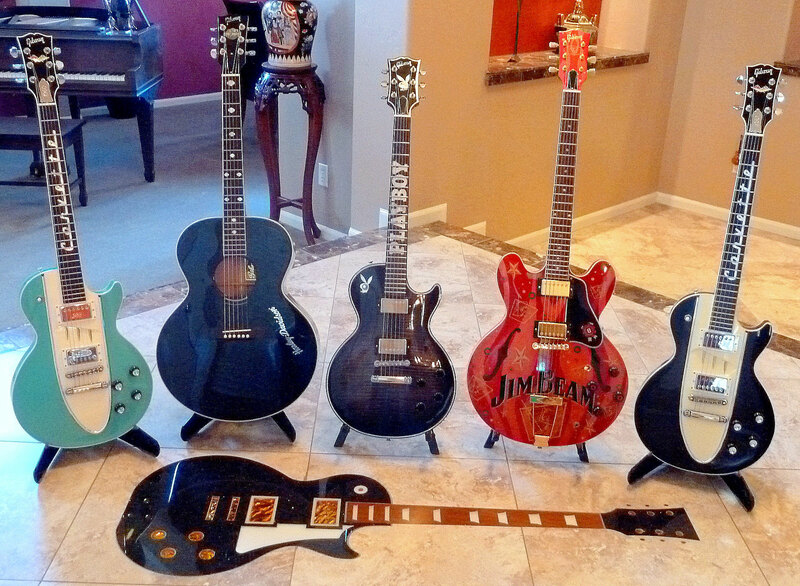 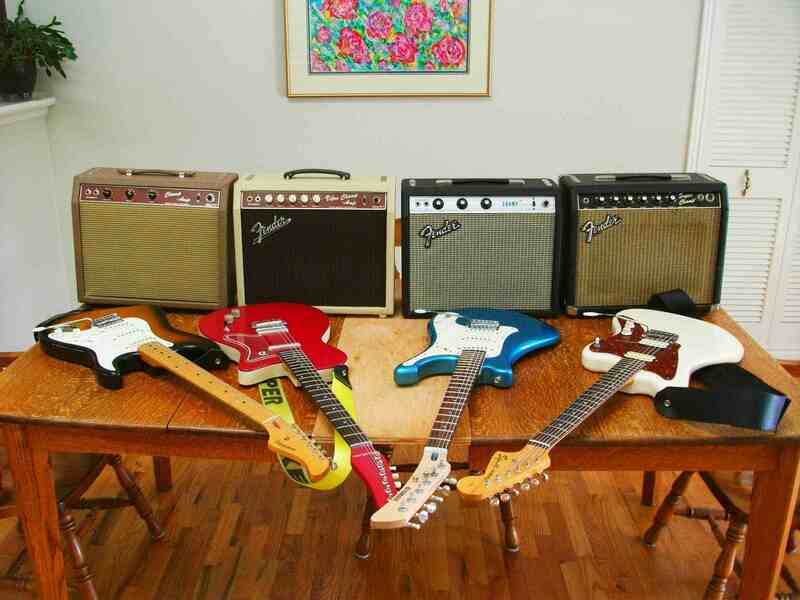 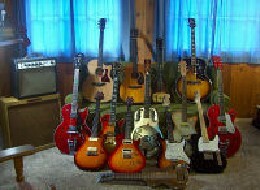 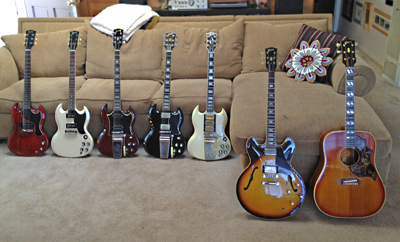 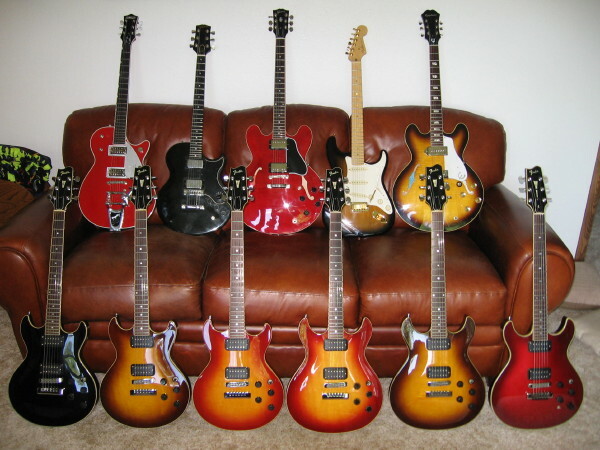 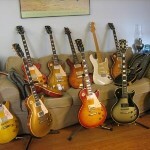 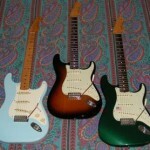 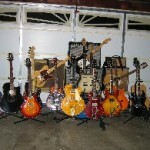 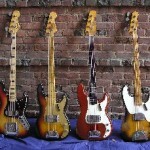 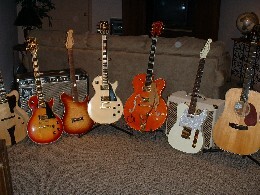 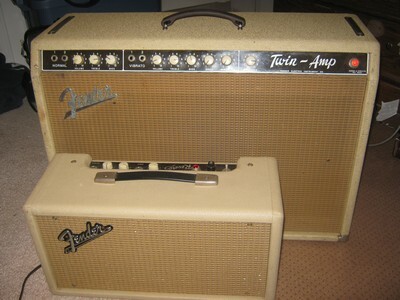 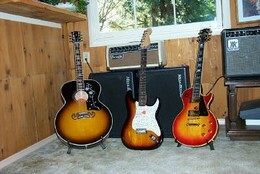 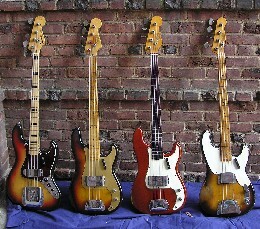 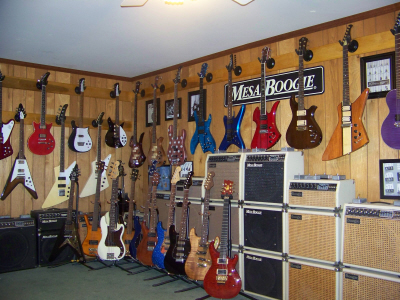 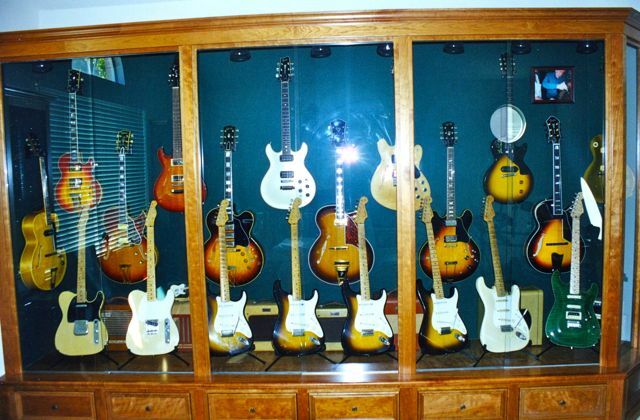 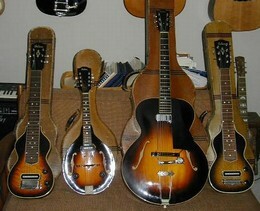 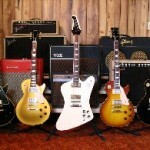 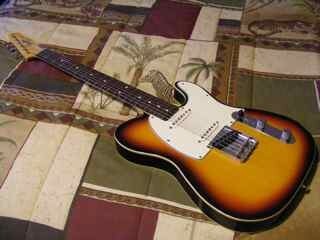 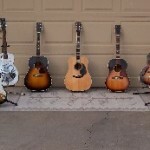 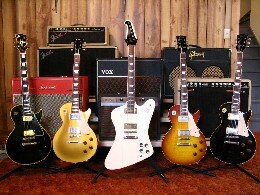 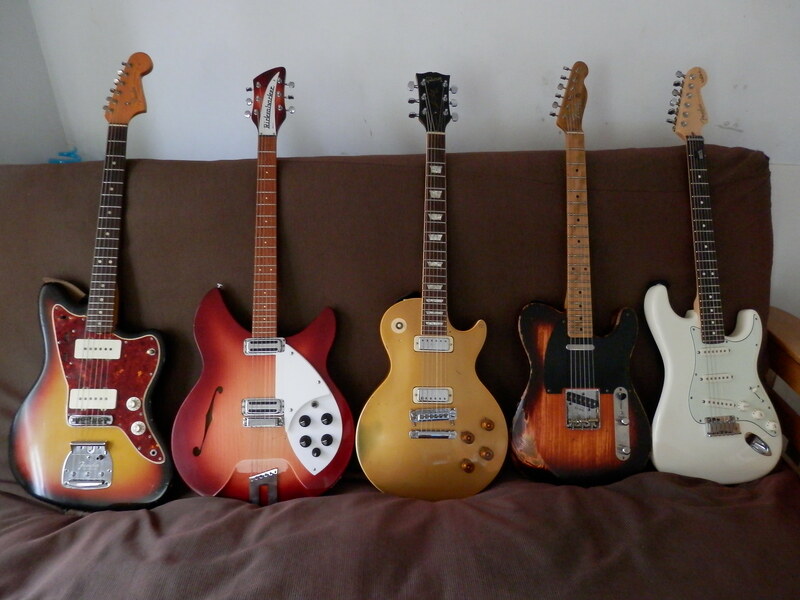 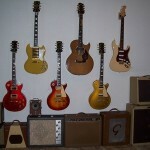 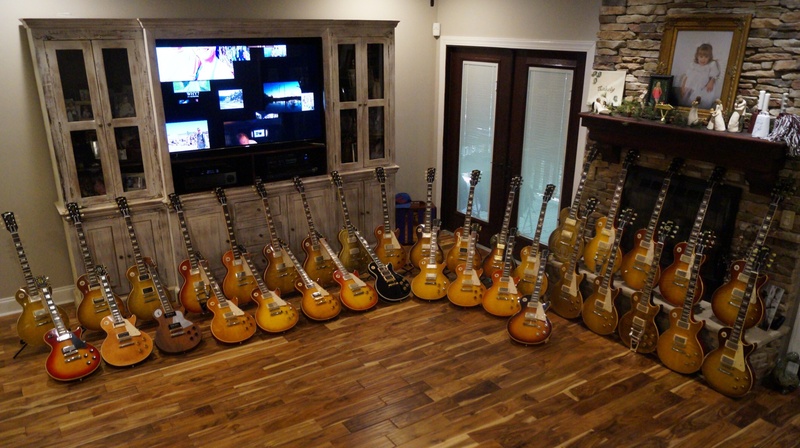 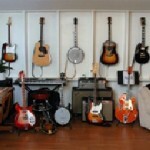 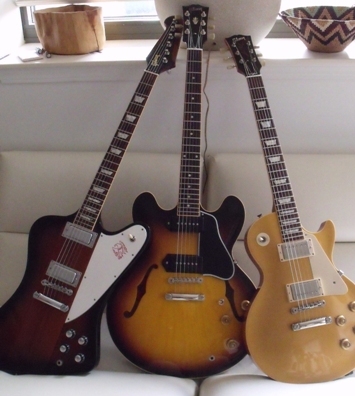 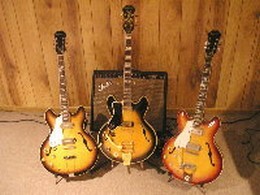 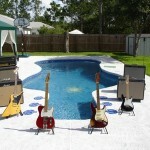 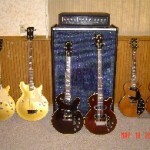 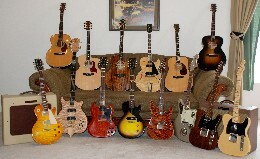 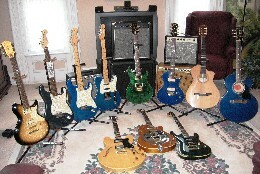 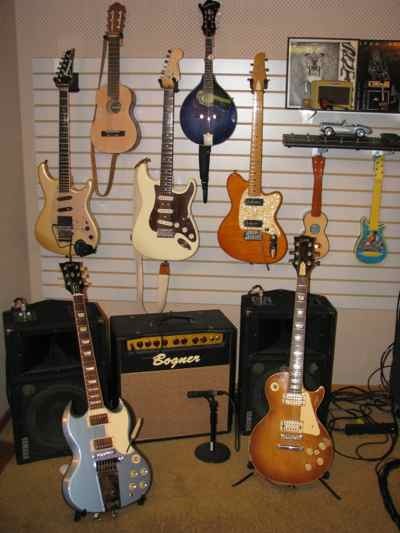 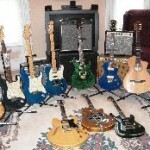 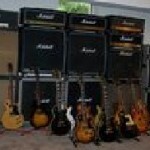 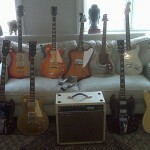 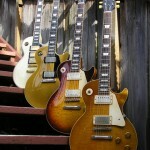 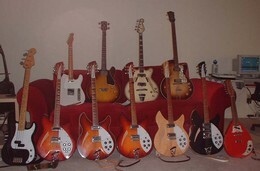 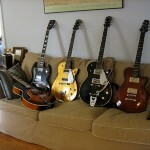 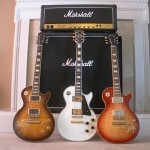 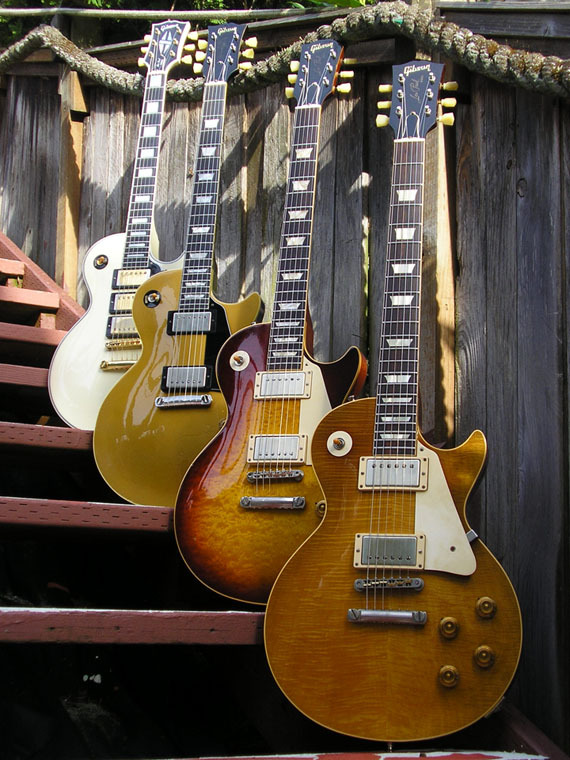 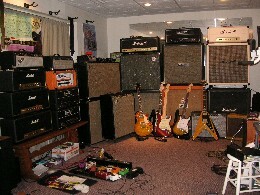 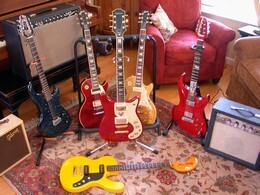 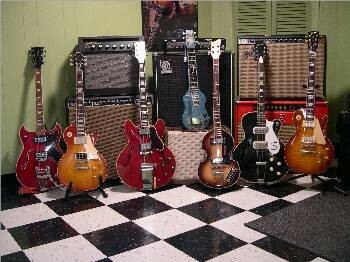 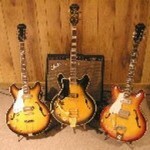 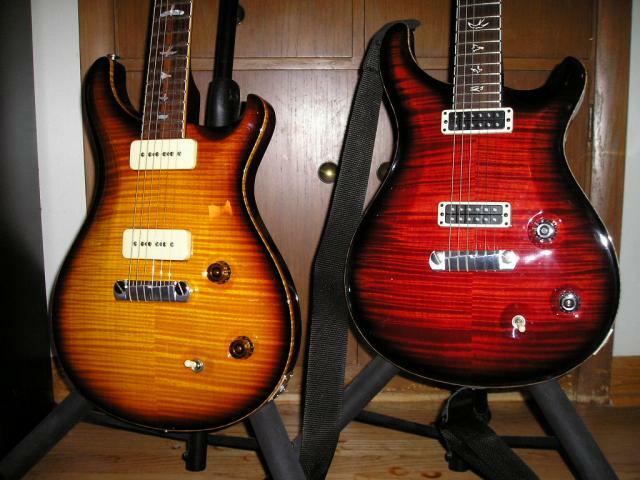 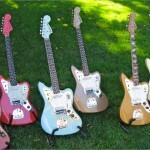 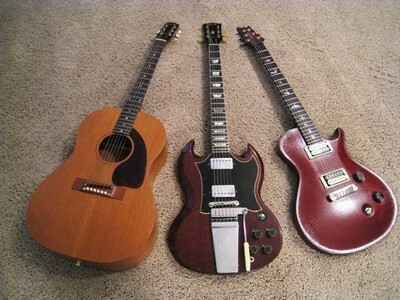 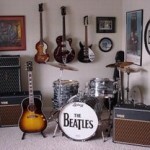 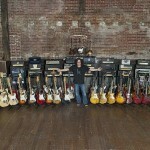 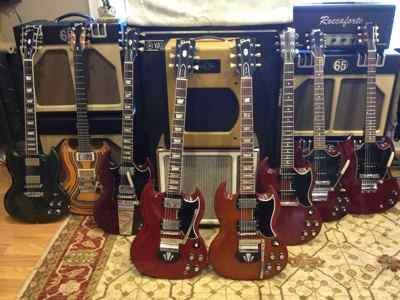 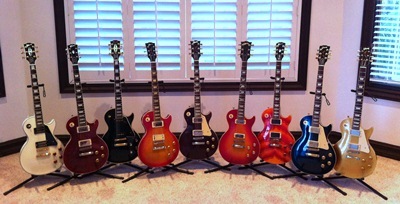 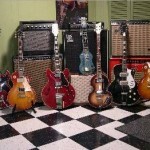 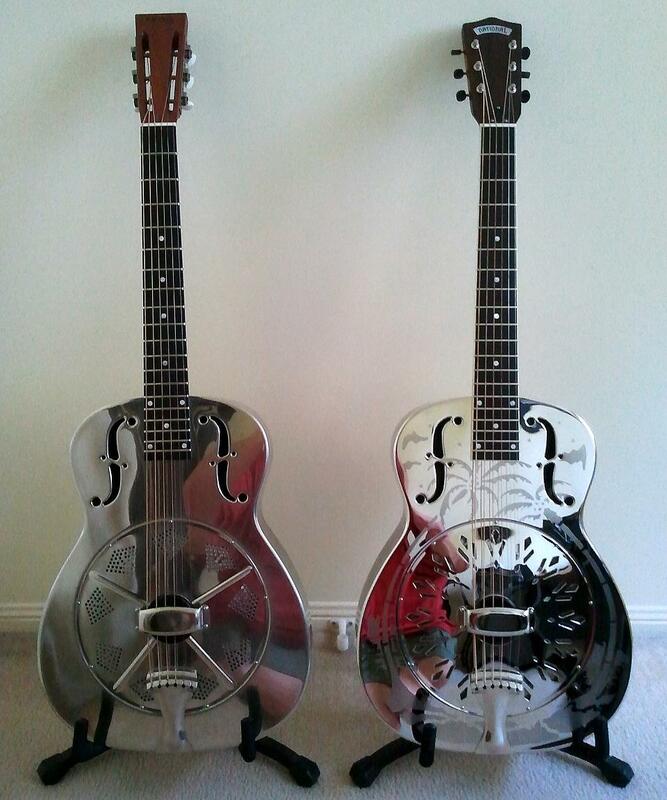 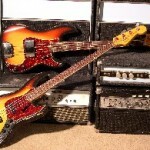 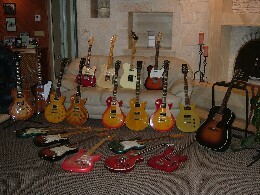 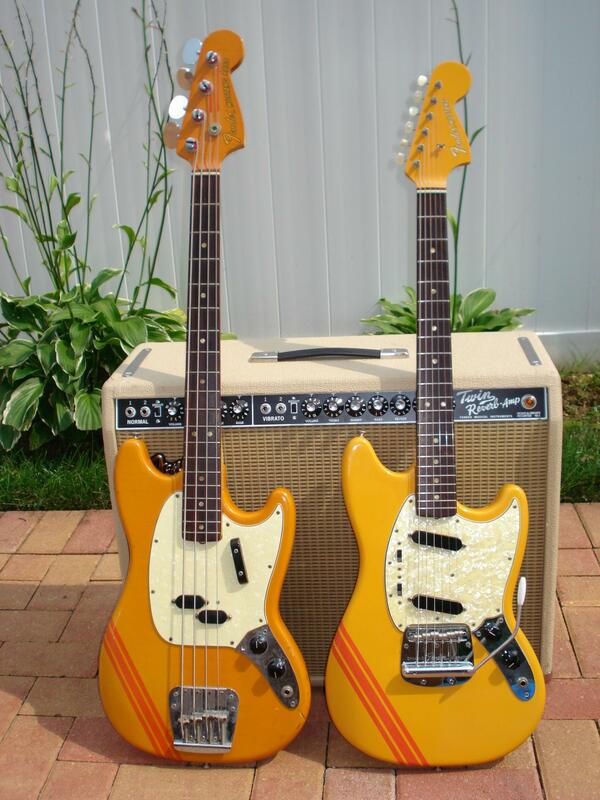 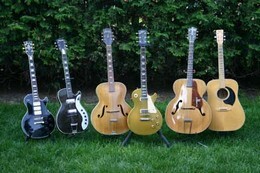 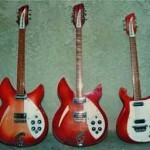 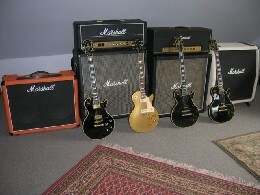 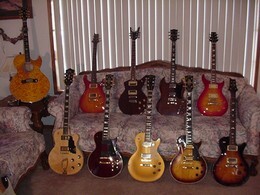 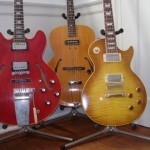 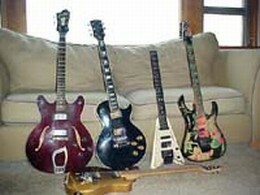 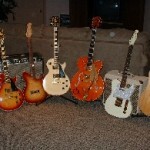 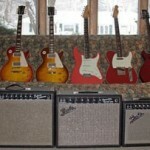 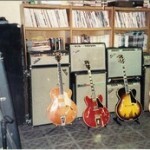 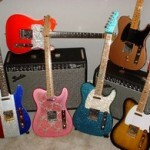 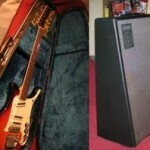 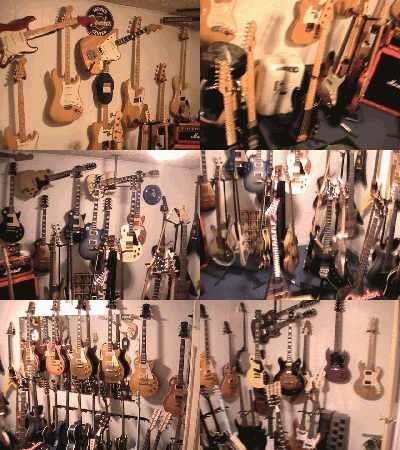 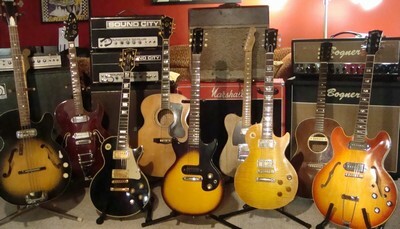 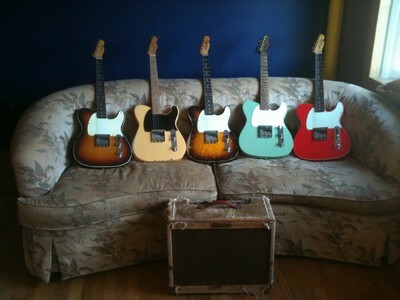 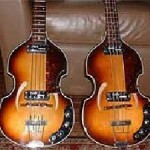 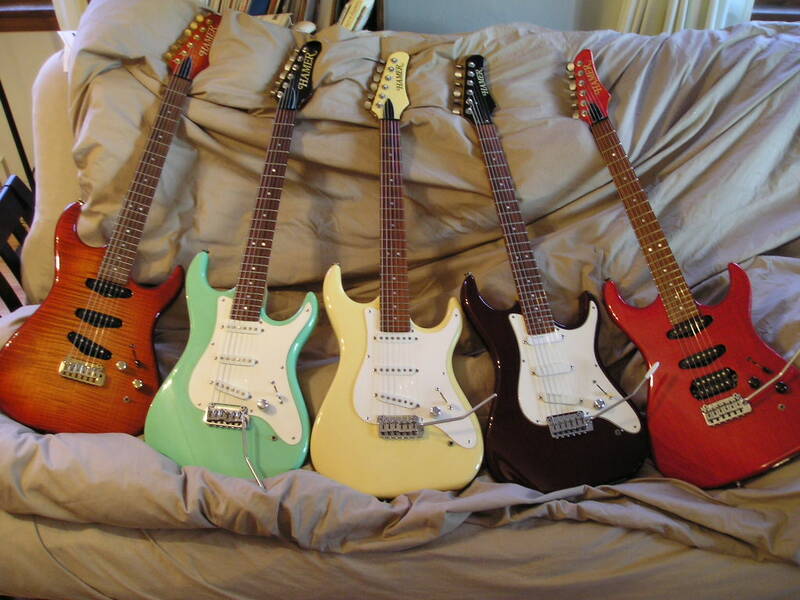 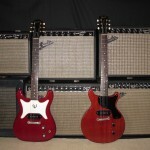 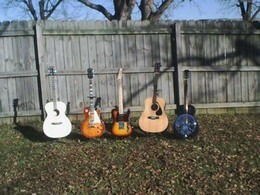 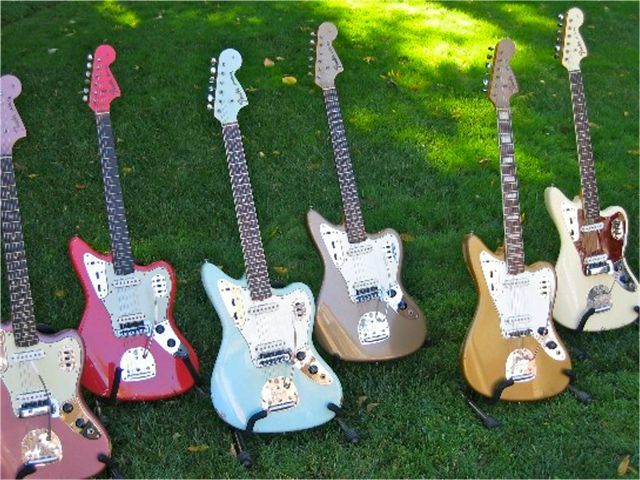 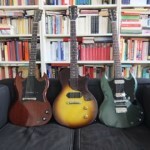 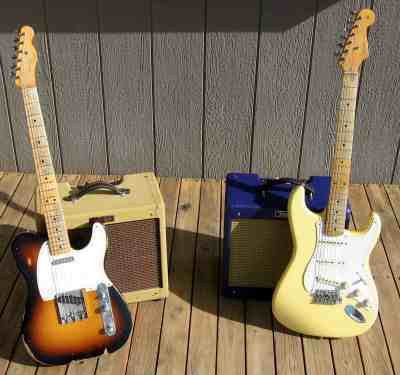 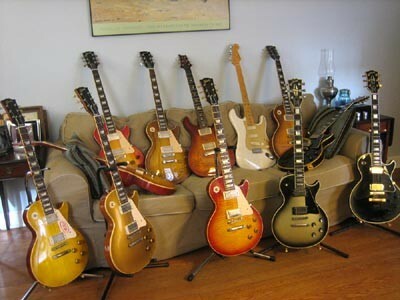 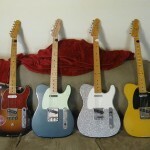 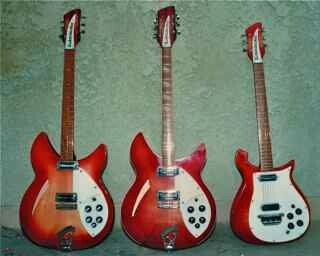 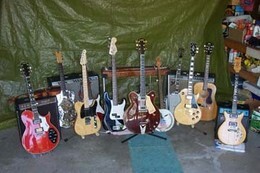 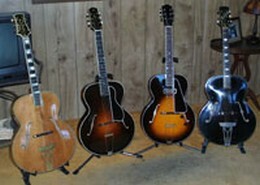 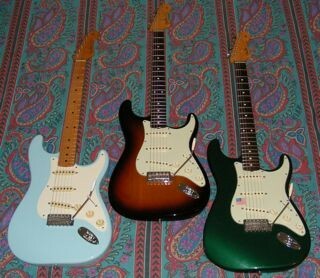 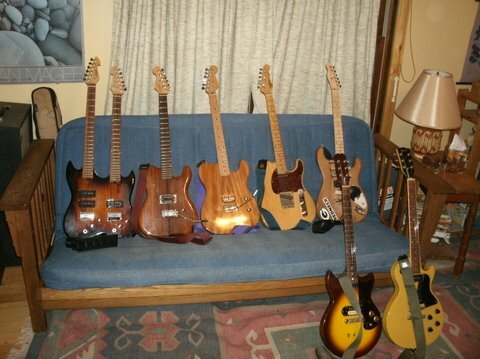 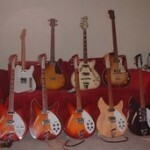 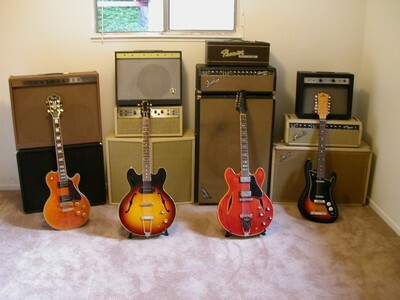 I’ll take one of each, in Sunburst! 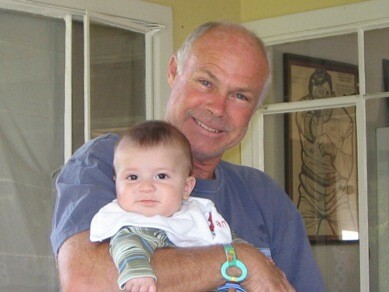 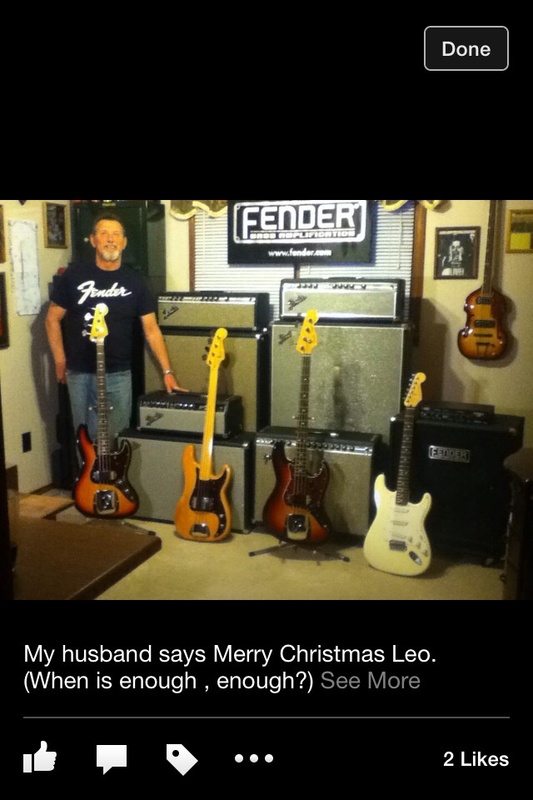 Lucky Son of a Gun! 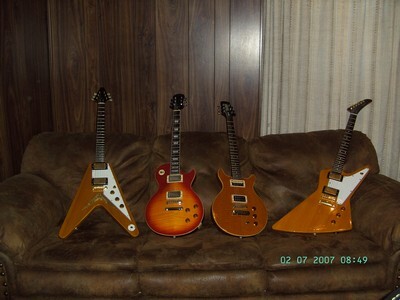 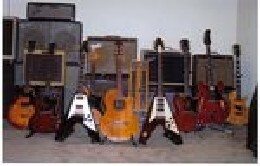 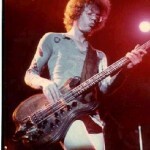 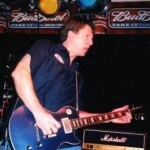 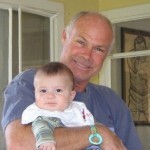 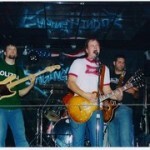 John Cain From VA. Beach VA.
Adamas and more Adamas, forever! 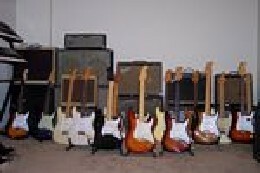 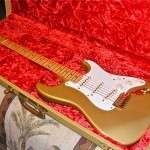 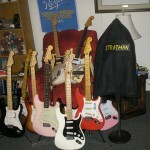 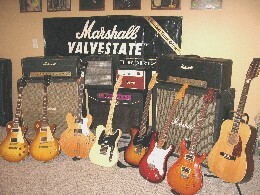 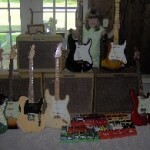 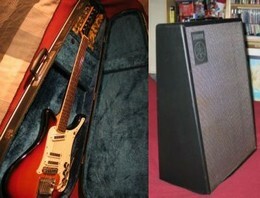 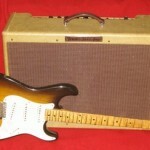 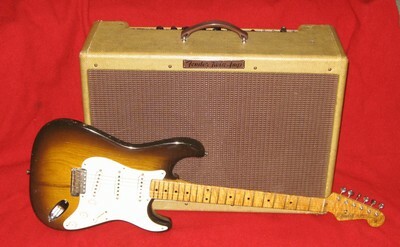 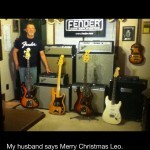 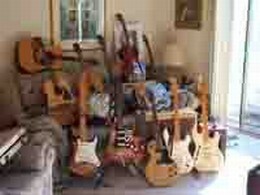 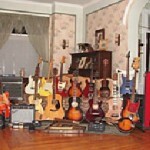 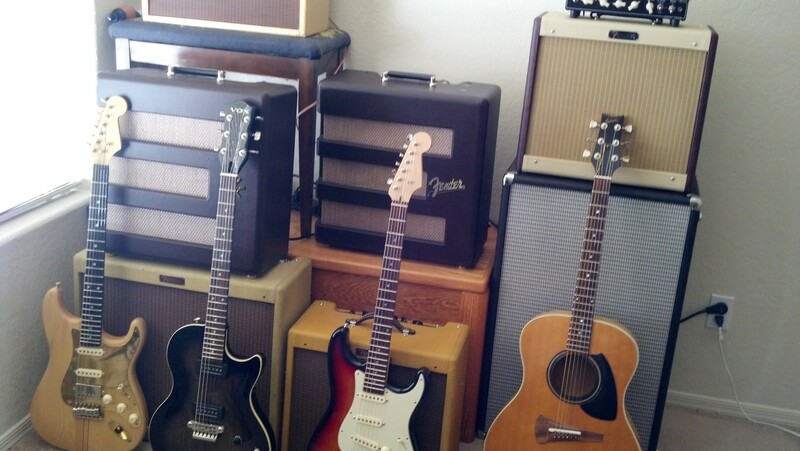 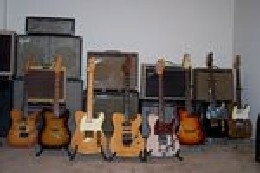 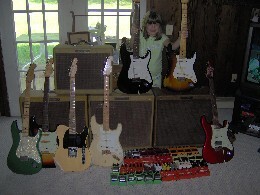 Abbey w/1958 and 1961 Strat, Tyler, Victoria, Masterbuilt Relics, etc! 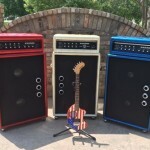 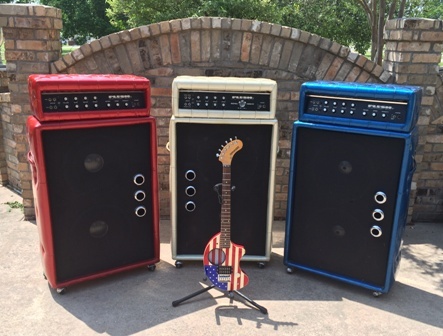 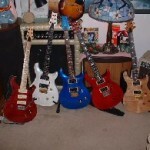 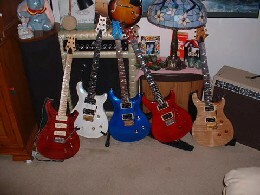 A Royal Flush of Plush – Red, White and Blue. 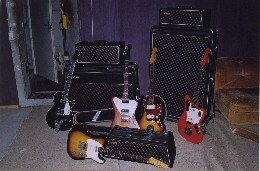 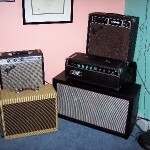 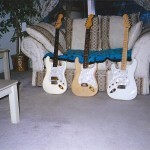 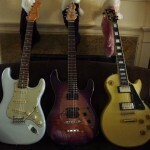 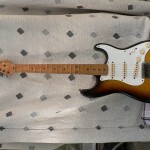 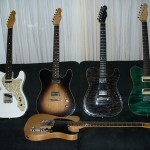 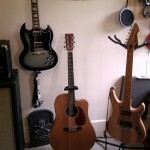 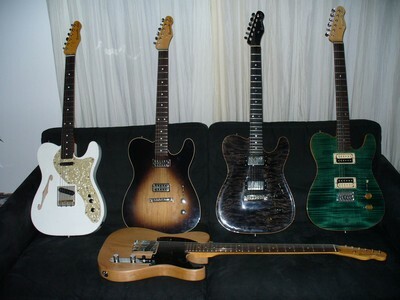 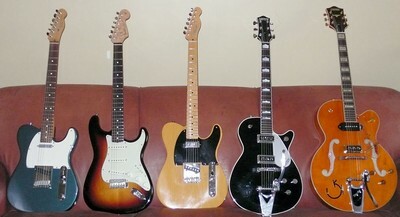 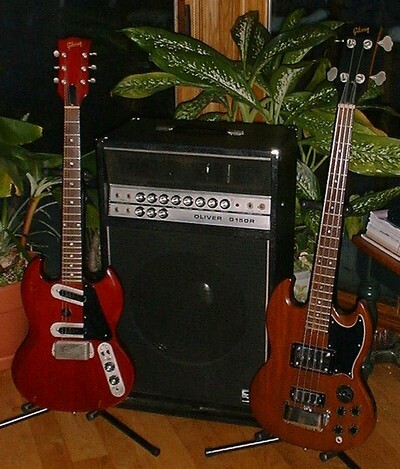 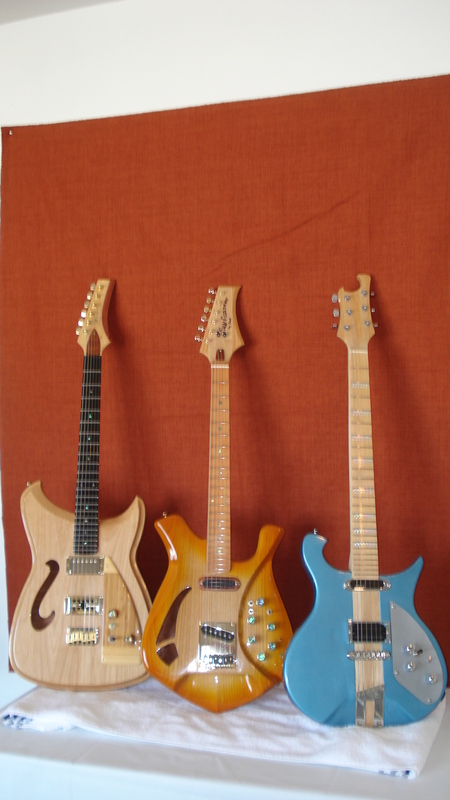 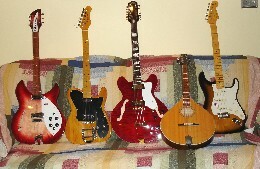 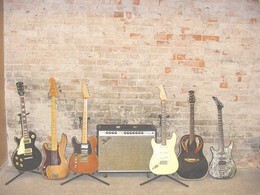 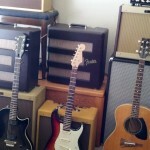 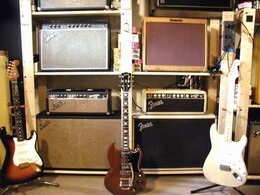 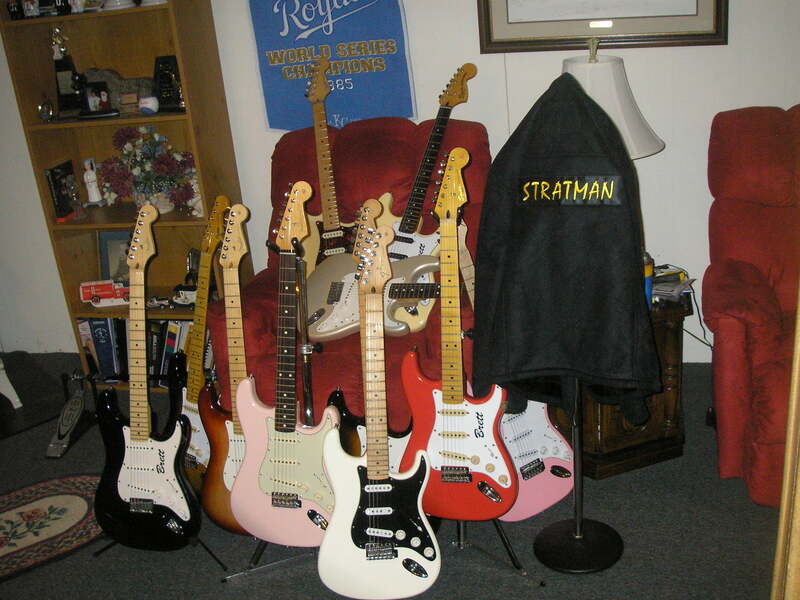 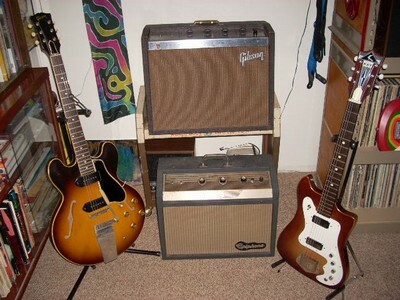 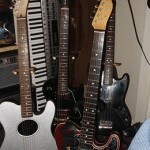 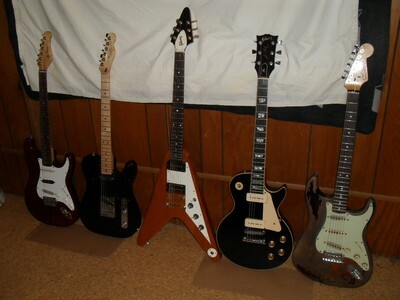 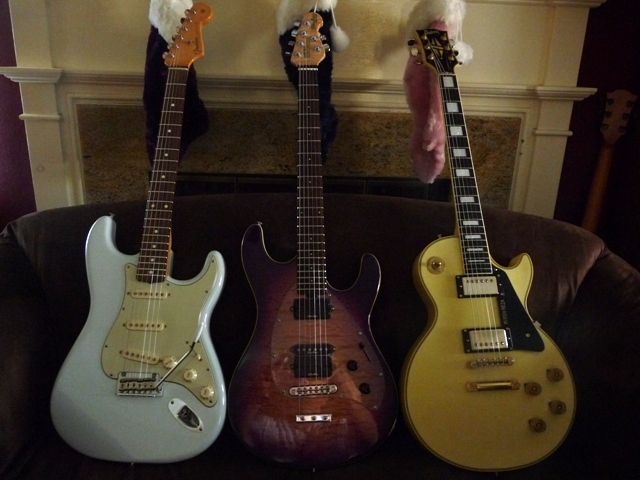 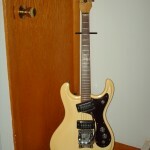 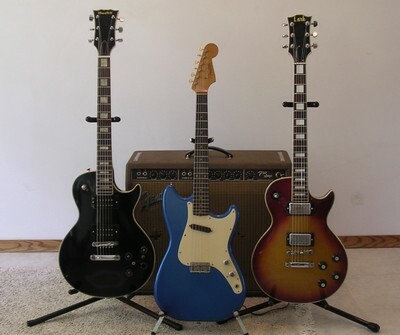 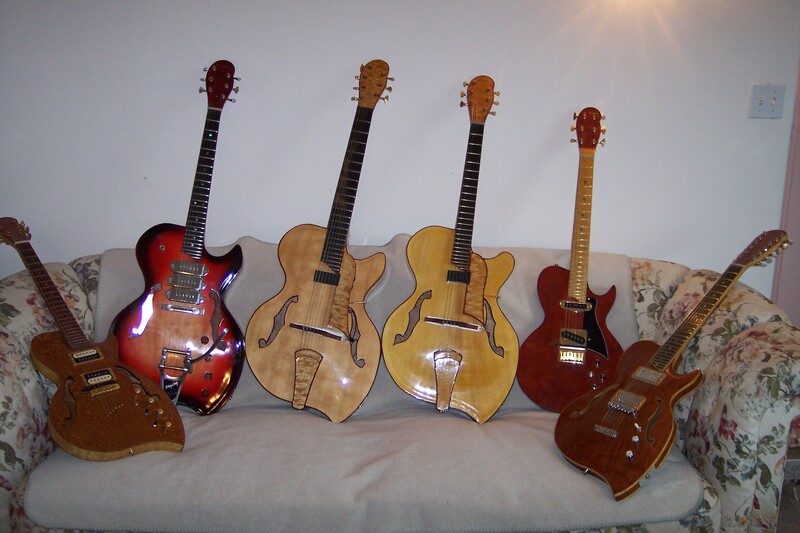 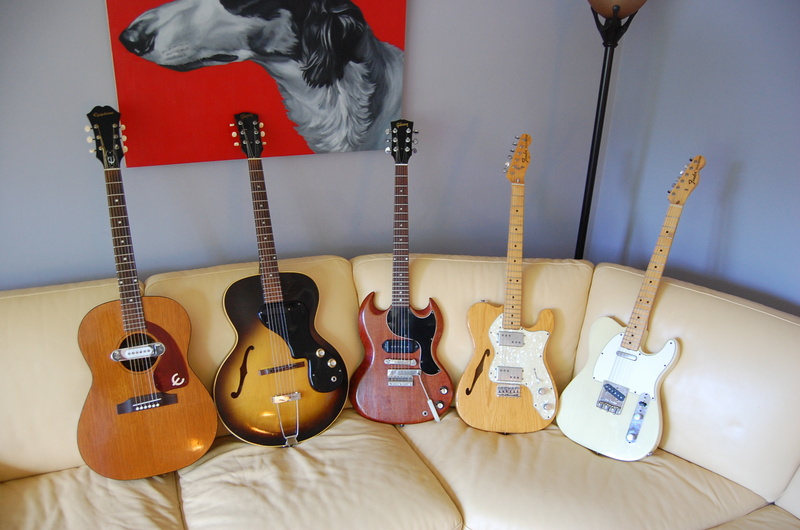 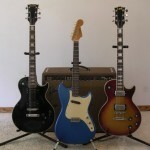 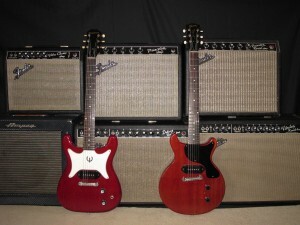 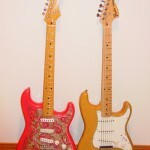 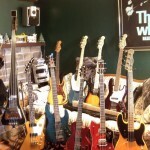 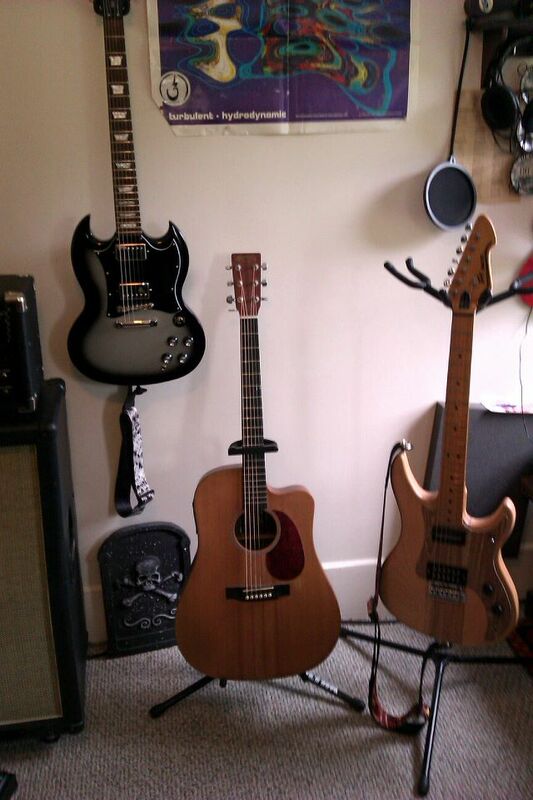 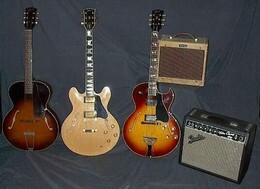 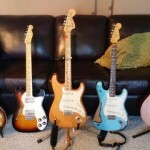 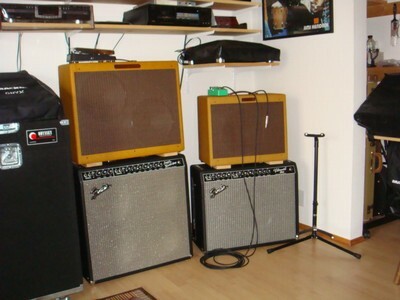 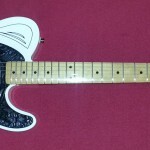 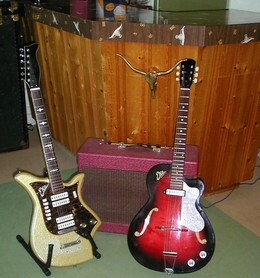 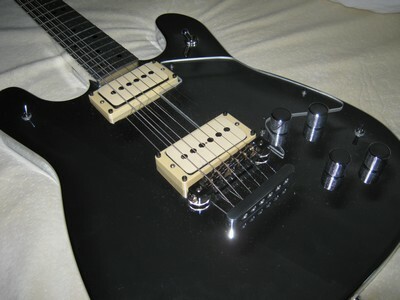 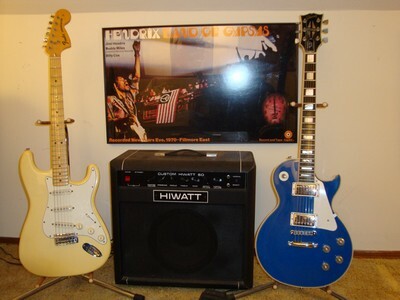 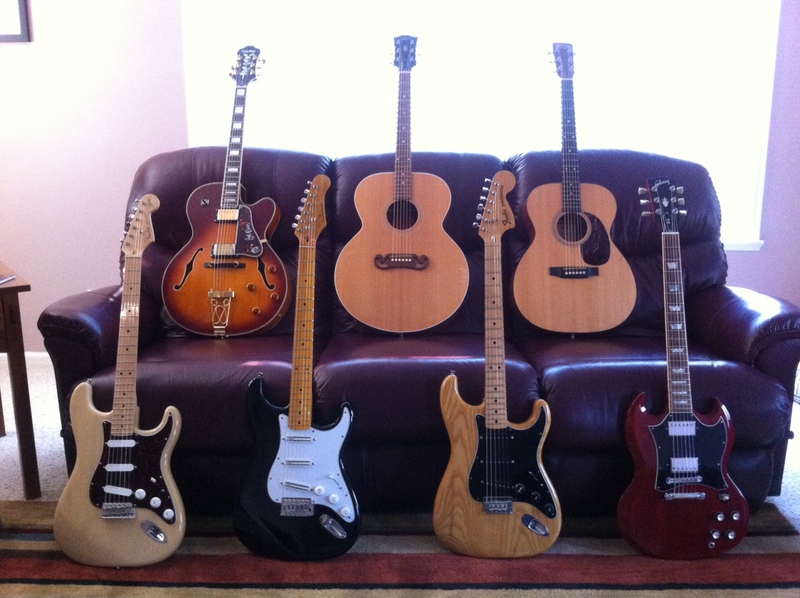 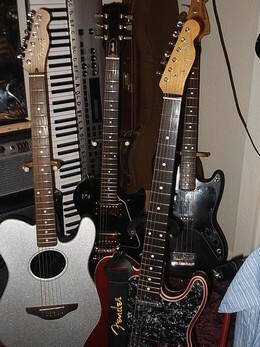 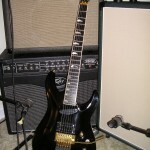 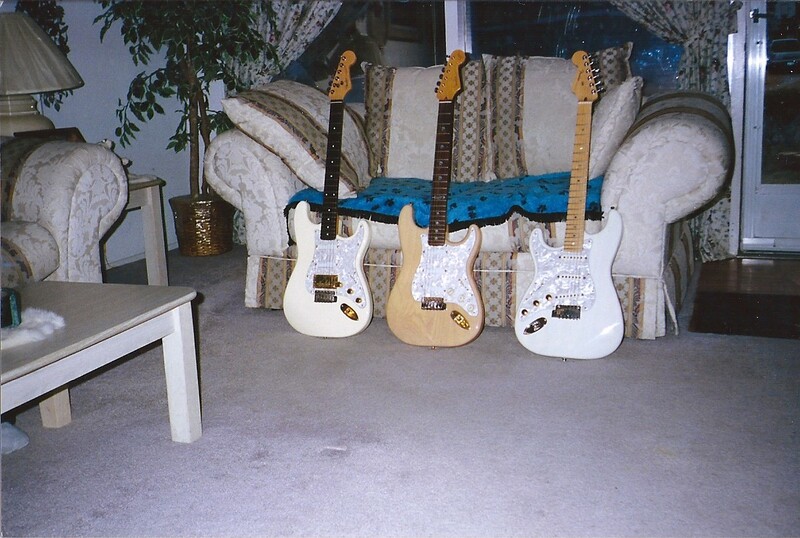 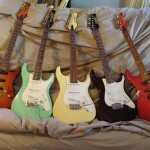 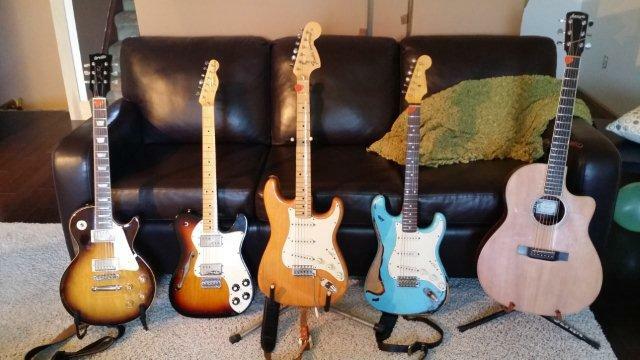 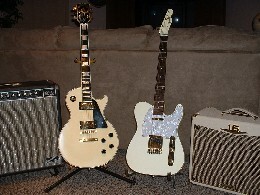 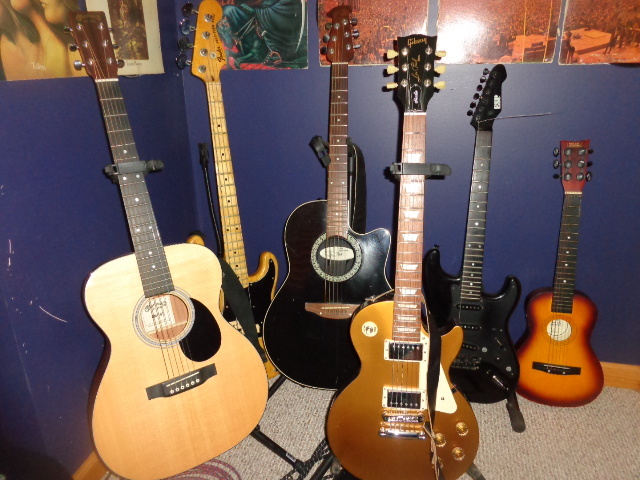 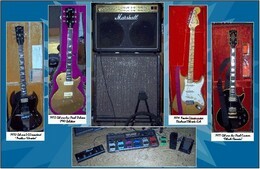 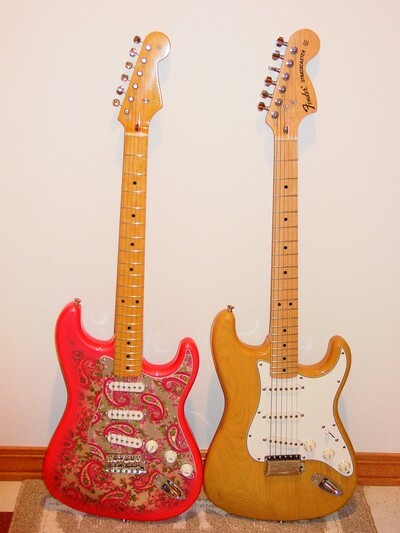 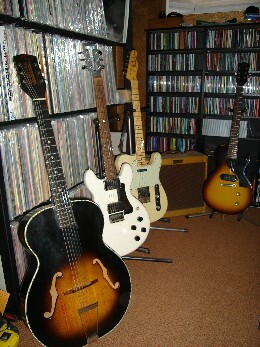 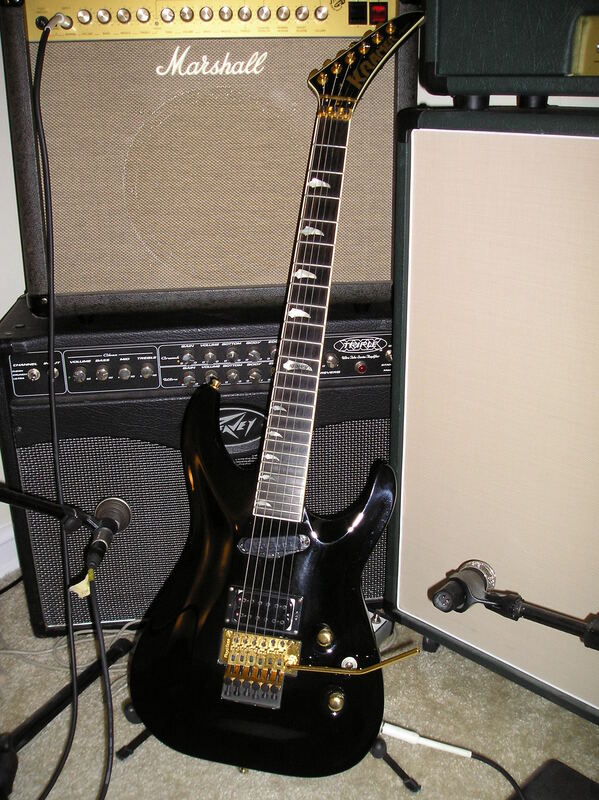 TOP – 84 Ibanez Pro Line,87 American Standard Strat with custom rosewood pick guard, 86 Ibanez Talman, – BOTTOM -2012 Tweedy SG, 1969 LP Delexe/conversion. 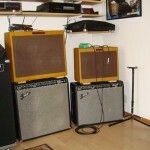 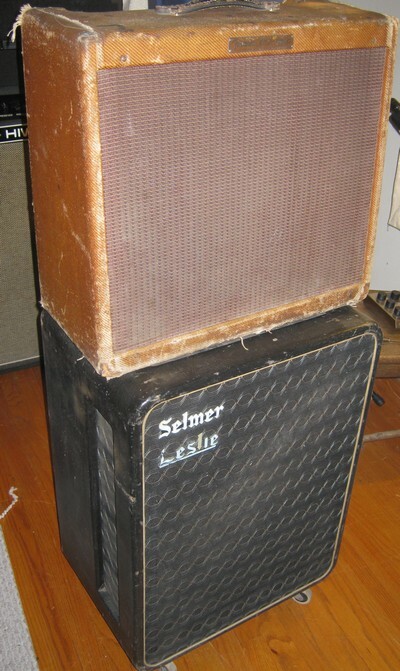 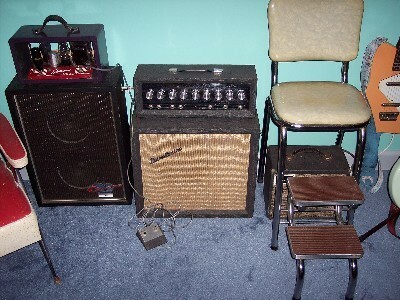 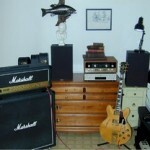 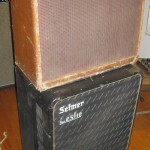 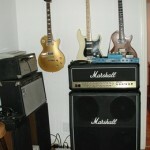 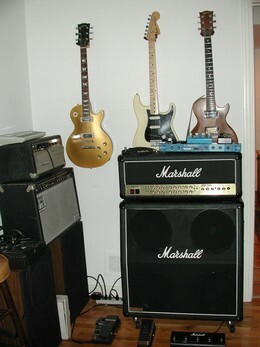 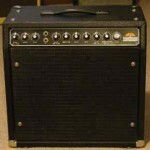 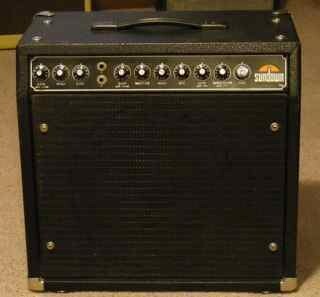 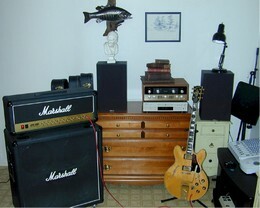 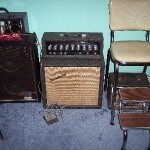 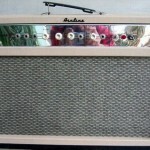 AMPS -Bogner Duende-mono, Custom Rack with Crown DC 300 and two Yammaha SM12s for stereo. 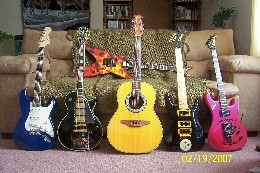 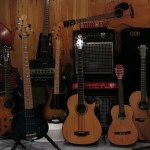 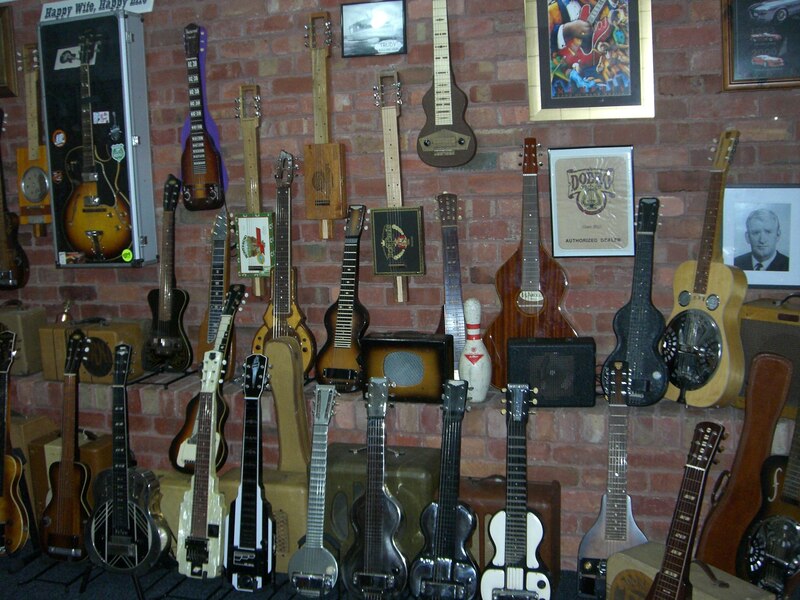 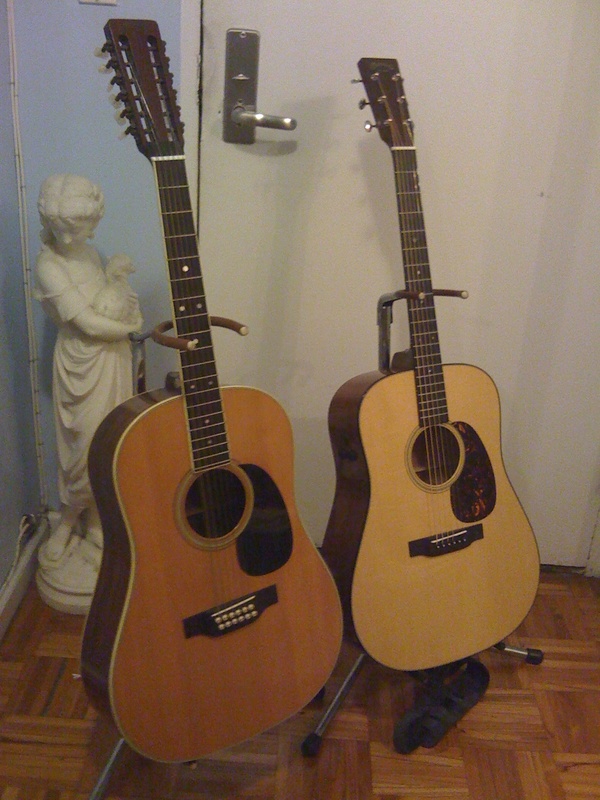 LITTLE GUYS UP TOP- Yamaha Guitilele and Washburn Mando. 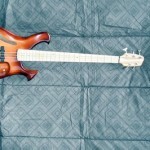 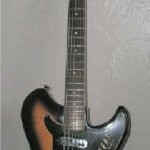 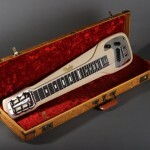 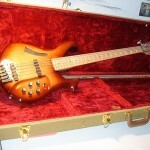 TOP – Schecter Diamond Elite 12 string, Schecter Diamond Elite 5 string bass. 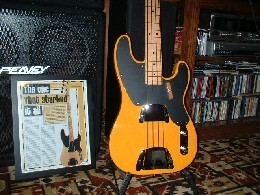 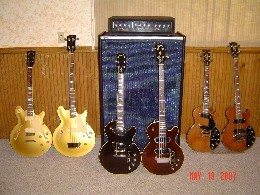 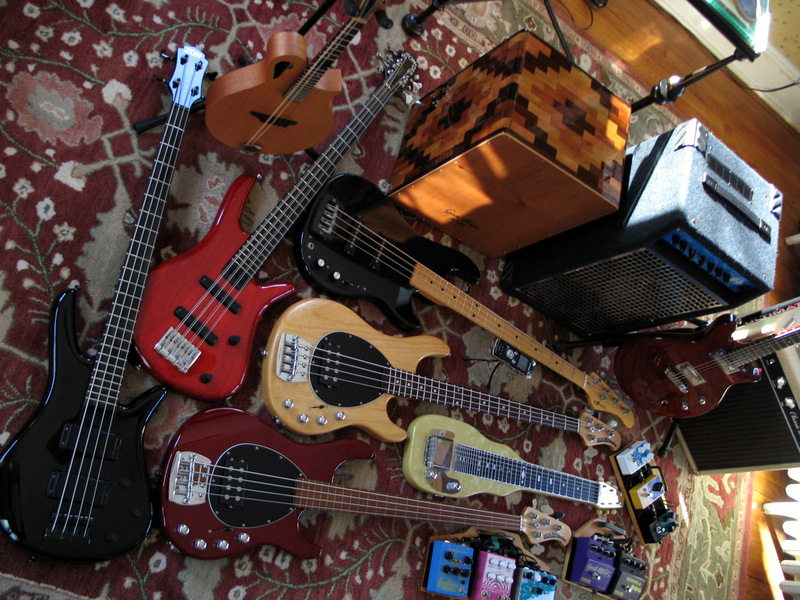 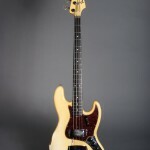 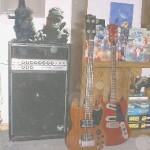 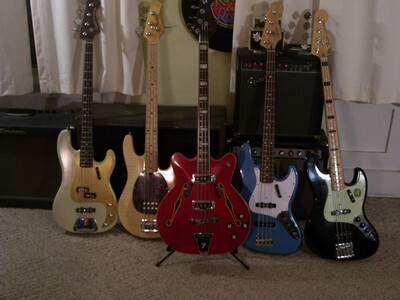 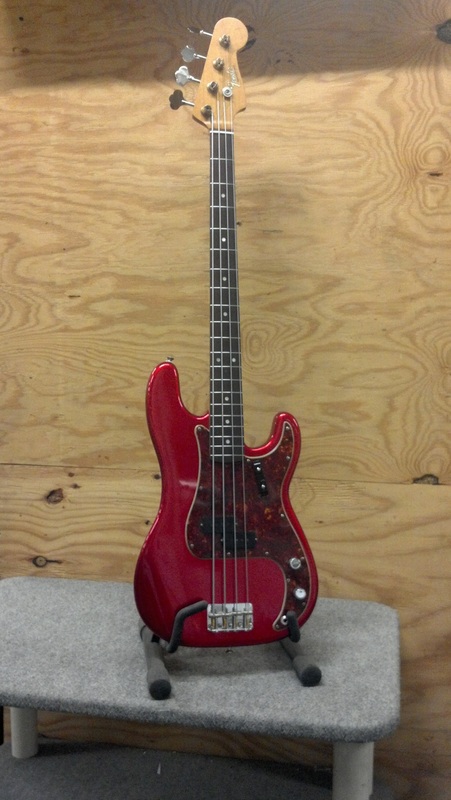 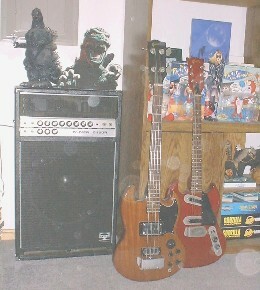 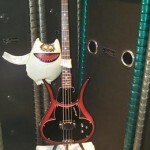 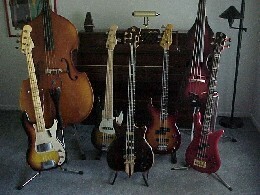 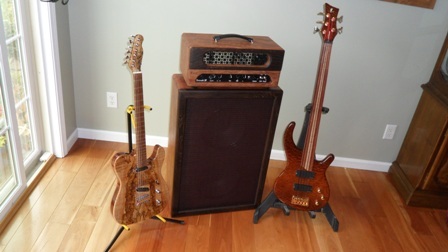 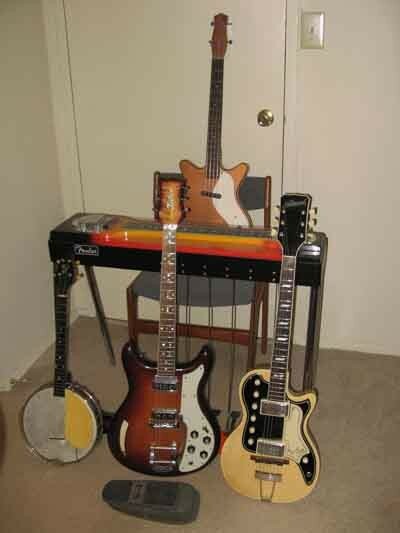 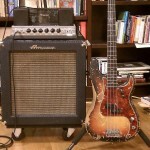 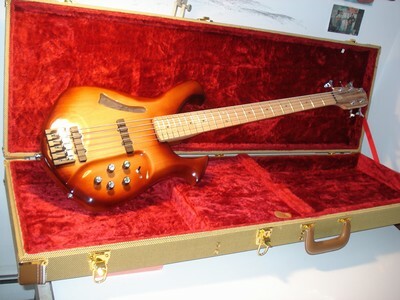 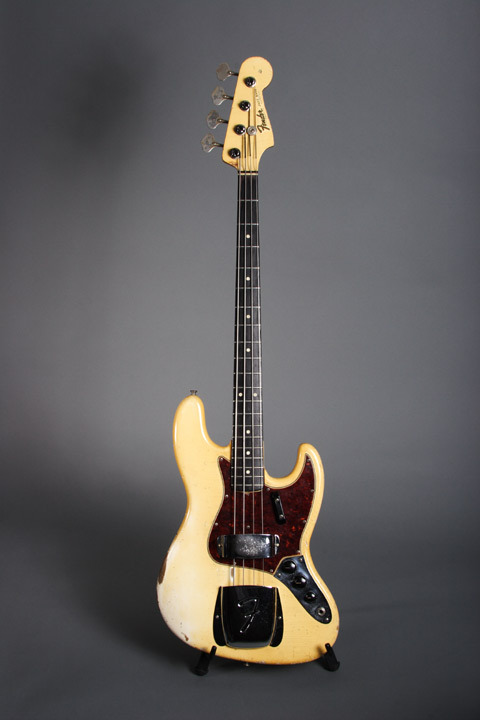 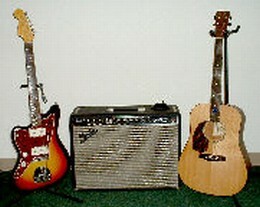 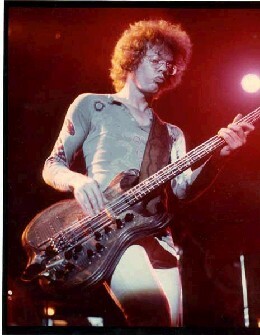 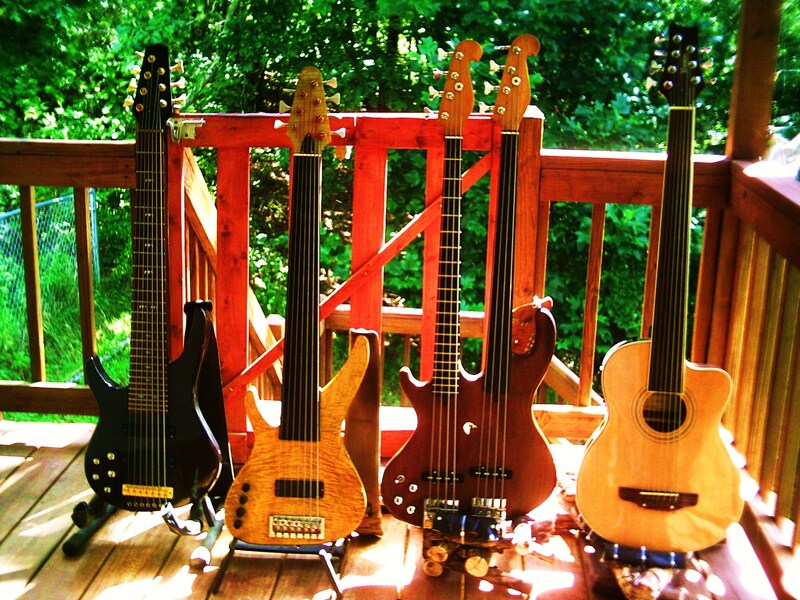 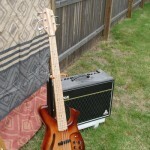 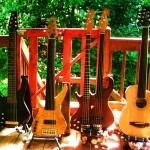 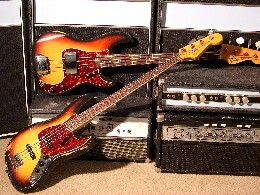 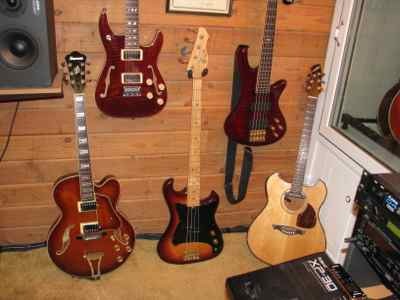 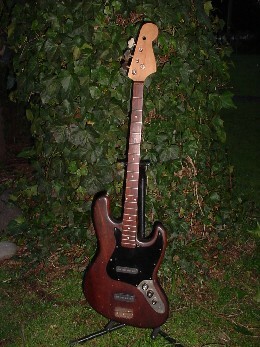 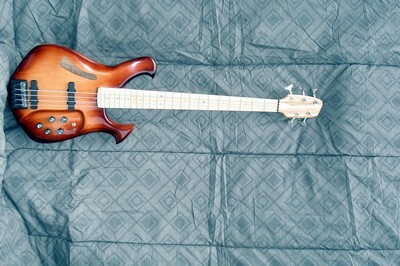 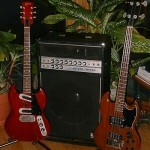 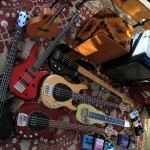 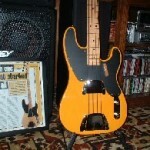 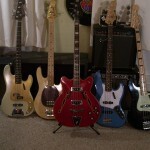 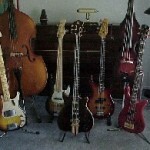 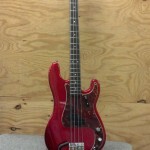 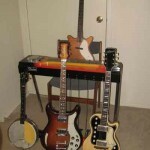 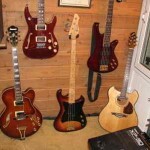 BOTTOM – Ibanez 2002 Artcore arch top, 1980 Electra Phoenix bass, 2005 Wechter Pathmaker Lacewood. 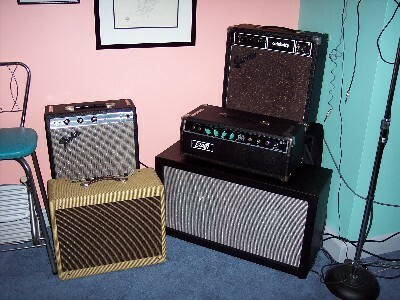 LITTLE GUYS UP TOP- Raisin Band! 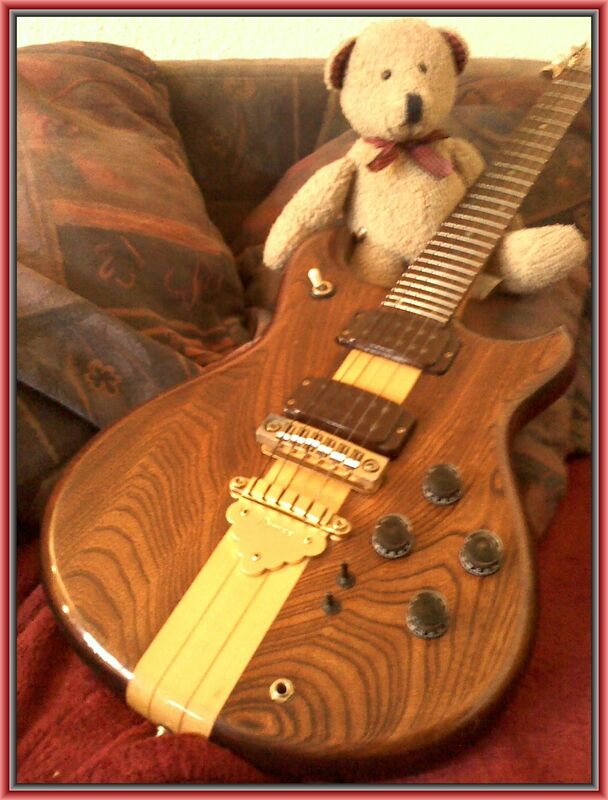 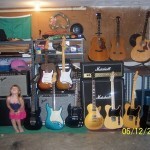 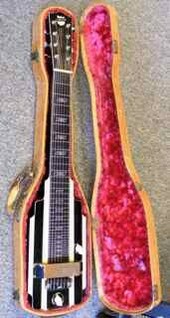 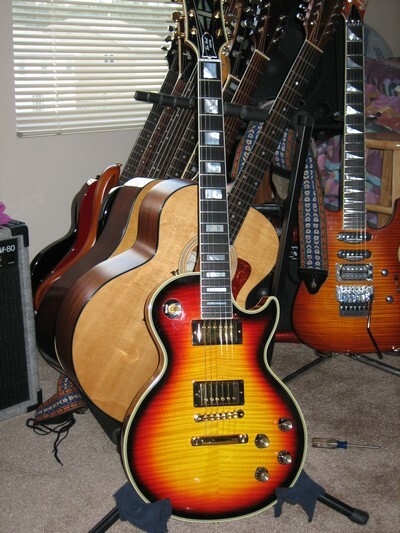 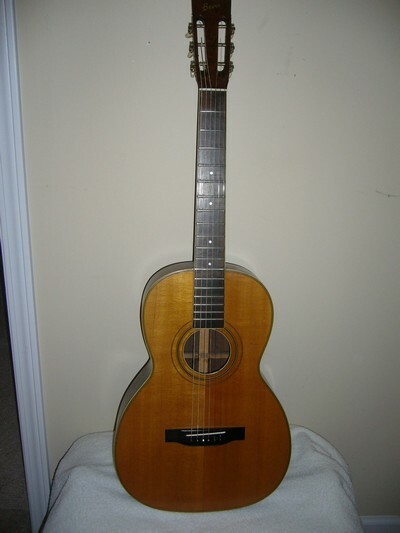 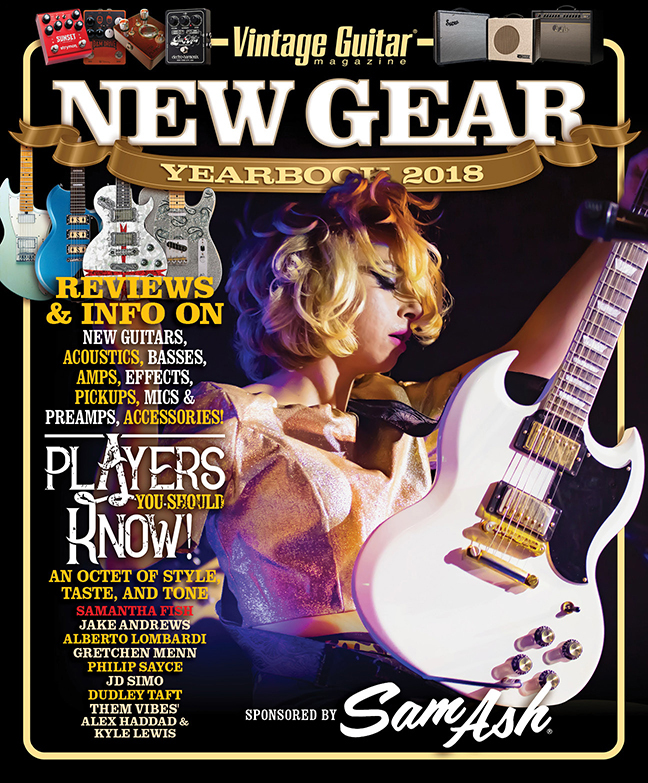 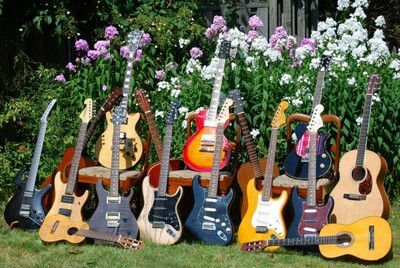 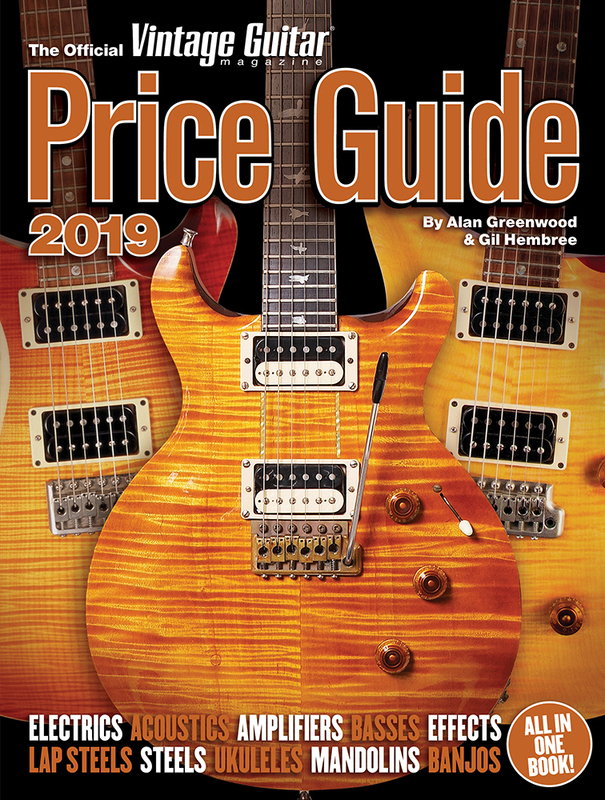 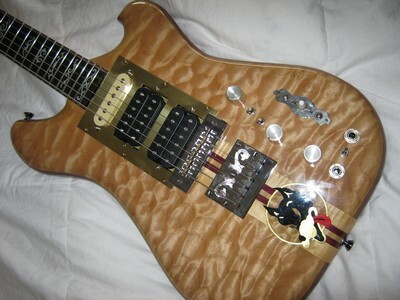 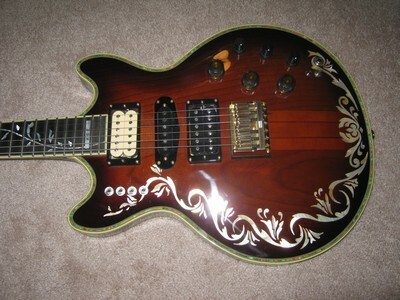 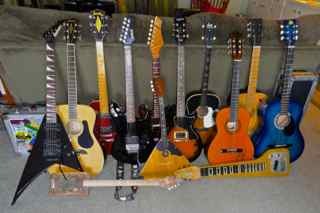 Description: My 3yr old granddaughter & I always love to look at all the beautiful guitars in your great mag & while looking at the Father’s Day issue she said ” Pops why can’t we put my guitars in the book? 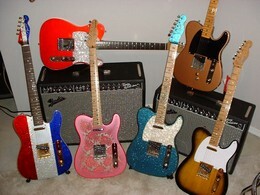 Their beautiful too? 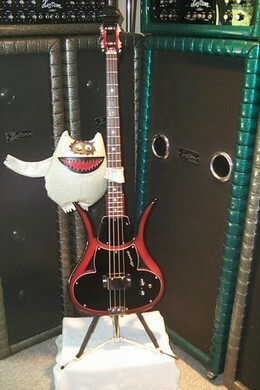 After a second I thought ” why not? 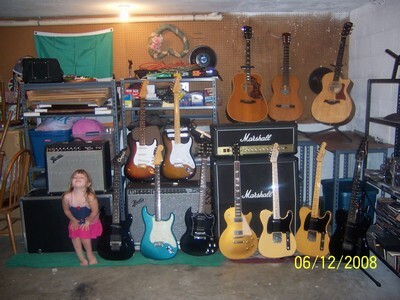 ” she has her own collection of 29 ! 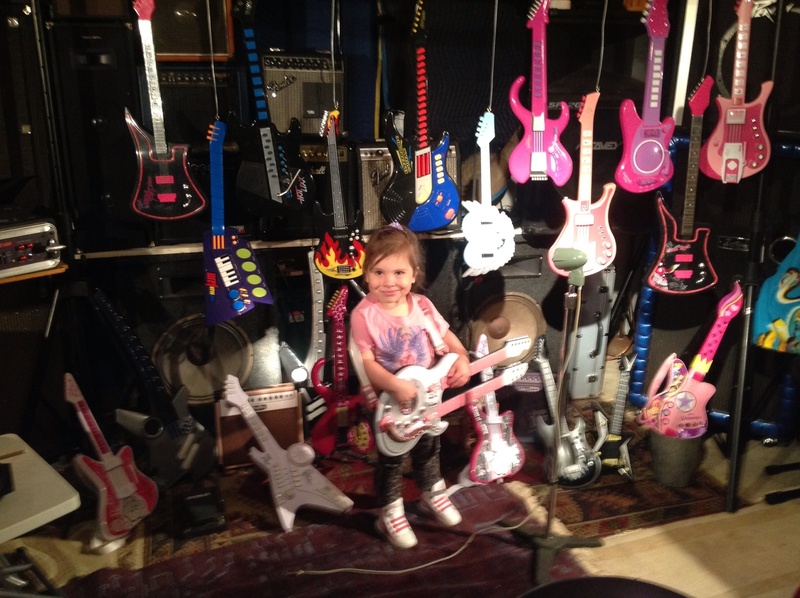 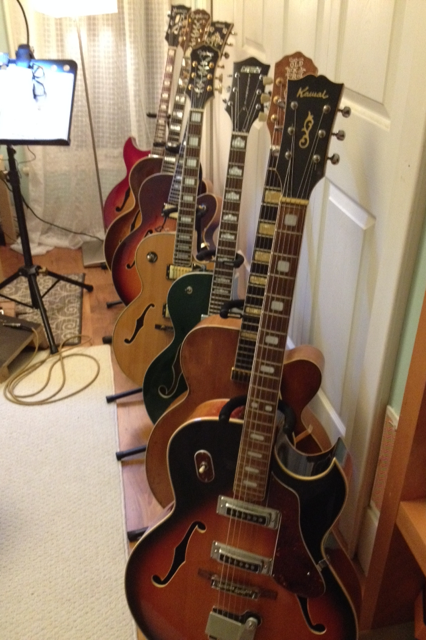 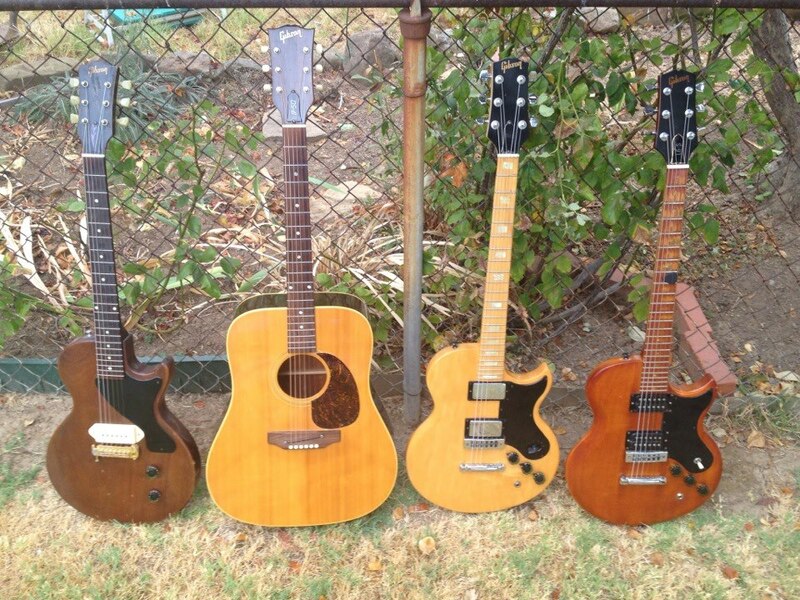 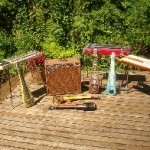 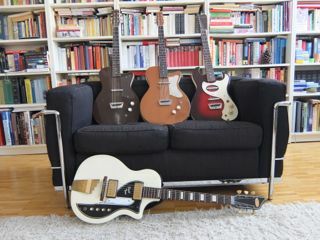 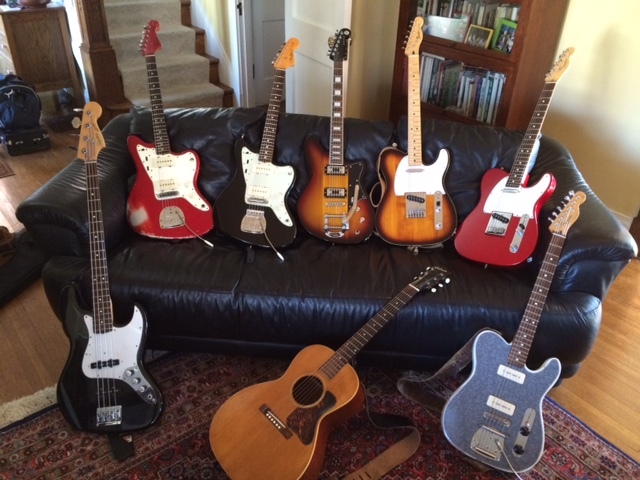 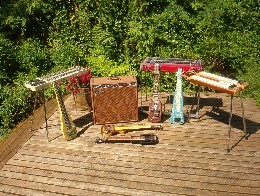 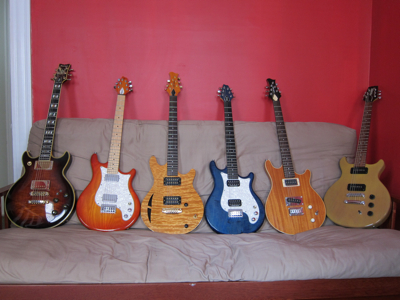 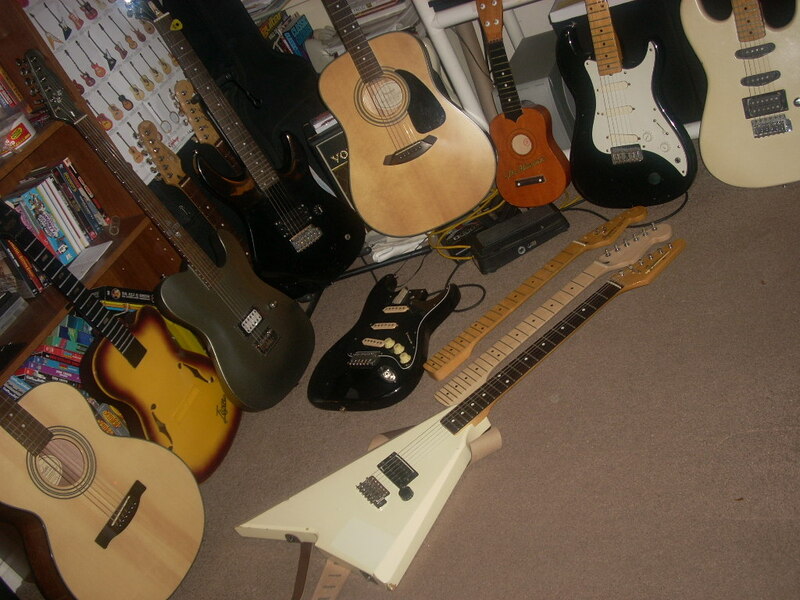 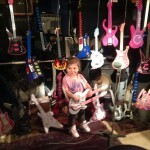 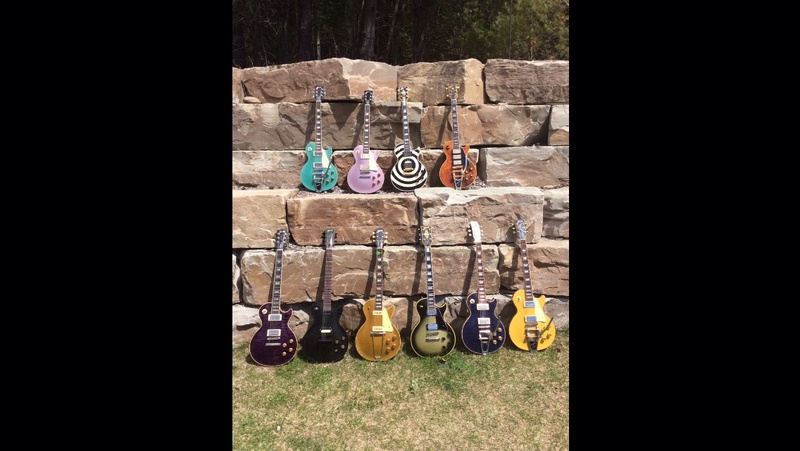 So here is my granddaughter SUNDAY ROSE ROBINSON ‘s collection ,all in perfect working condition…..3years old!